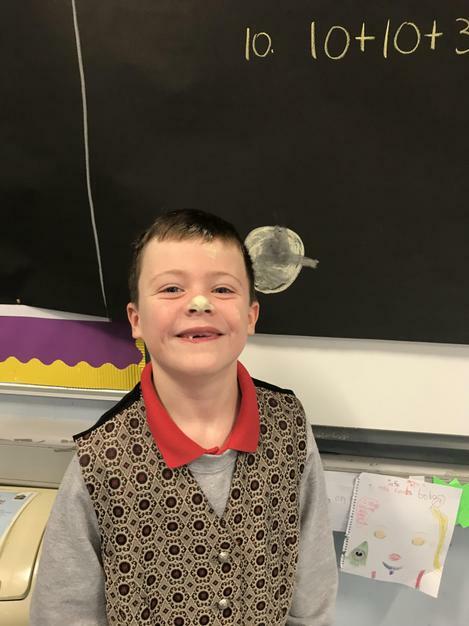 Going back in time....We had lots of fun today when we stepped back in time to 1969. 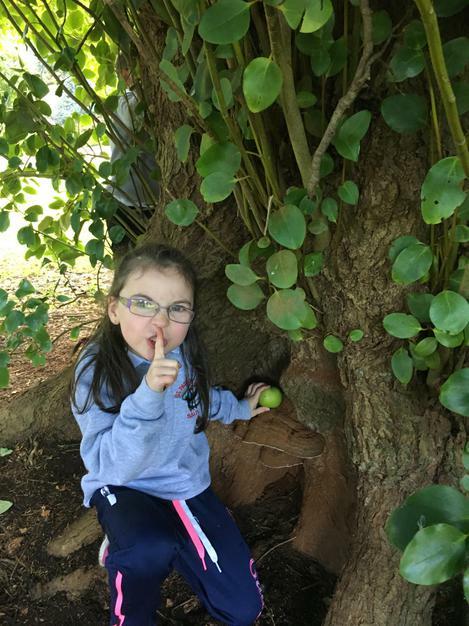 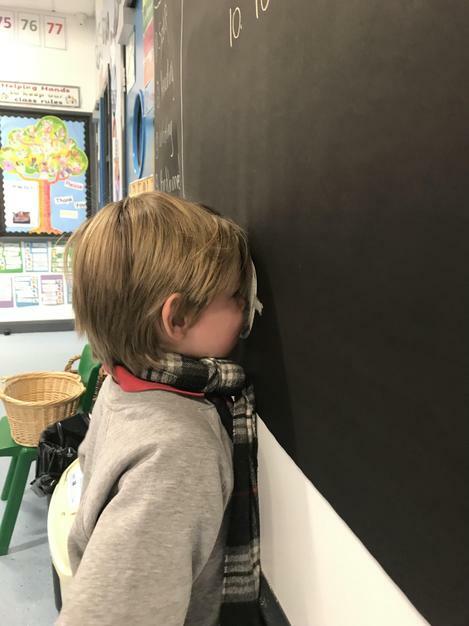 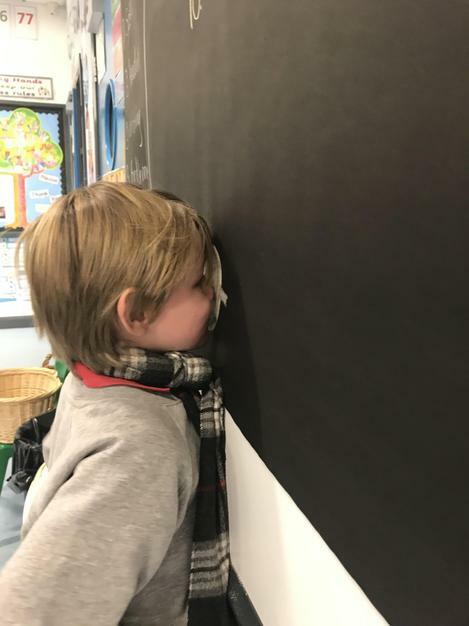 School was a LOT different then as P3 found out today. 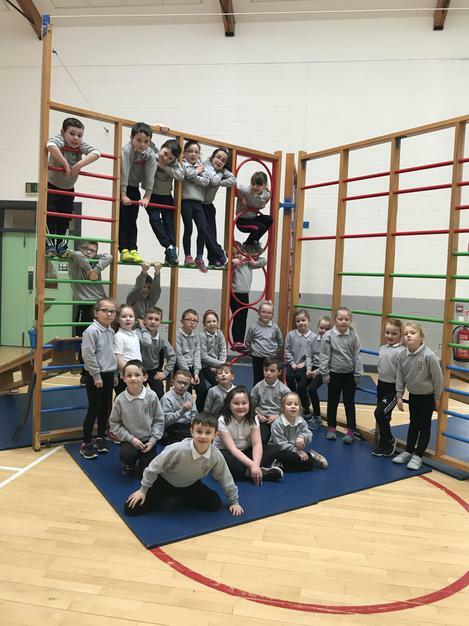 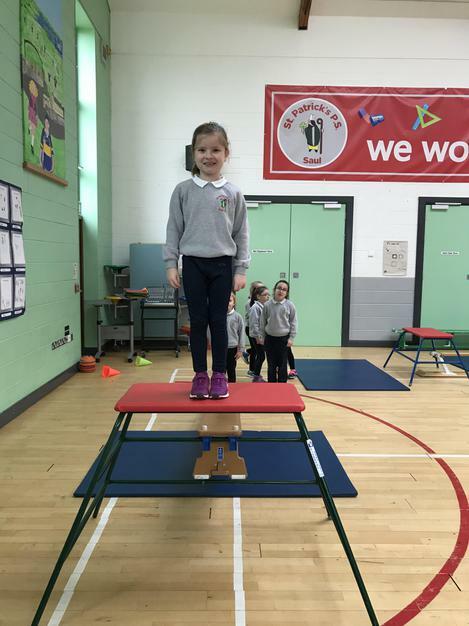 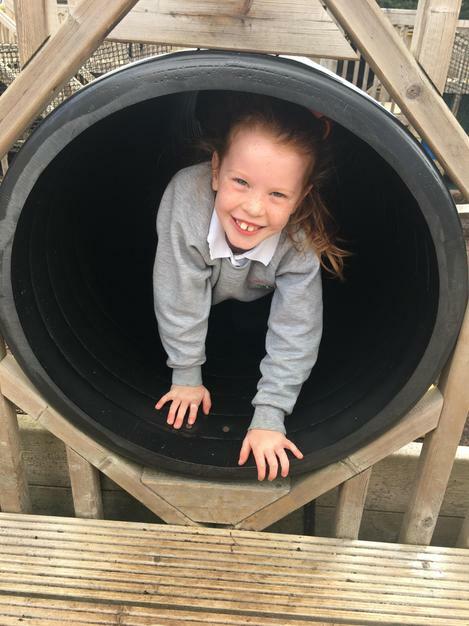 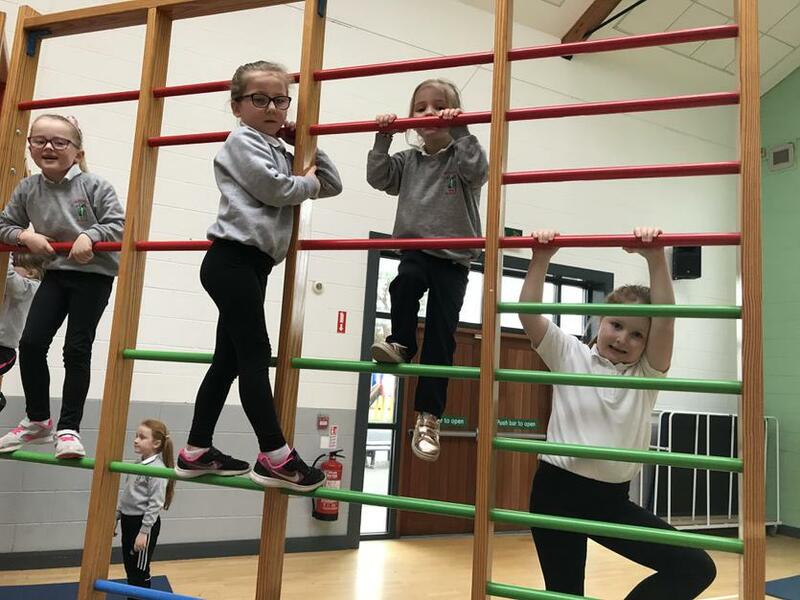 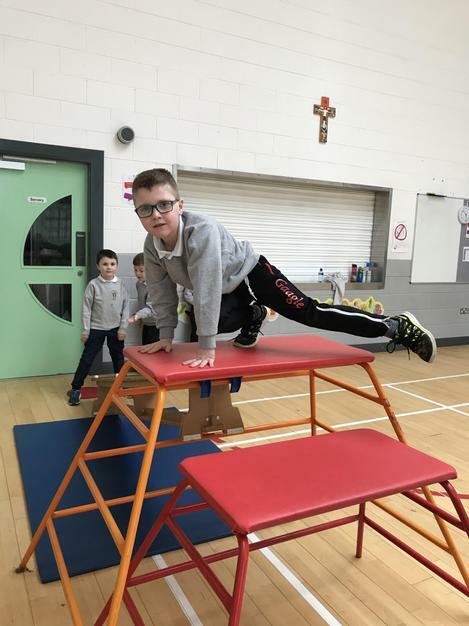 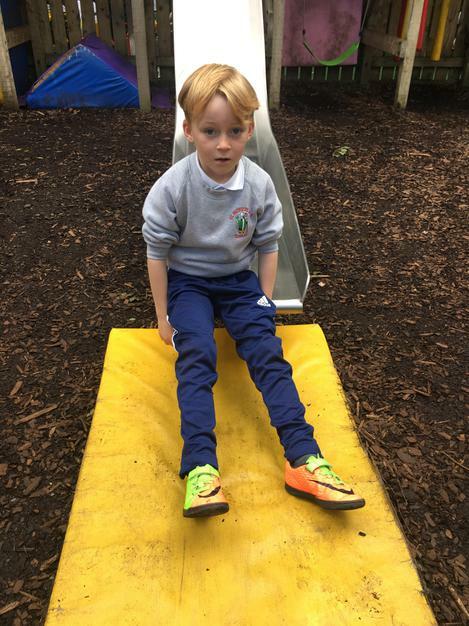 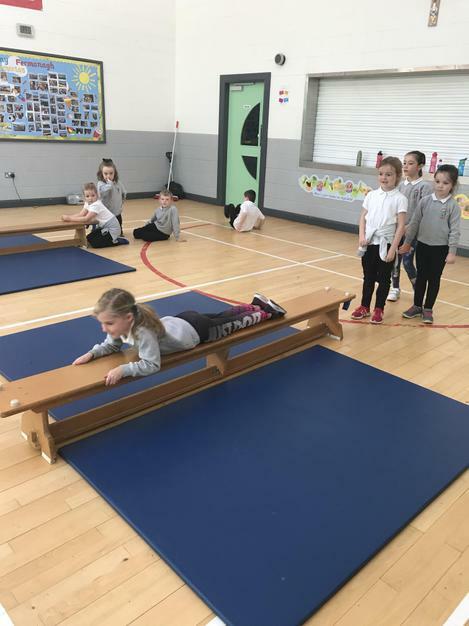 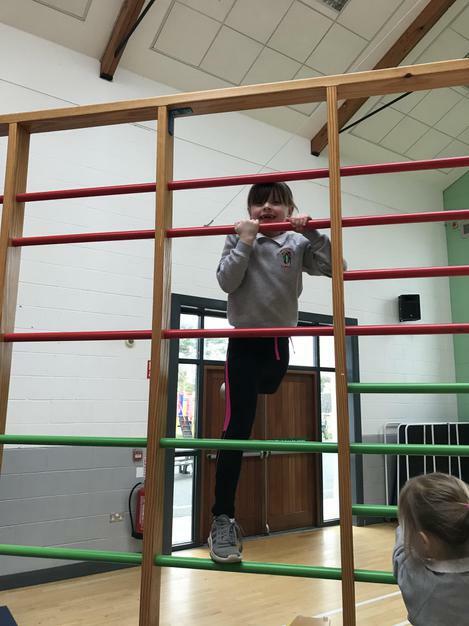 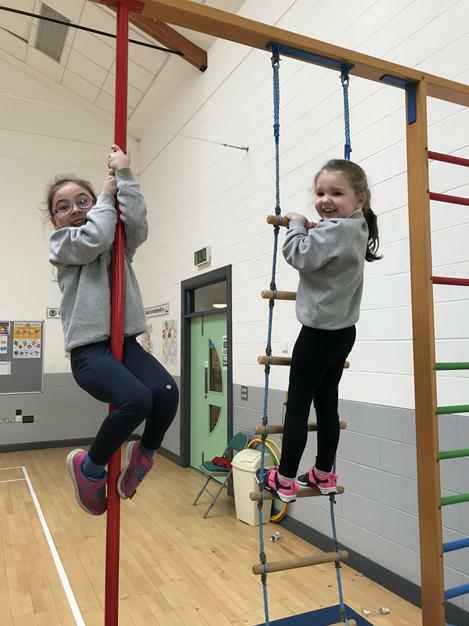 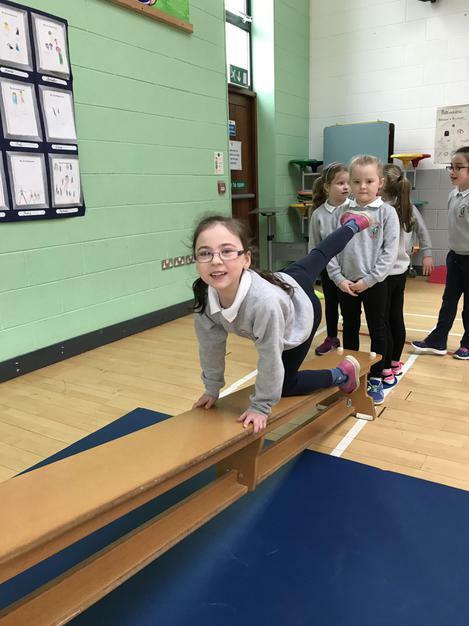 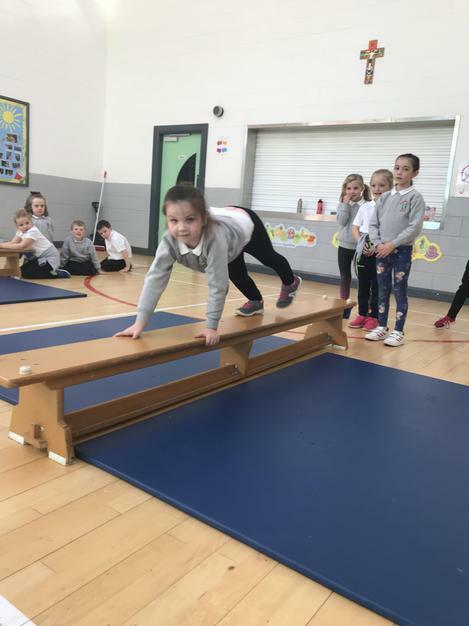 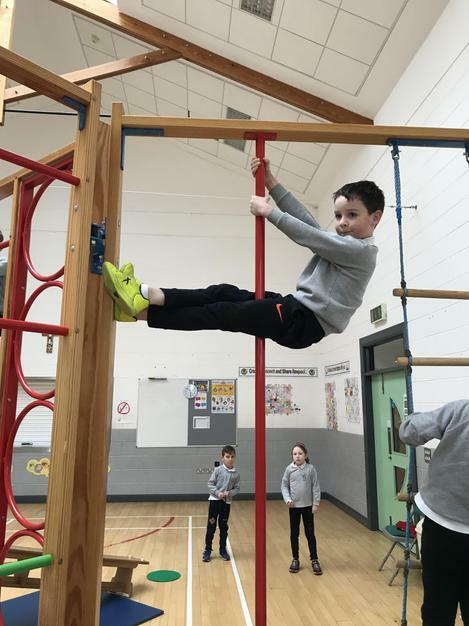 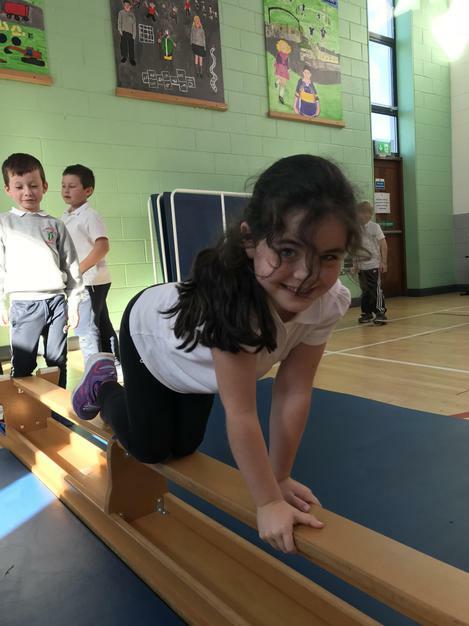 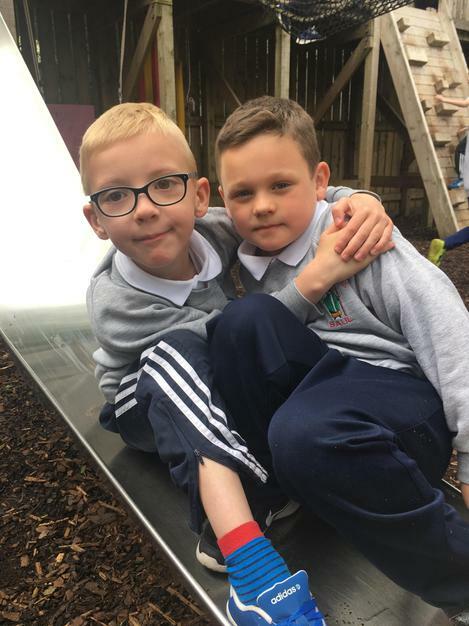 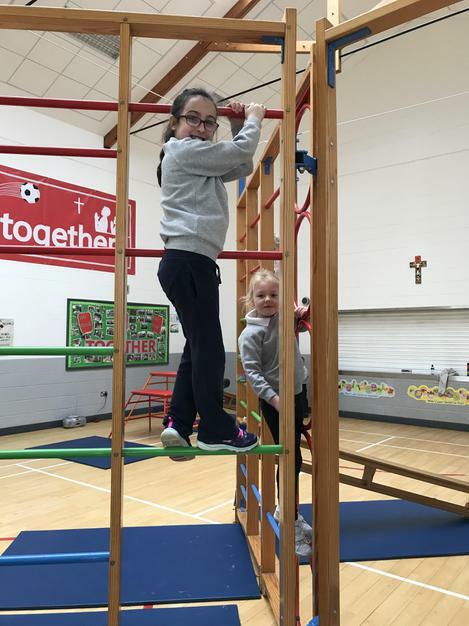 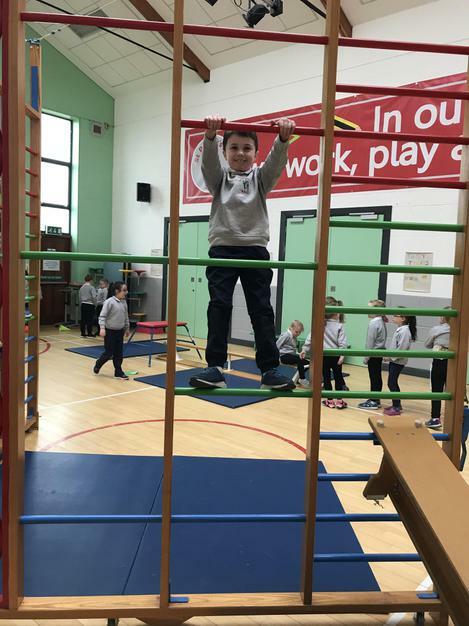 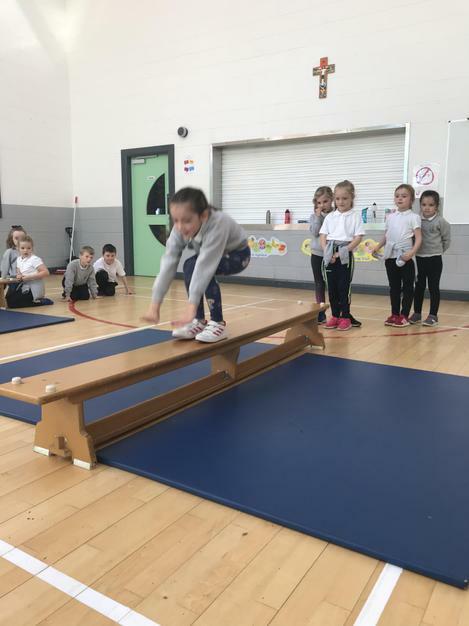 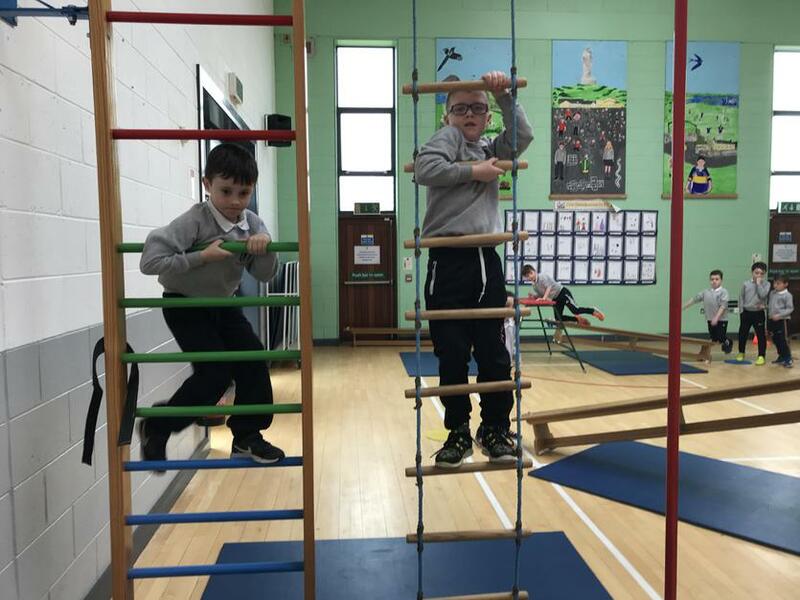 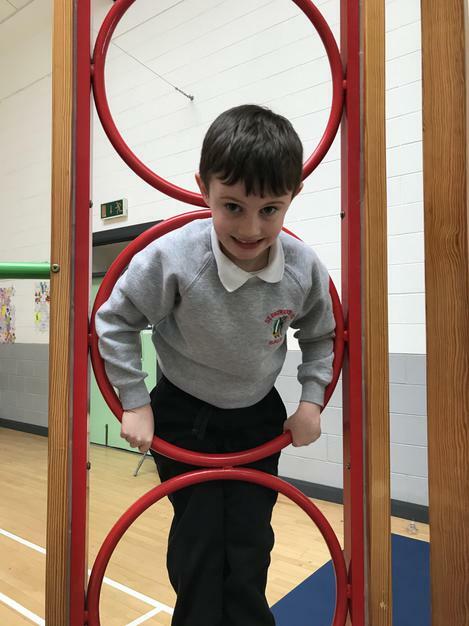 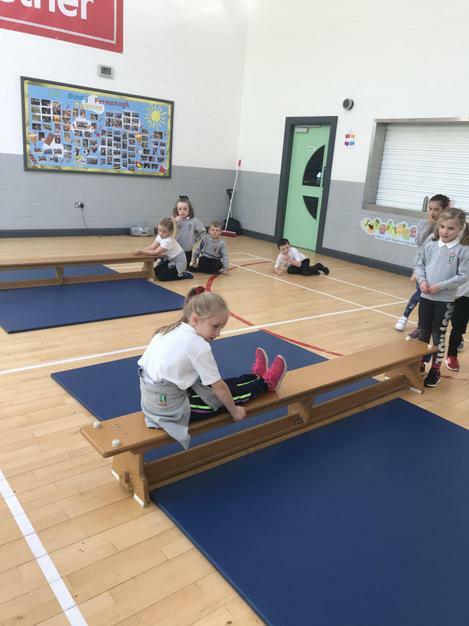 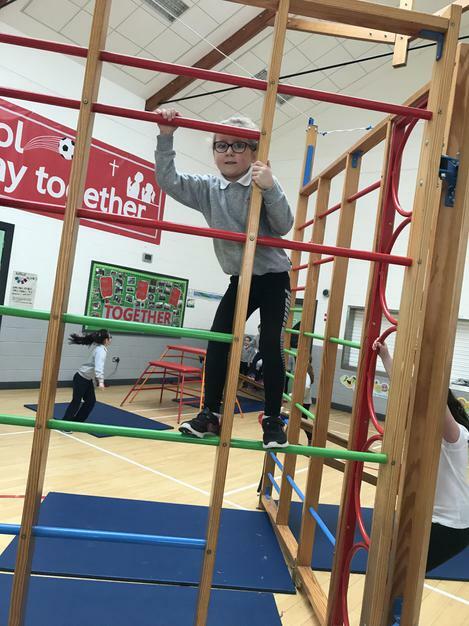 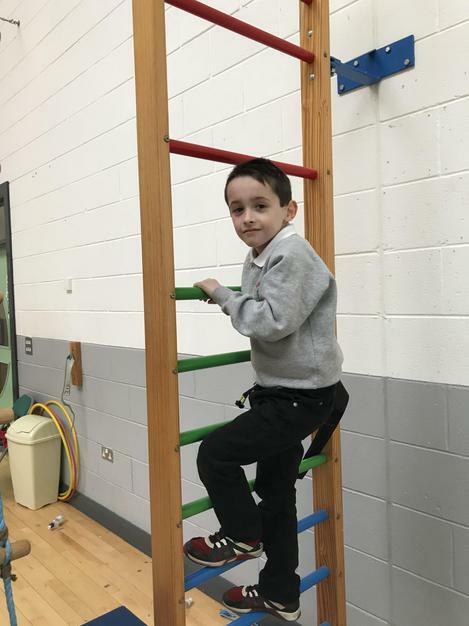 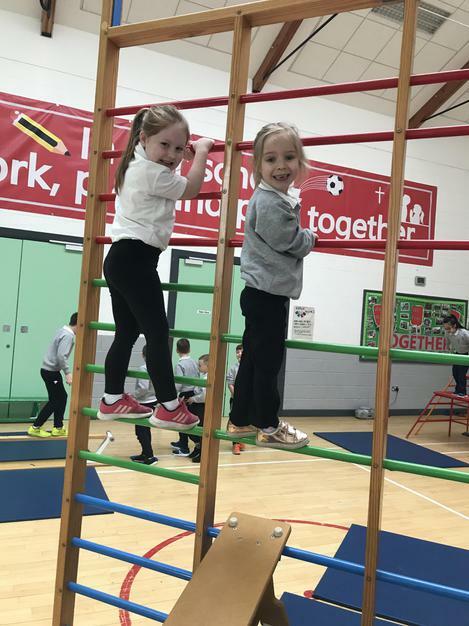 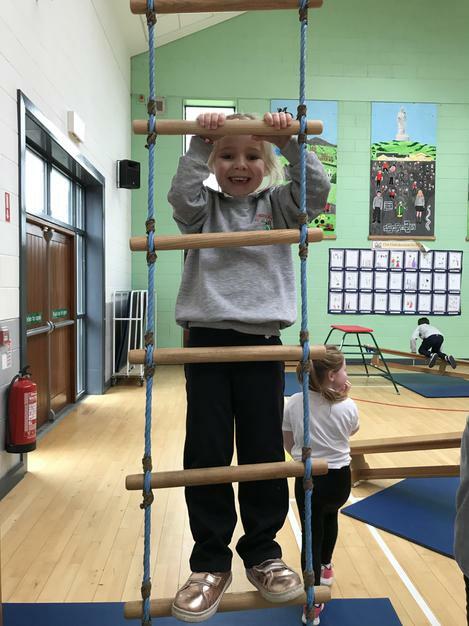 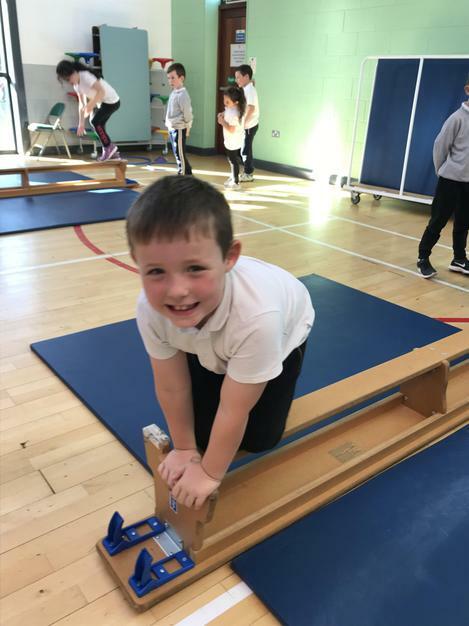 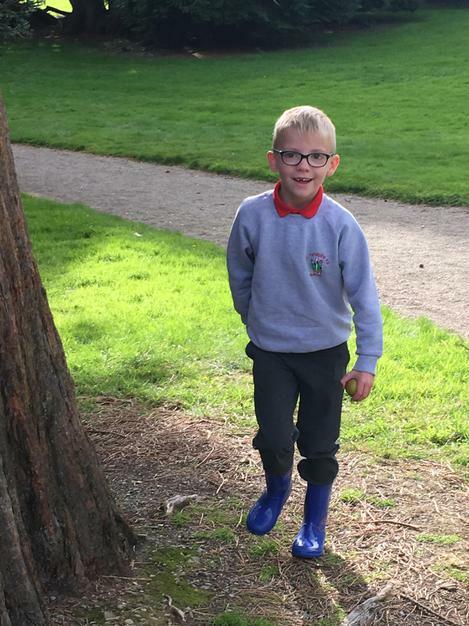 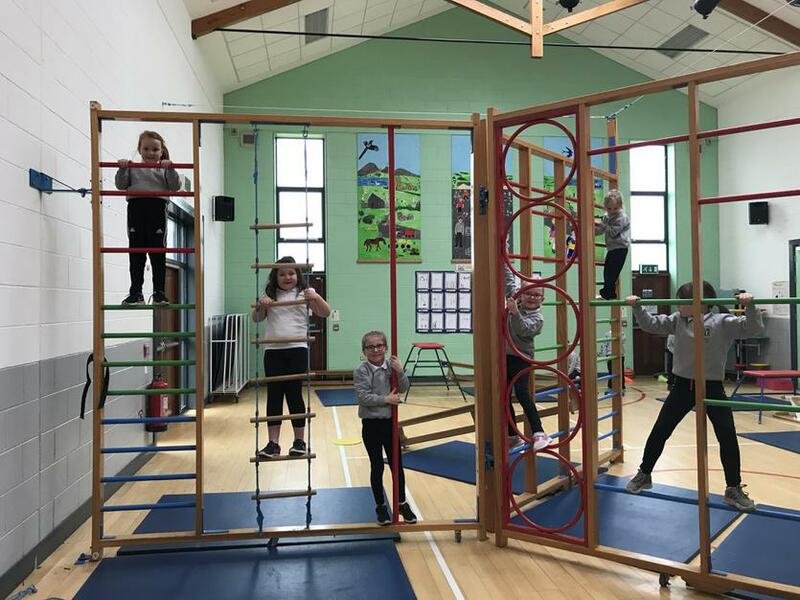 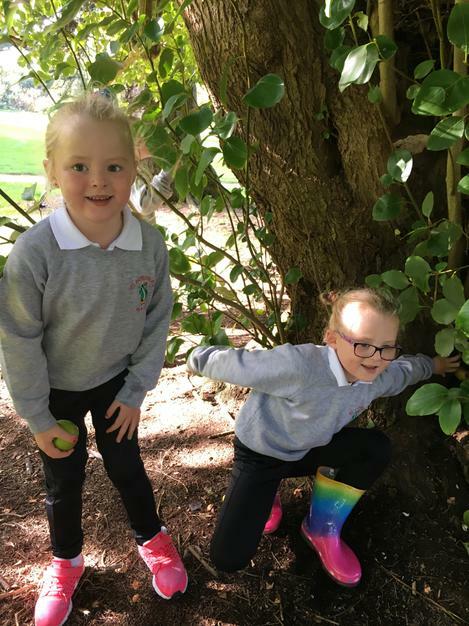 P.3 having fun travelling along the benches today during our gymnastics class. 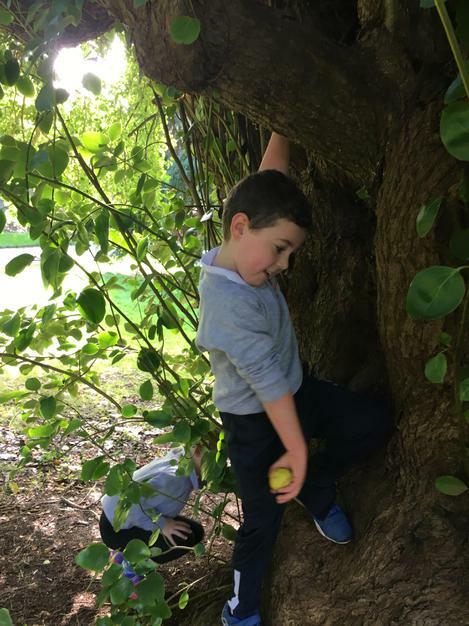 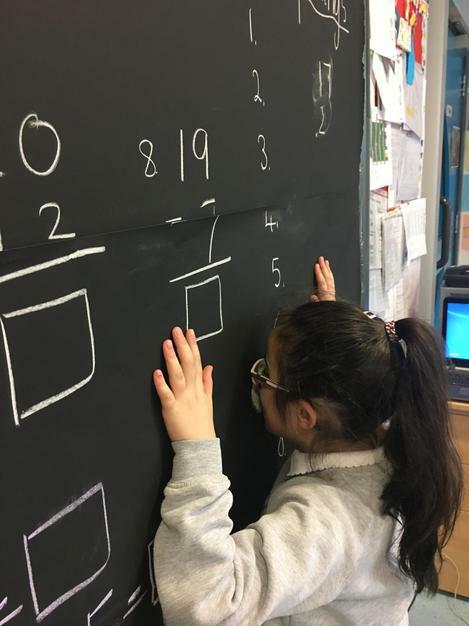 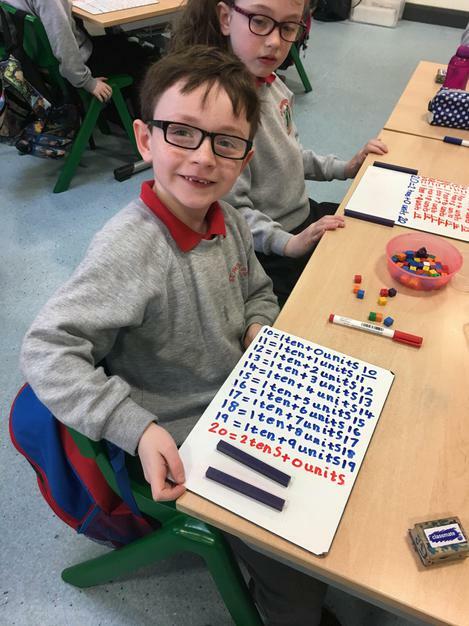 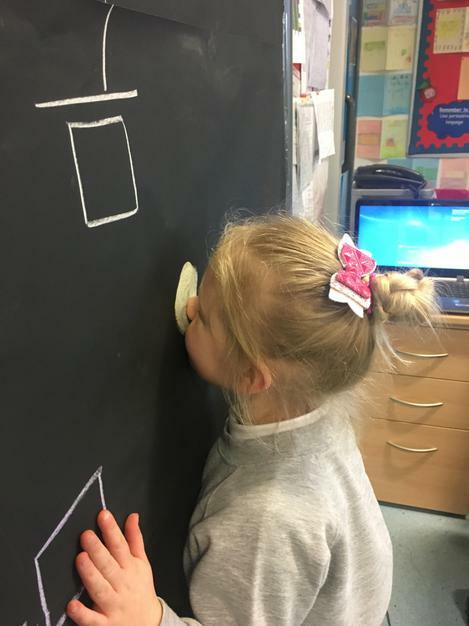 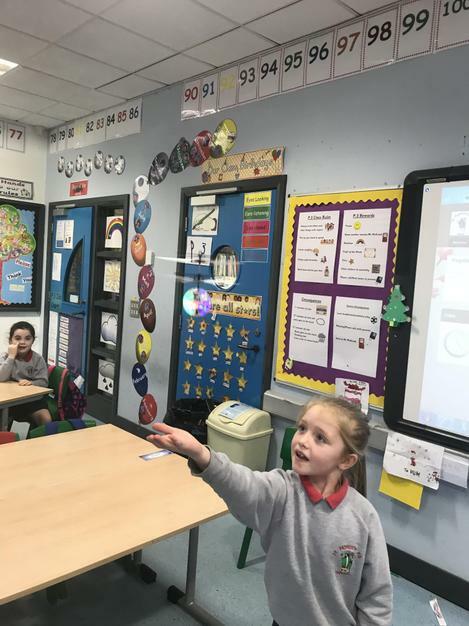 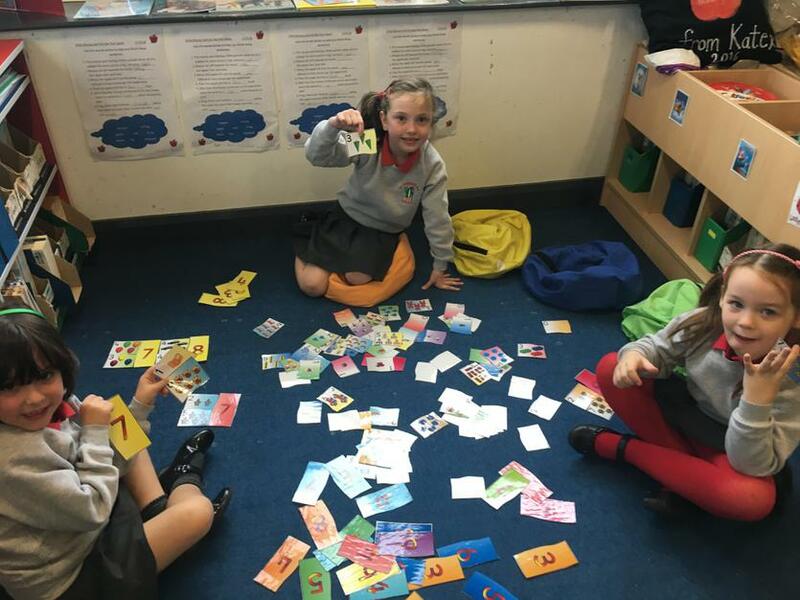 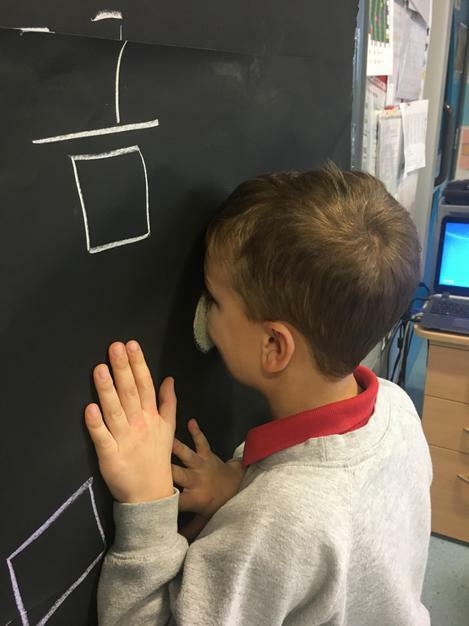 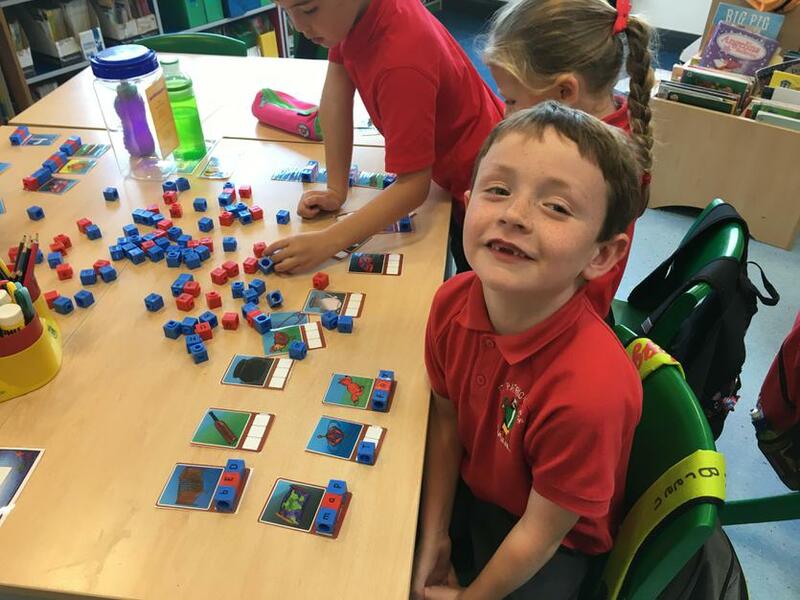 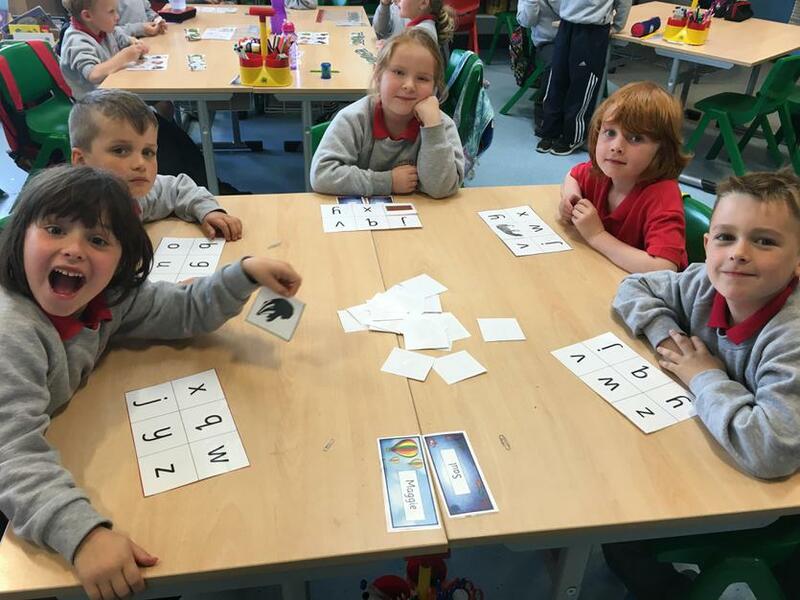 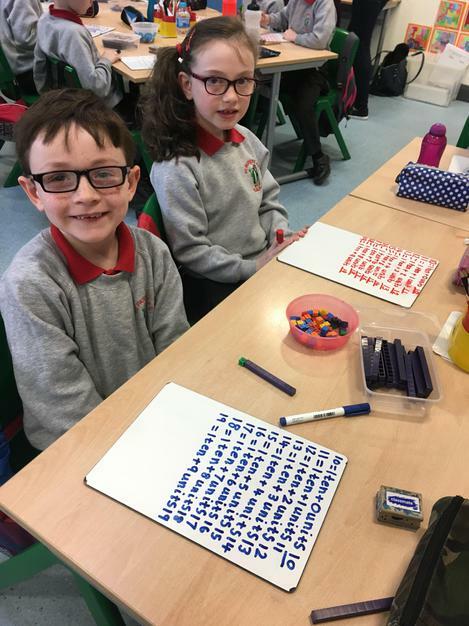 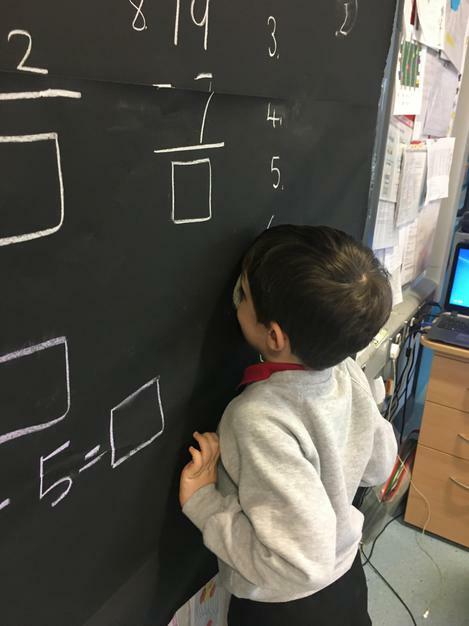 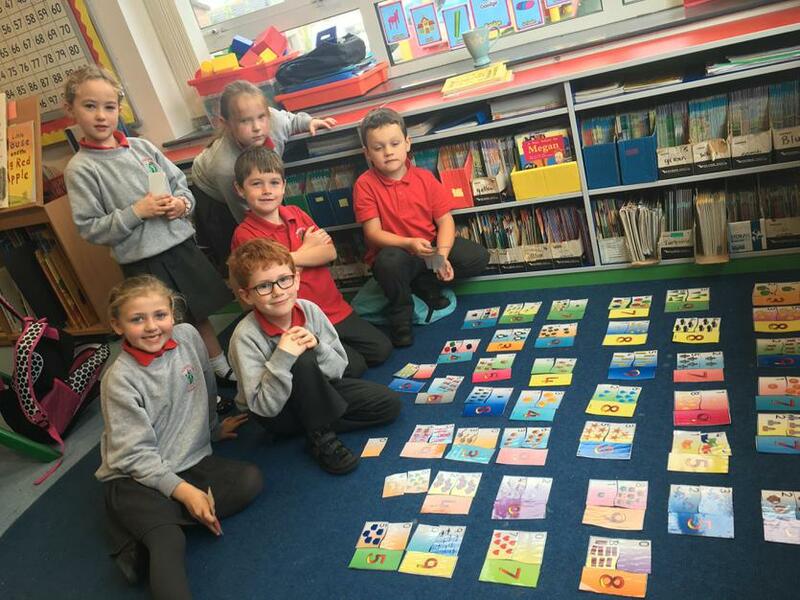 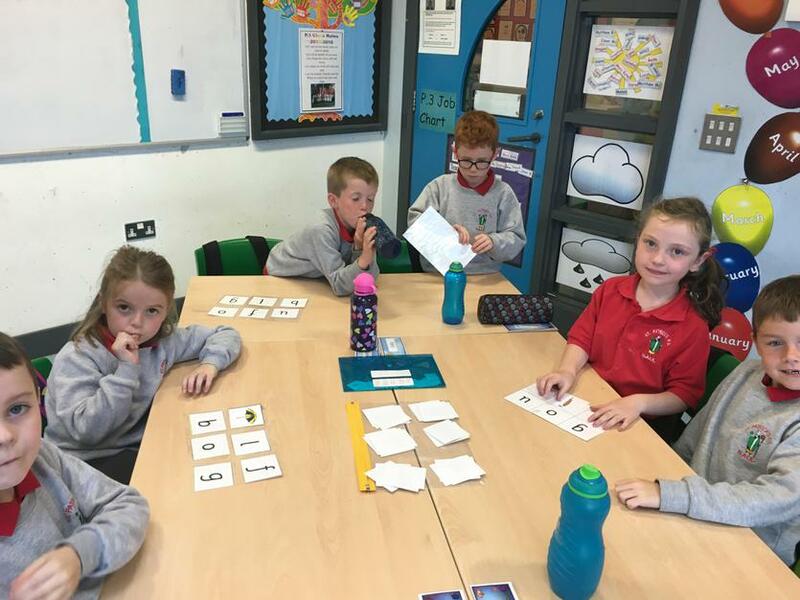 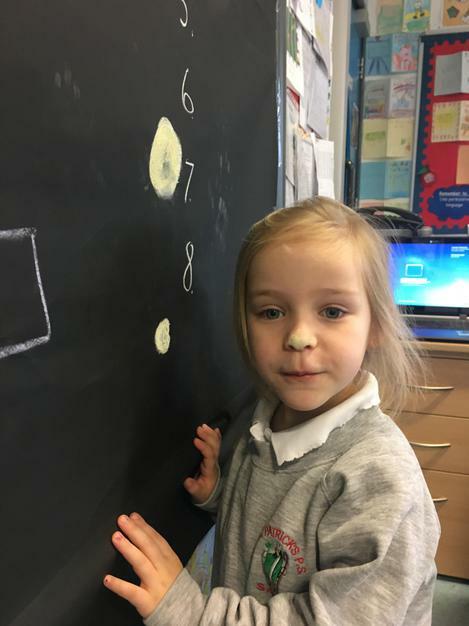 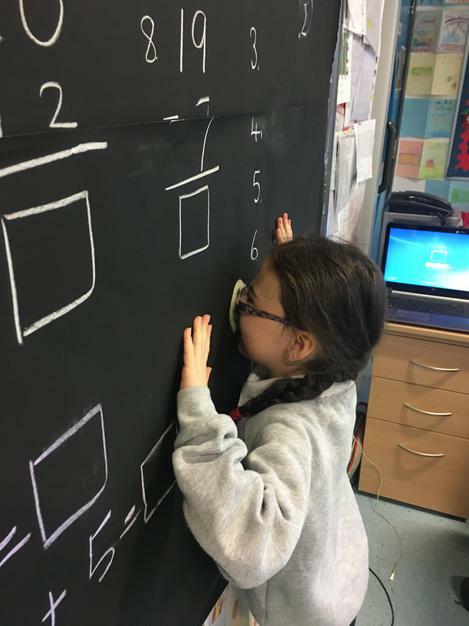 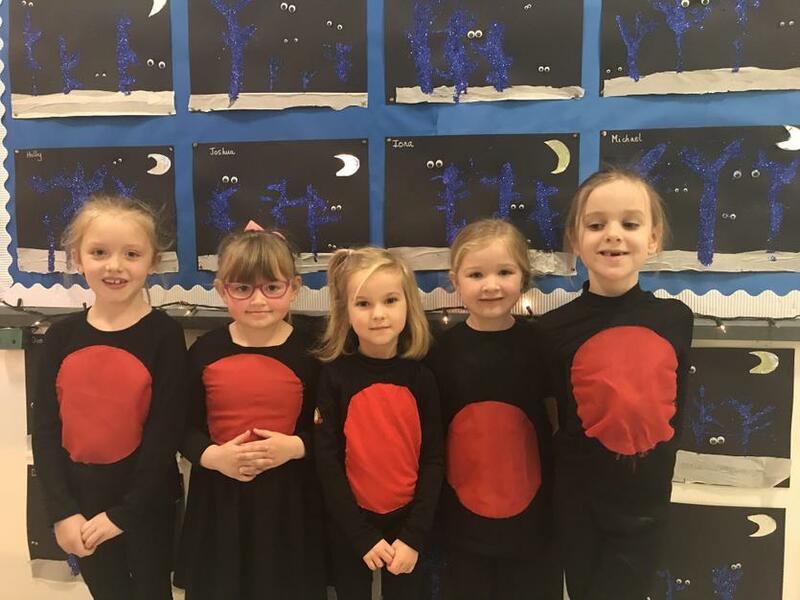 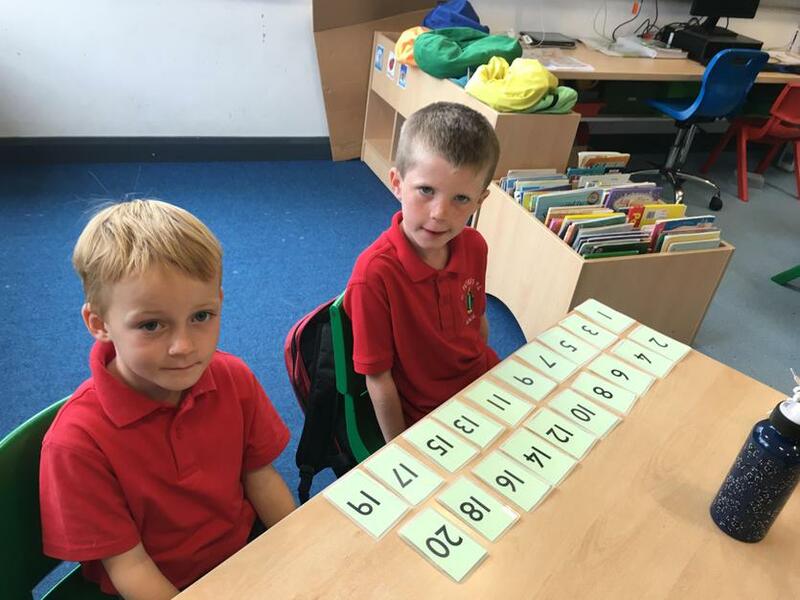 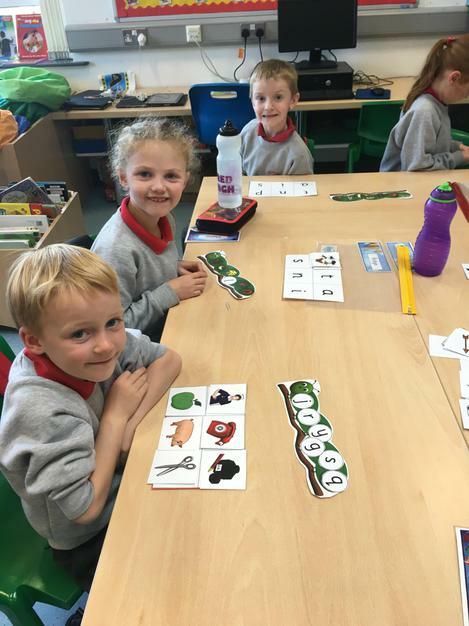 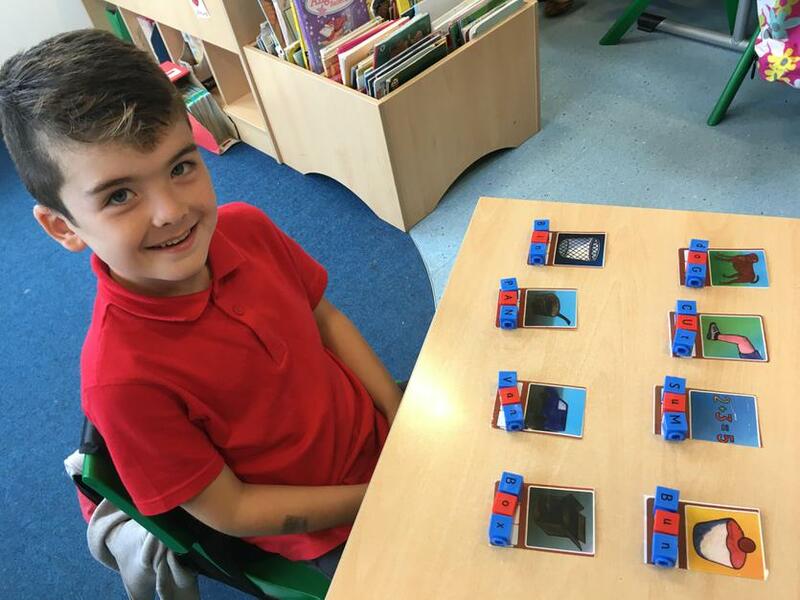 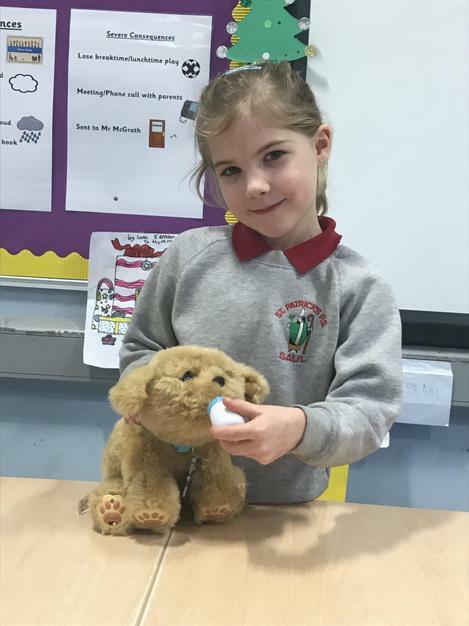 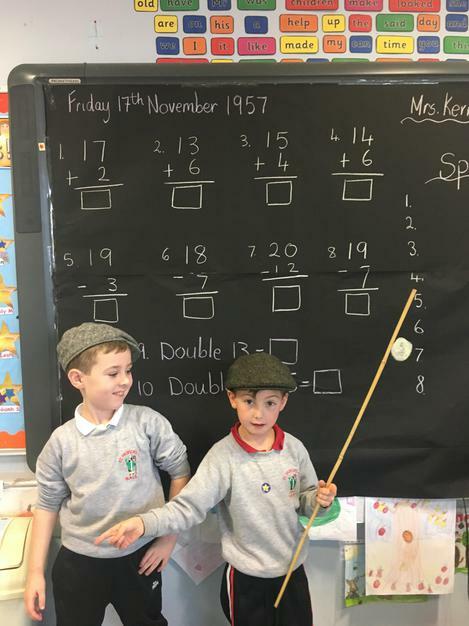 This week we have been learning our “doubles” and “near doubles”. 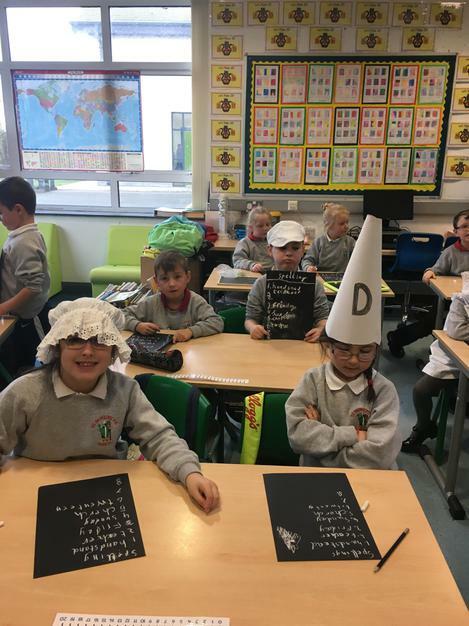 Remember to keep going over these at home! 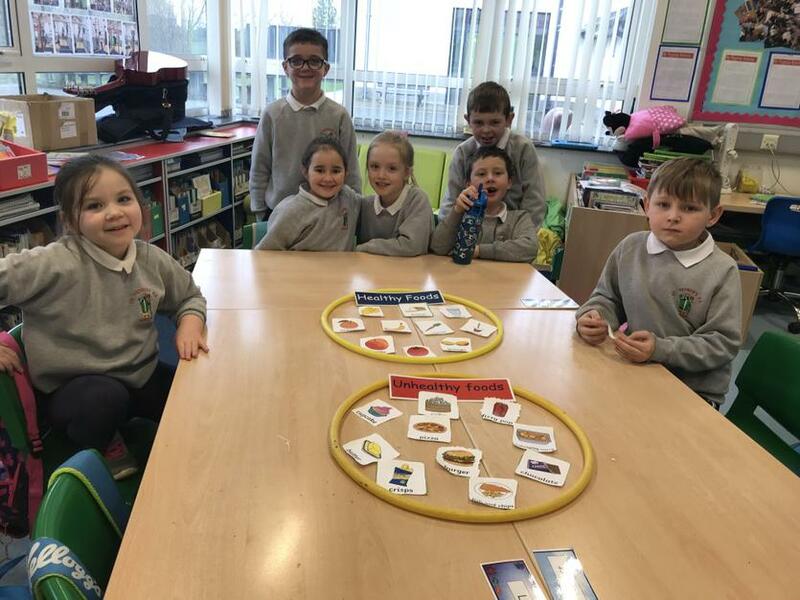 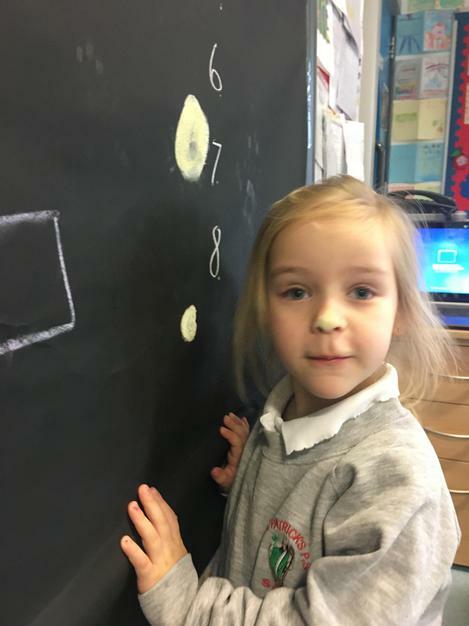 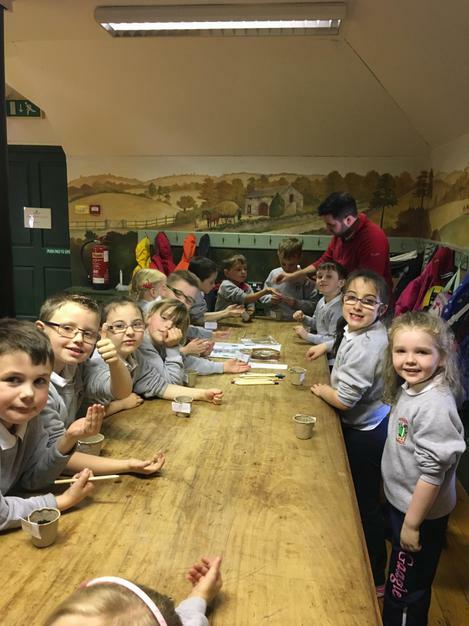 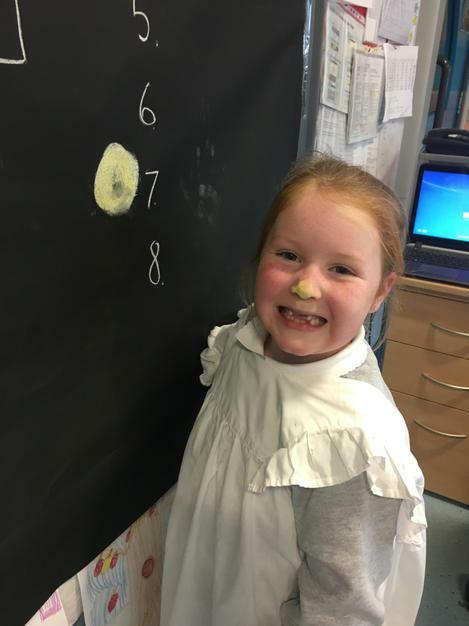 We had another busy day in P.3 making potato bread, champ and herby potatoes! 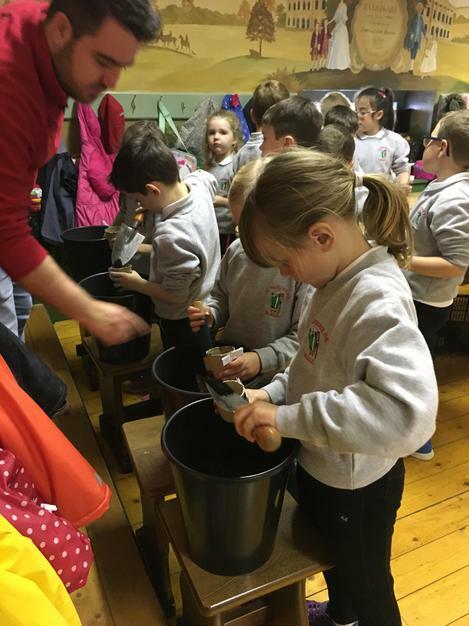 Let’s hope our potatoes grow so we can keep making yummy potato bread! 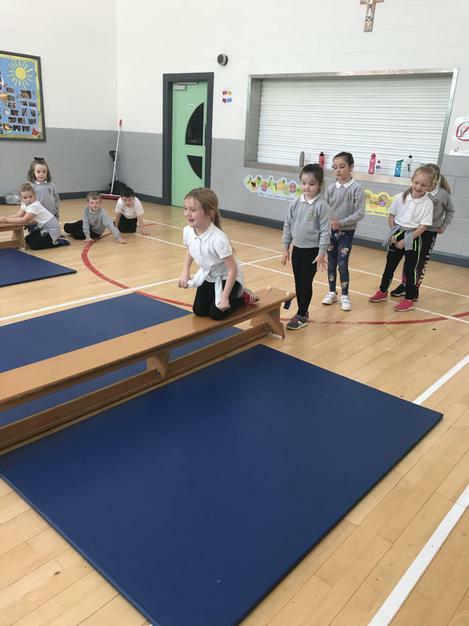 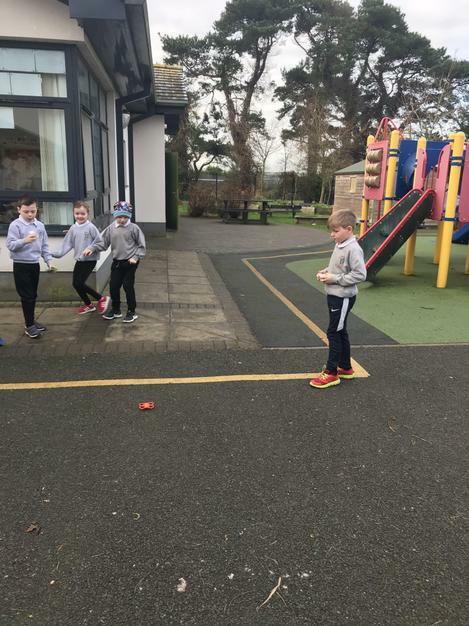 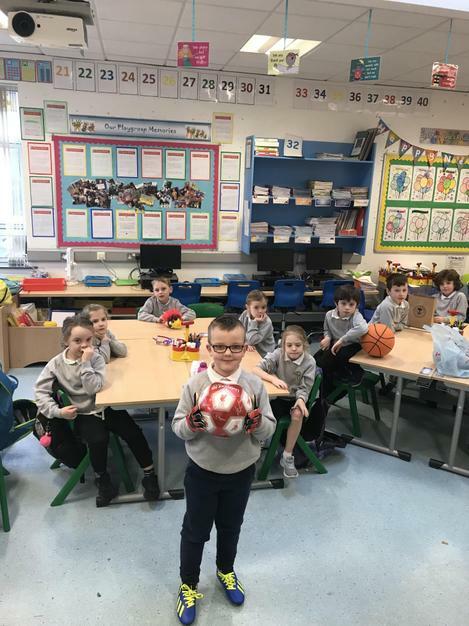 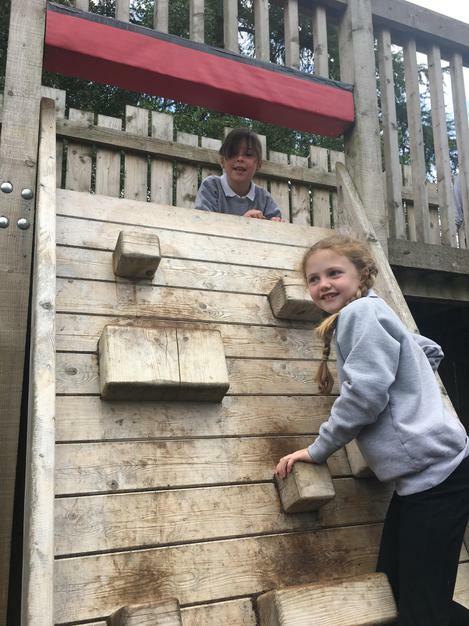 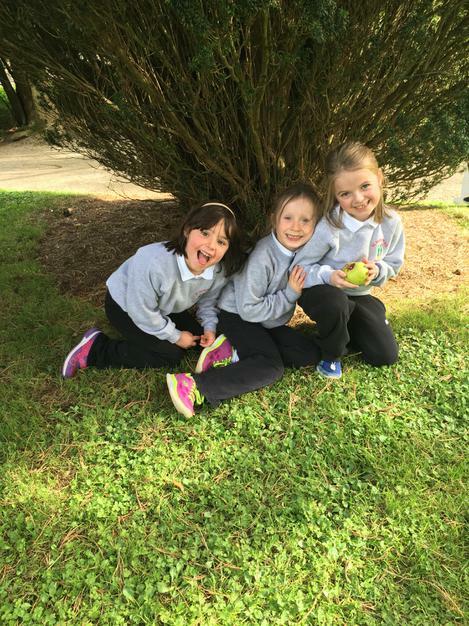 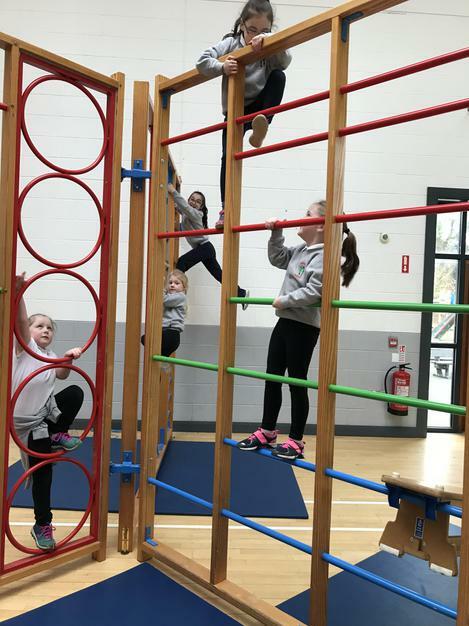 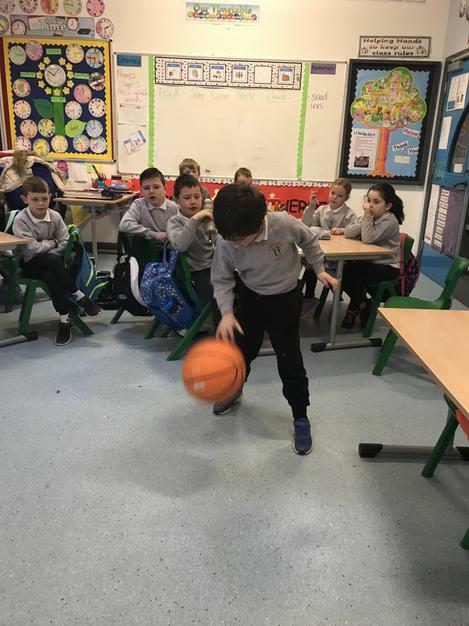 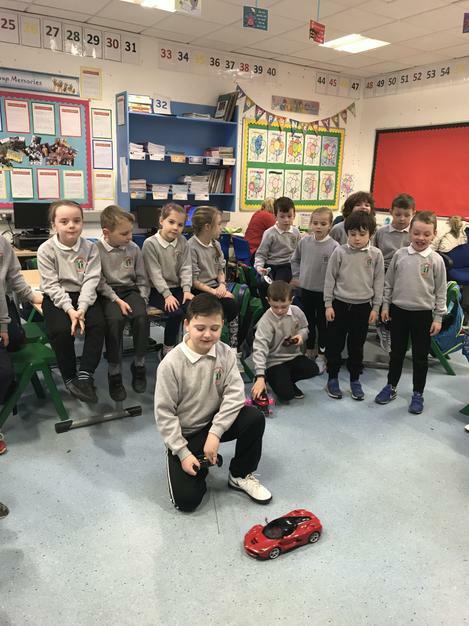 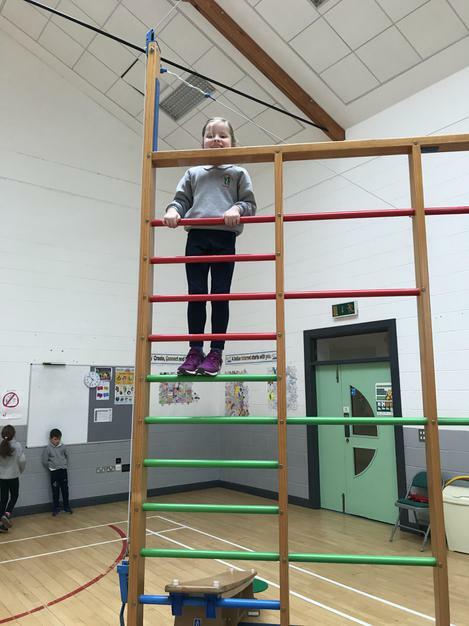 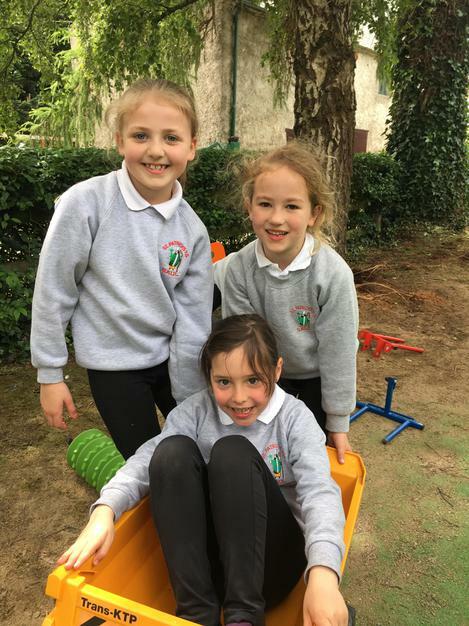 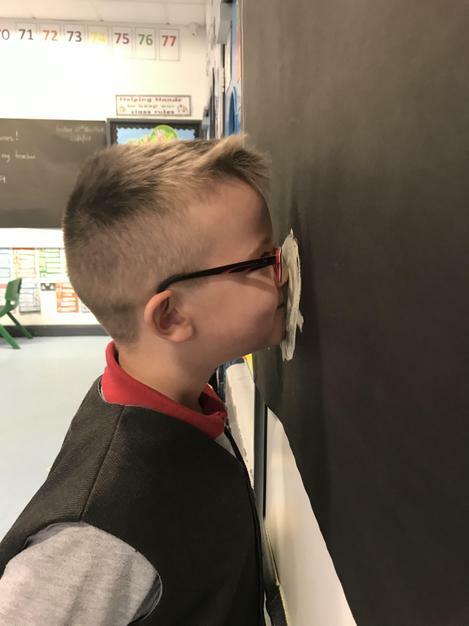 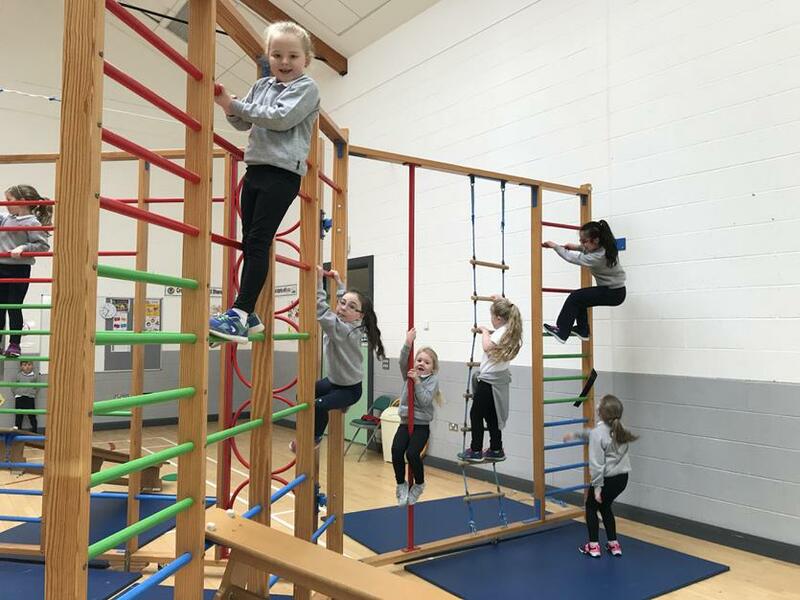 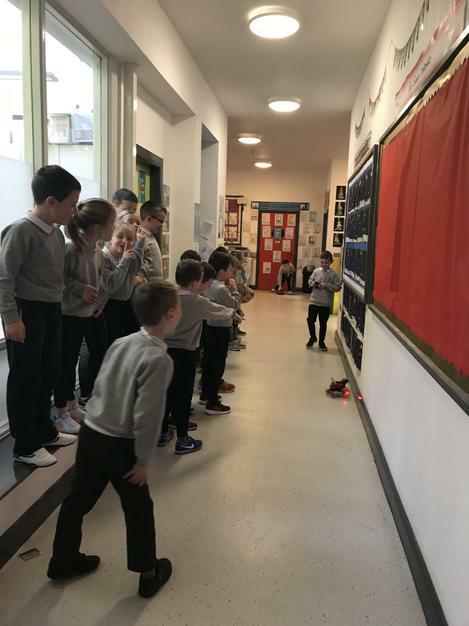 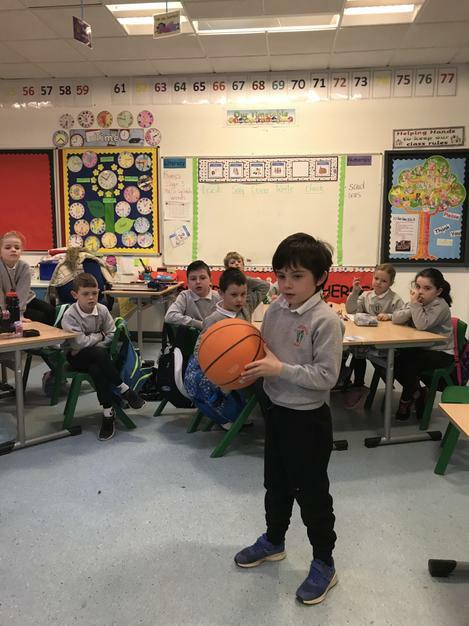 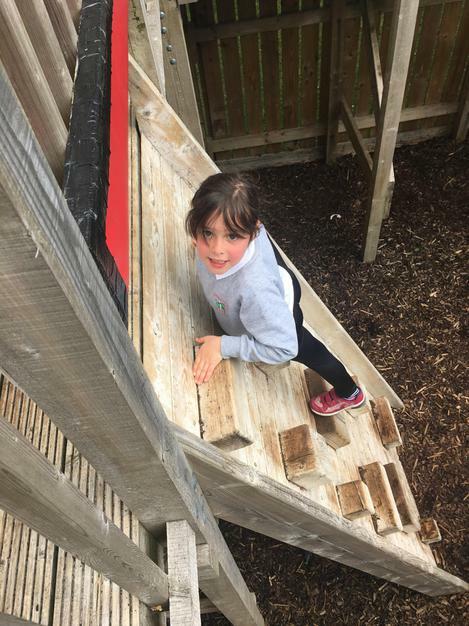 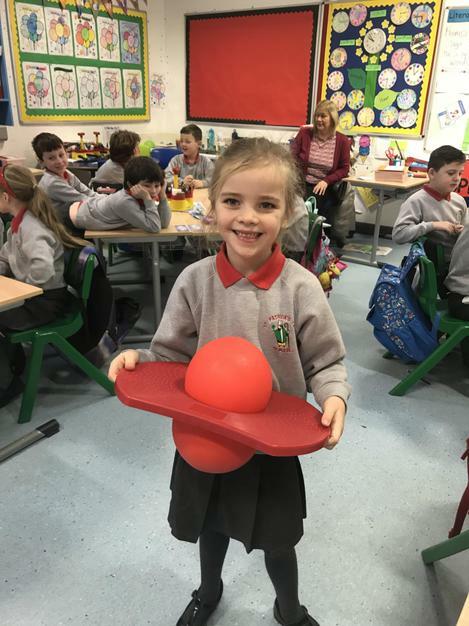 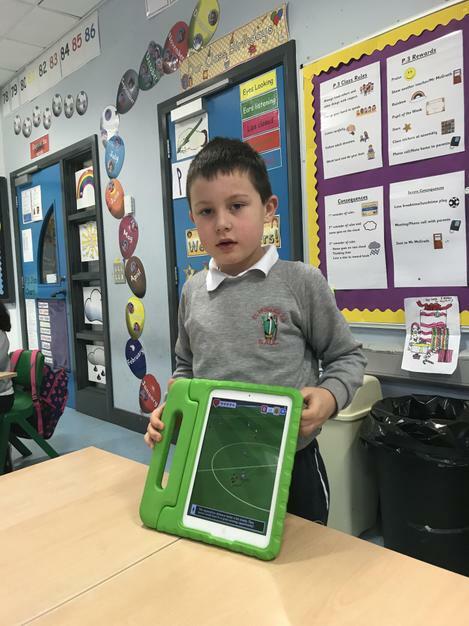 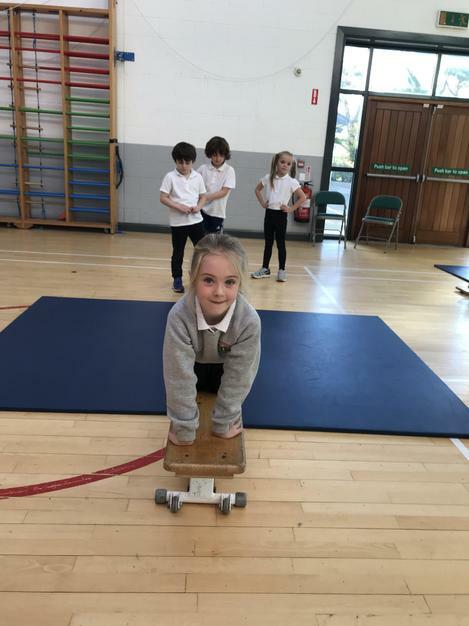 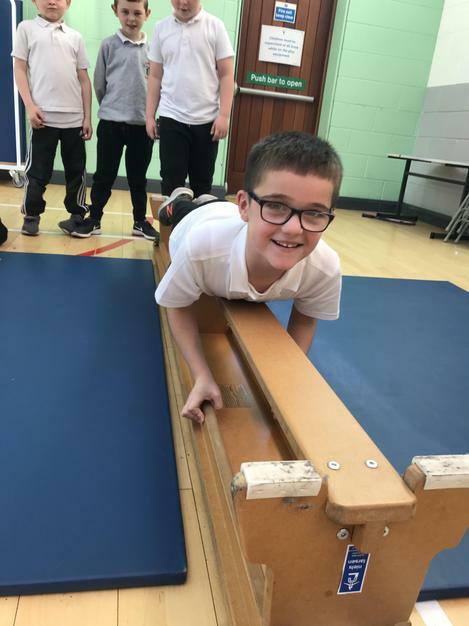 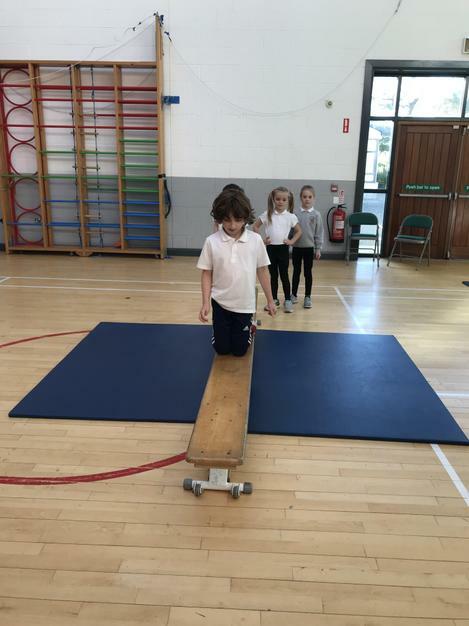 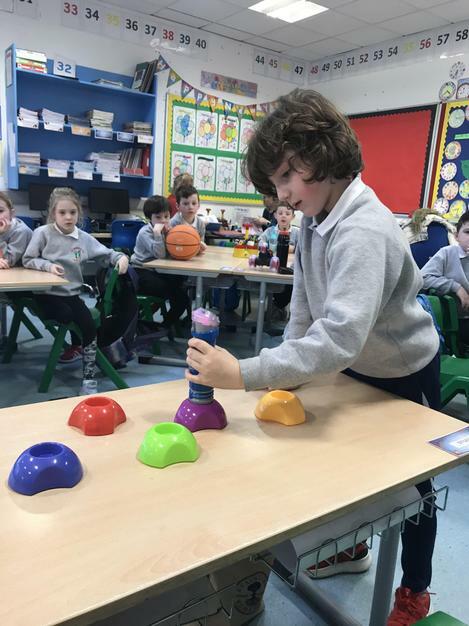 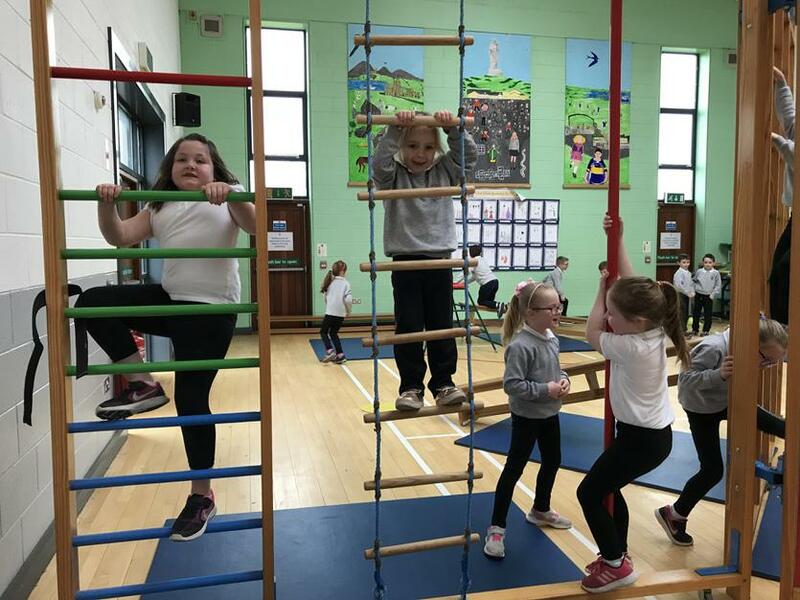 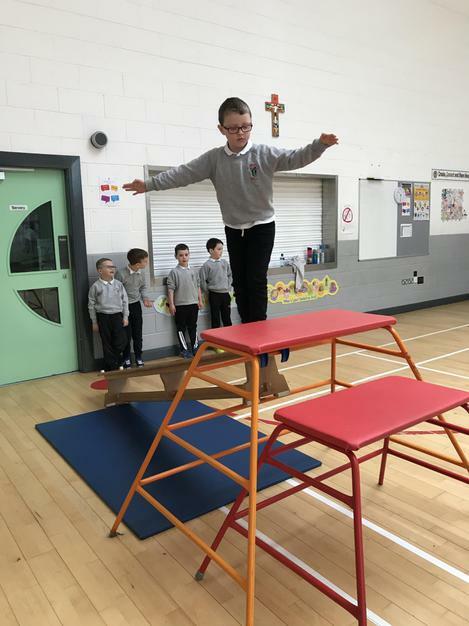 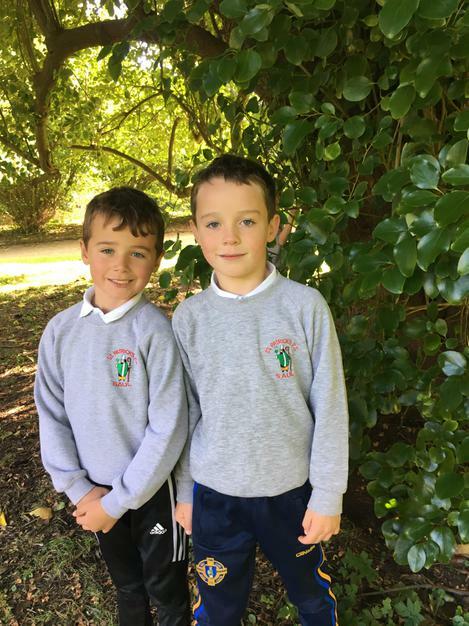 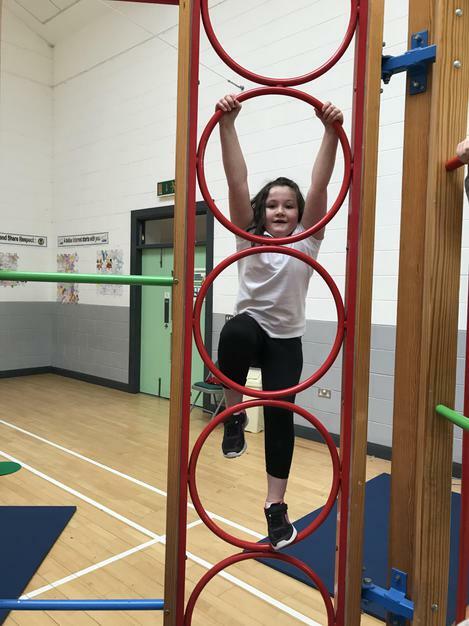 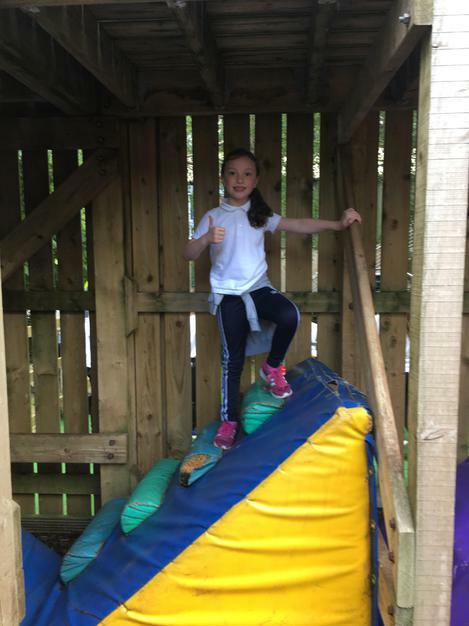 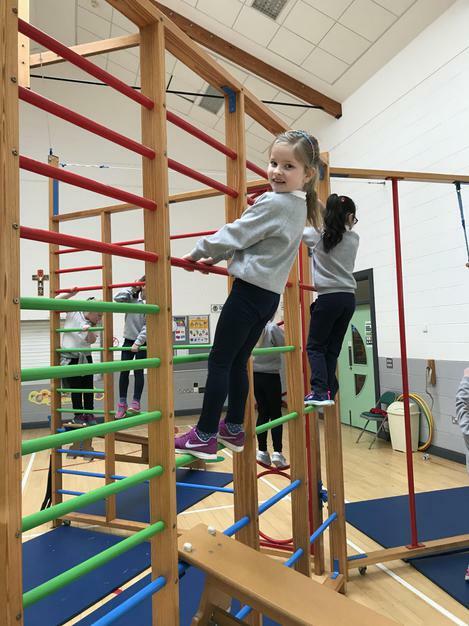 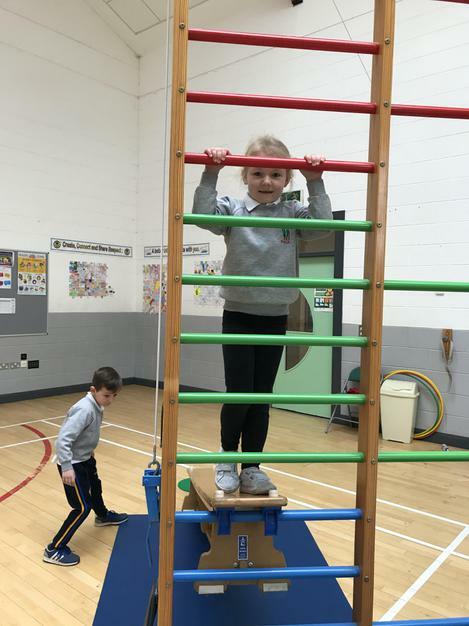 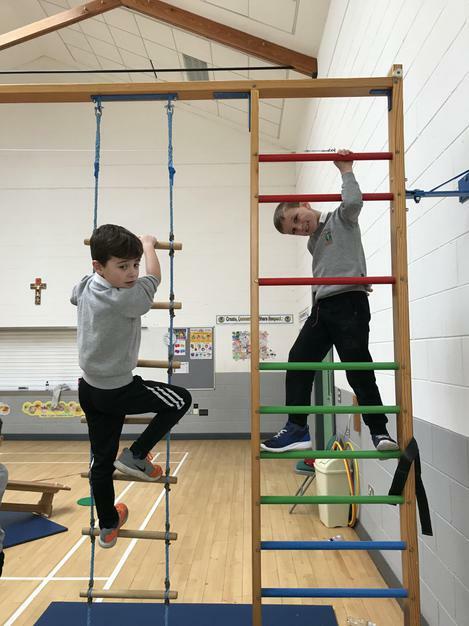 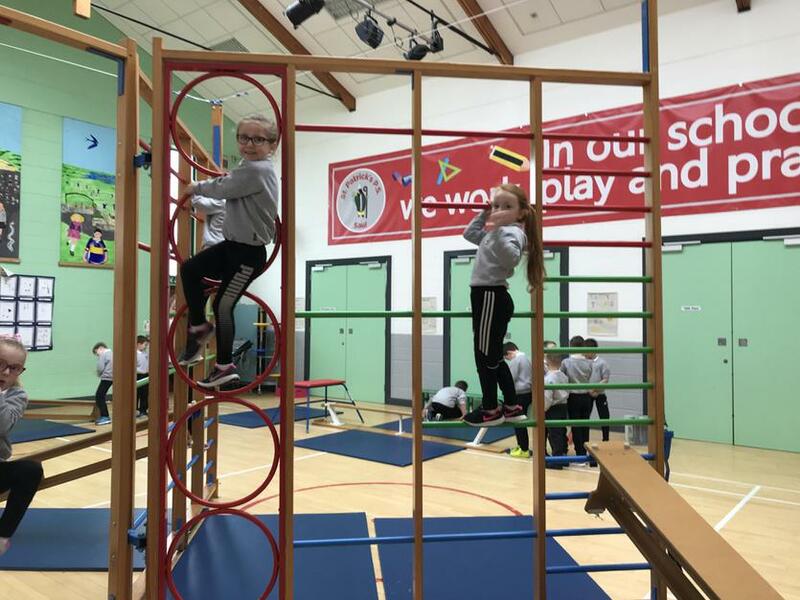 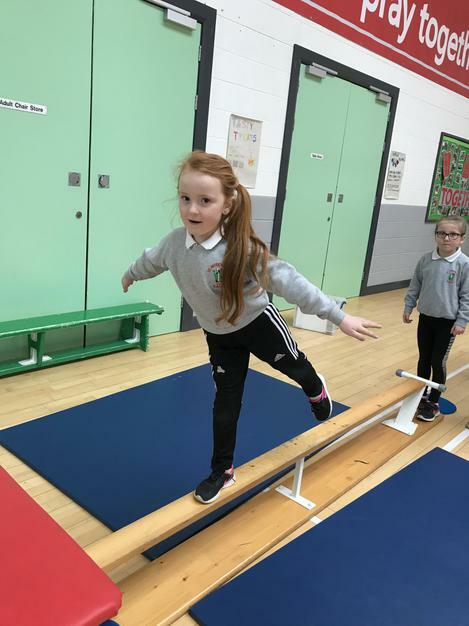 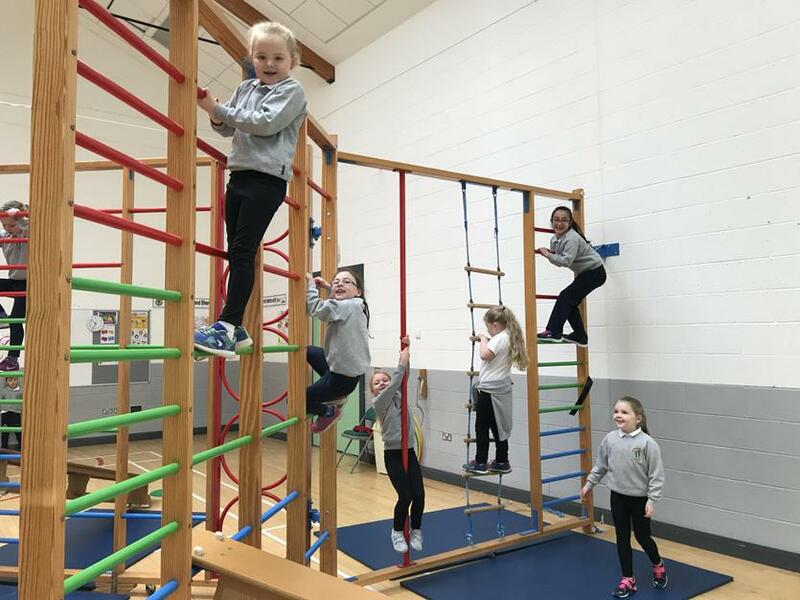 P.3 enjoyed taking PE lessons to the next level on Monday. 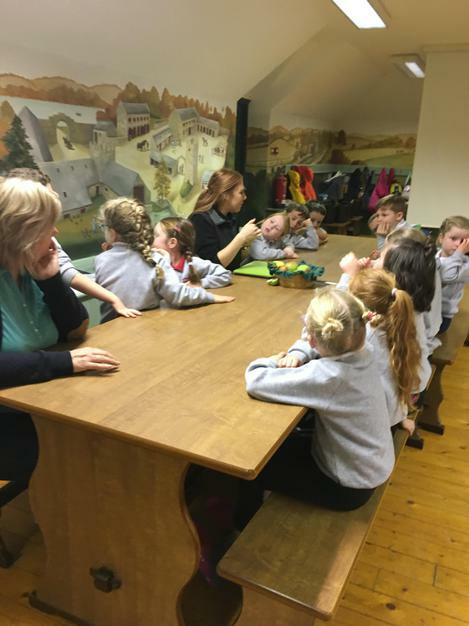 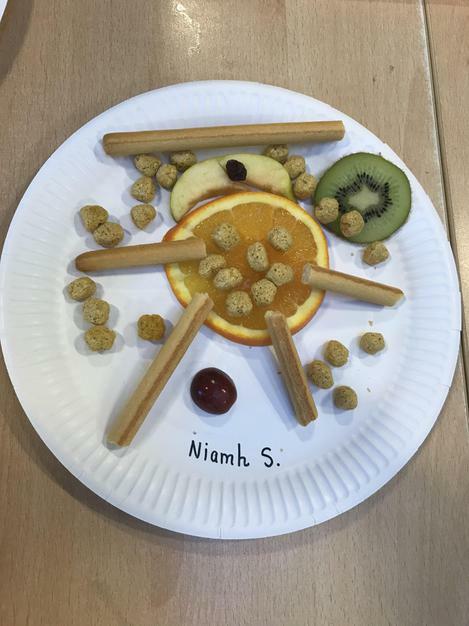 Today we discussed options for a healthy lunchbox and even tasted brown bread! 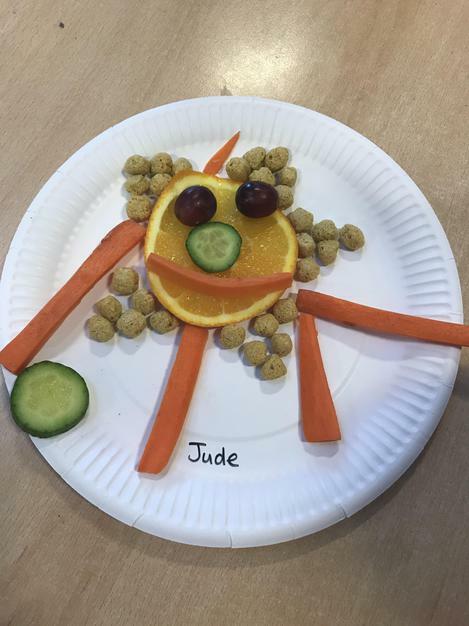 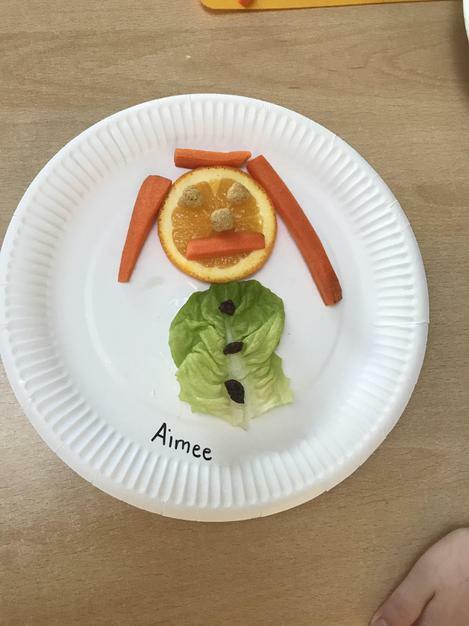 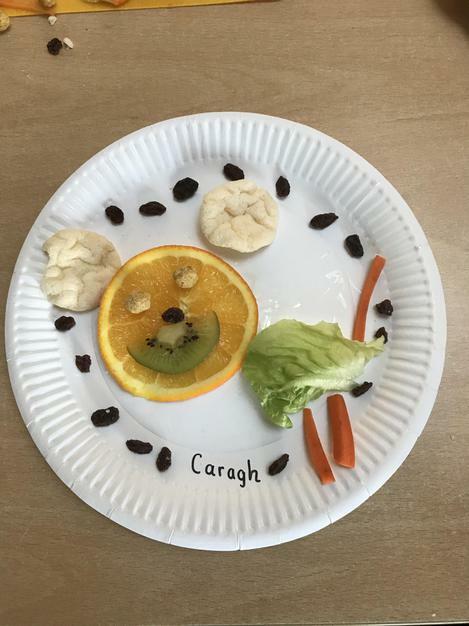 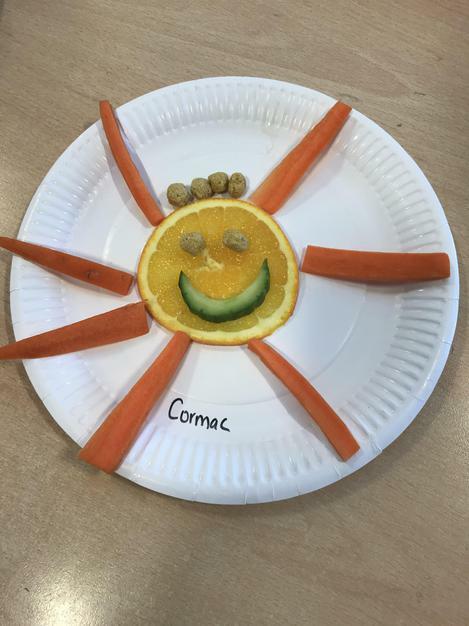 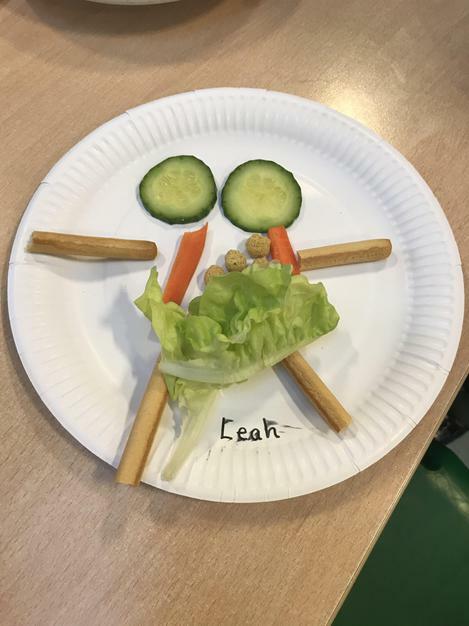 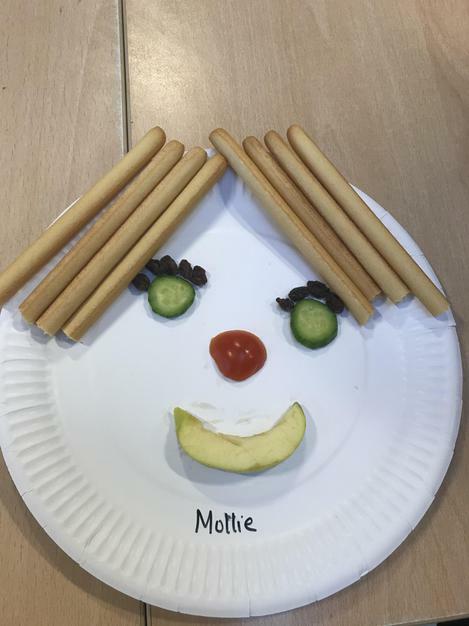 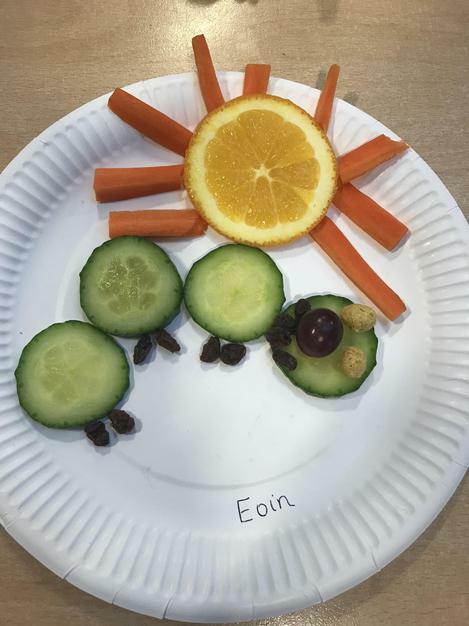 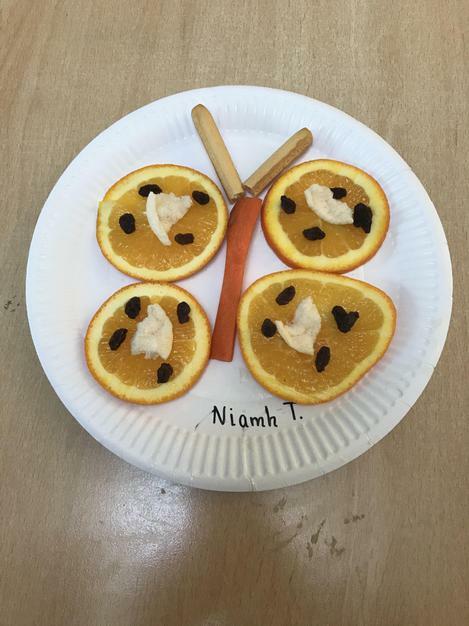 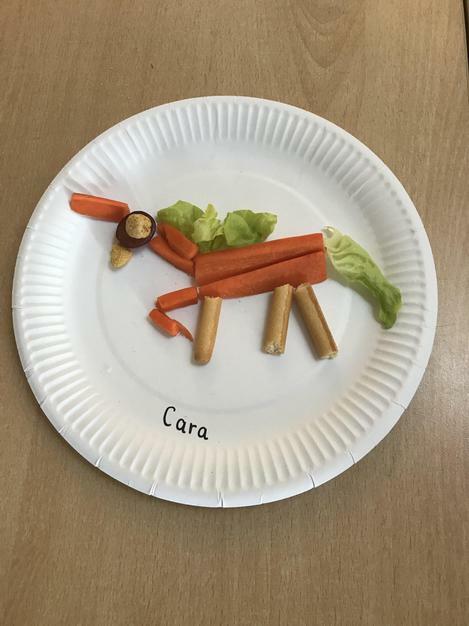 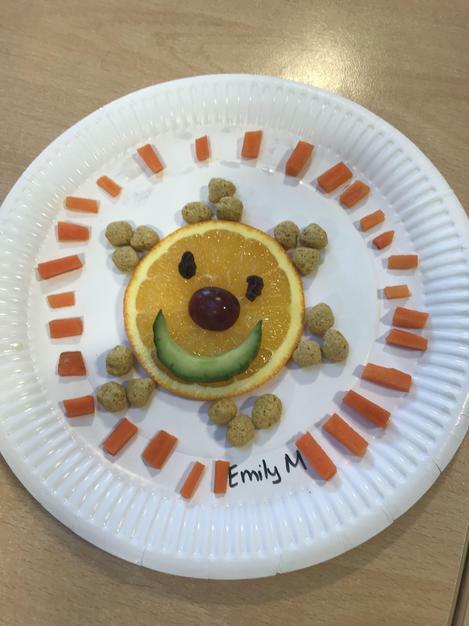 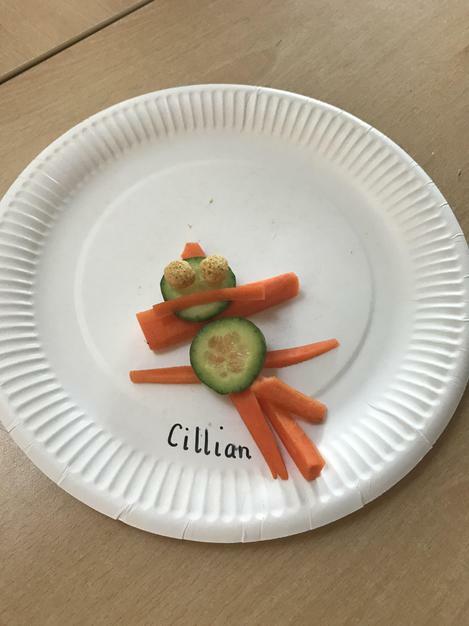 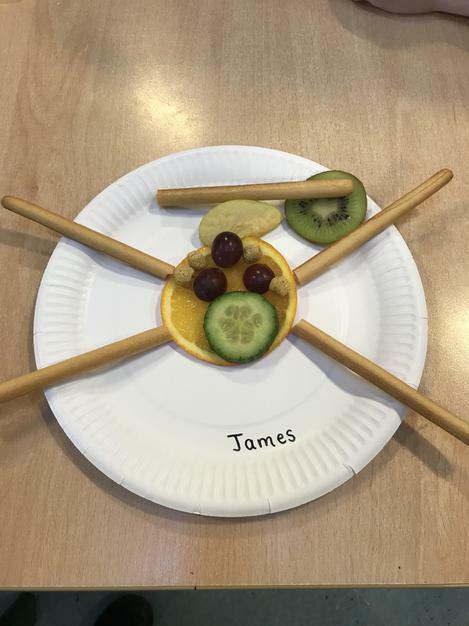 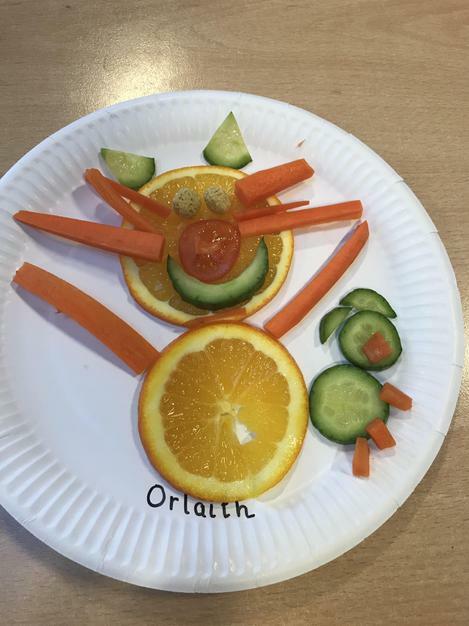 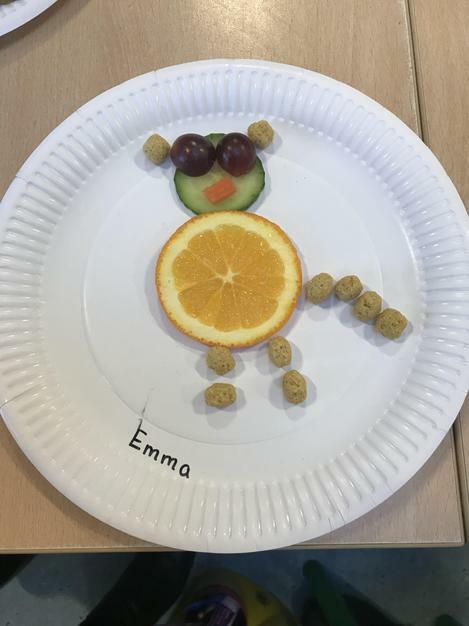 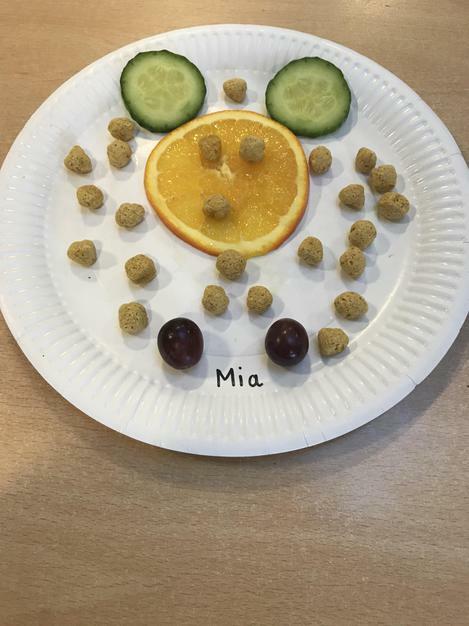 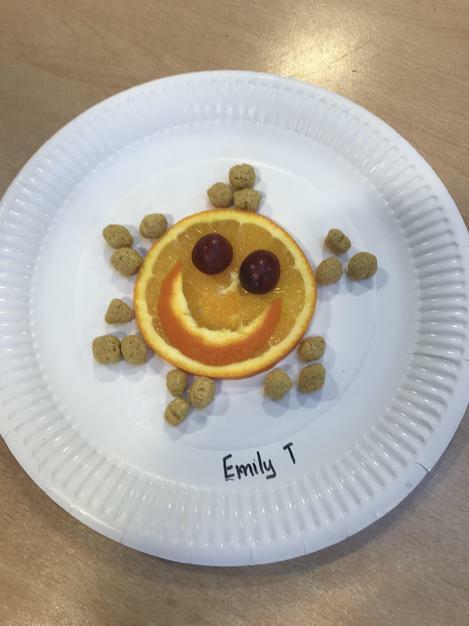 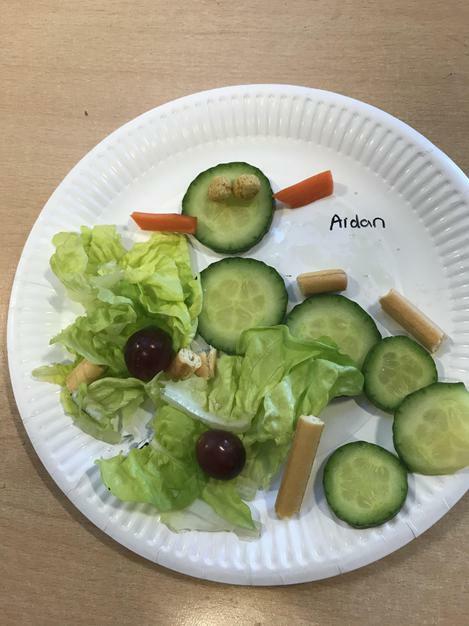 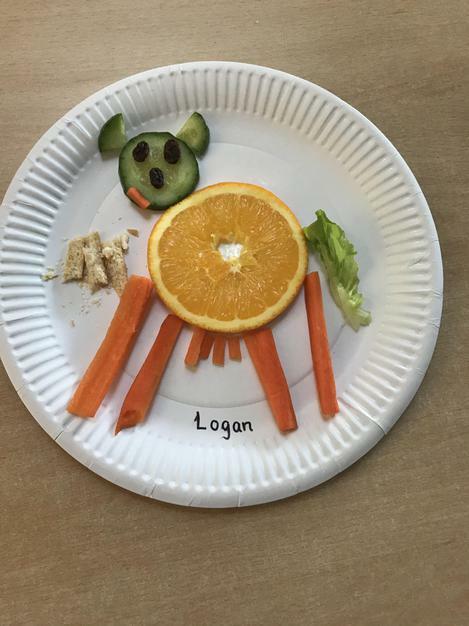 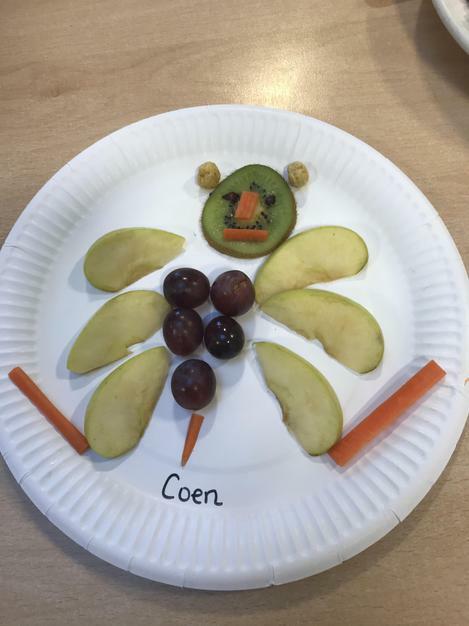 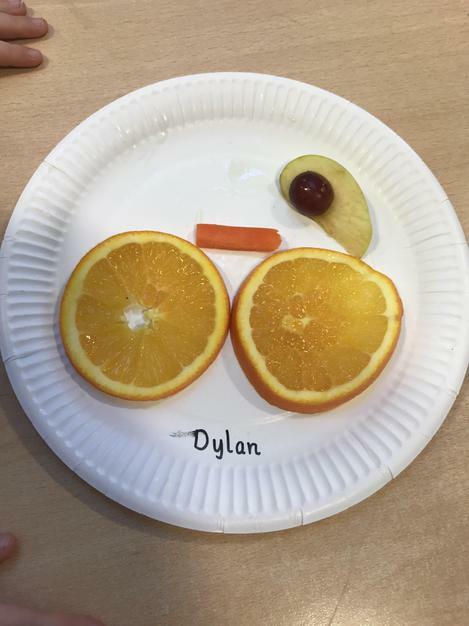 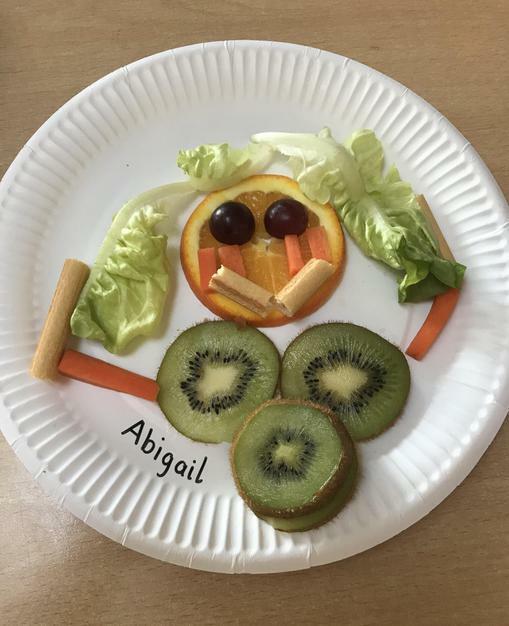 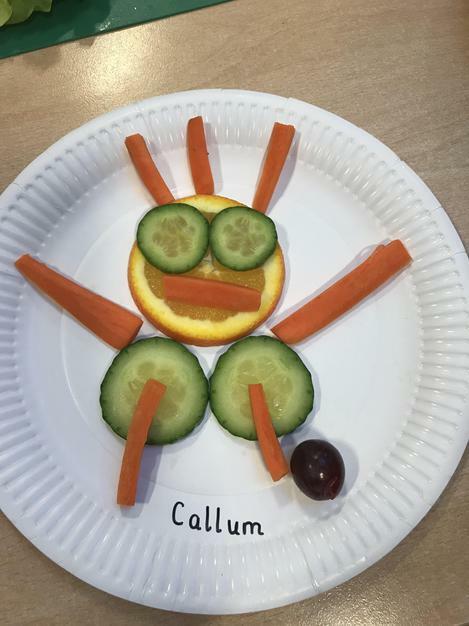 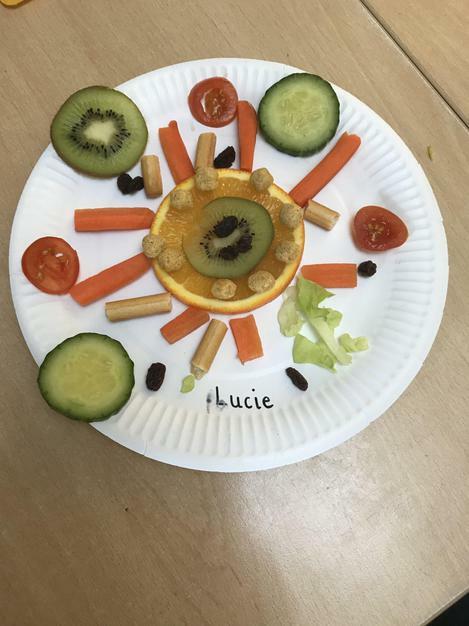 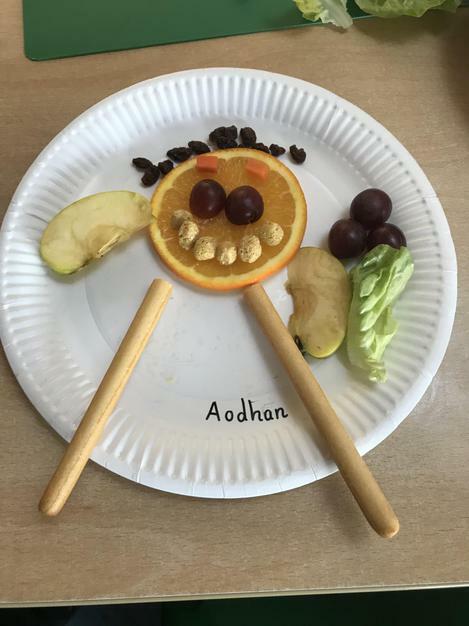 P.3’s may soon be making their own lunches, watch this space mums and dads! 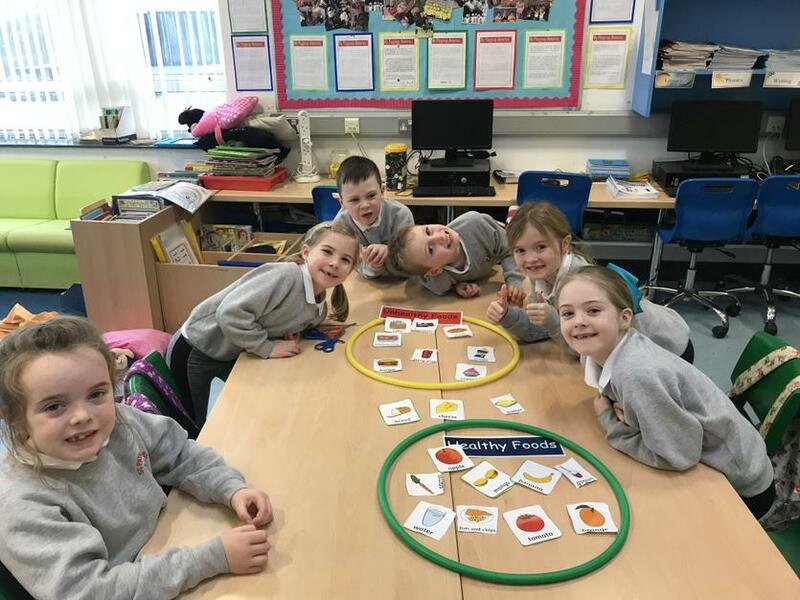 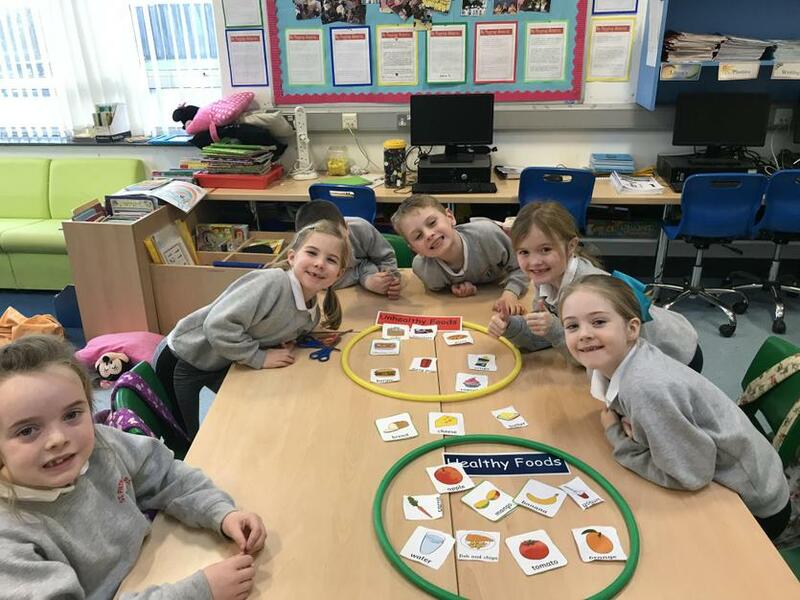 Planning our new topic- Food Glorious Food! 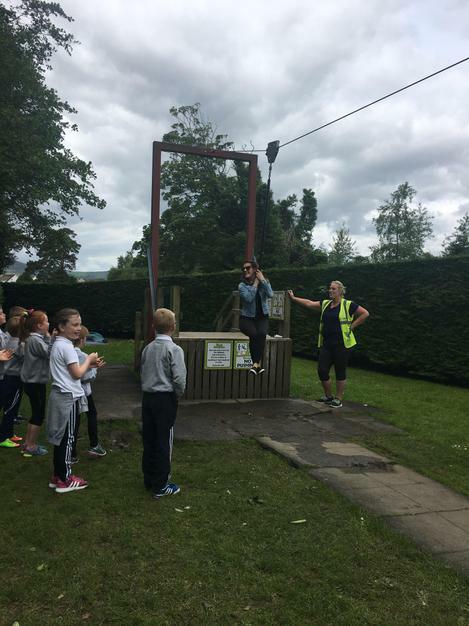 Today we said goodbye to our Red High students who have been with us for the last 8 weeks. 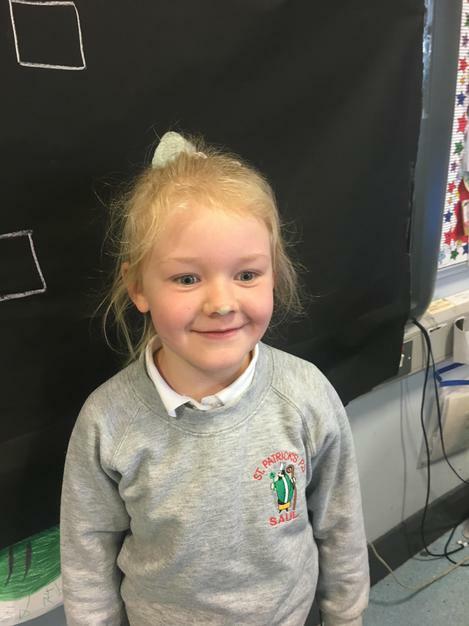 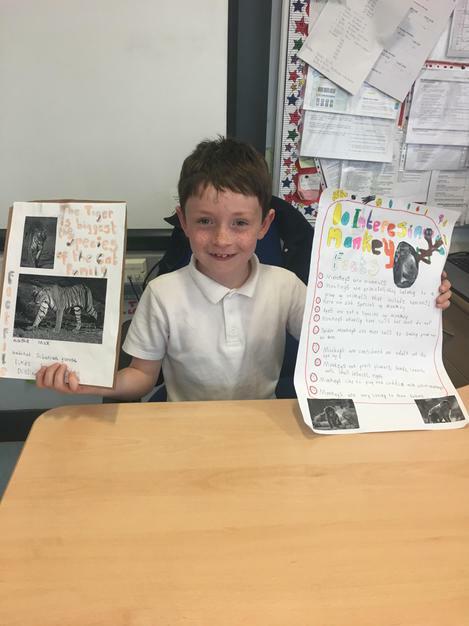 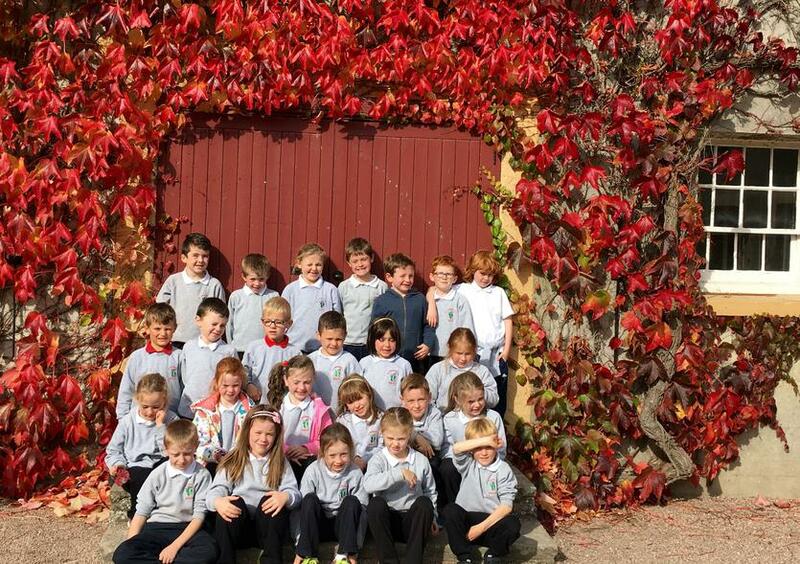 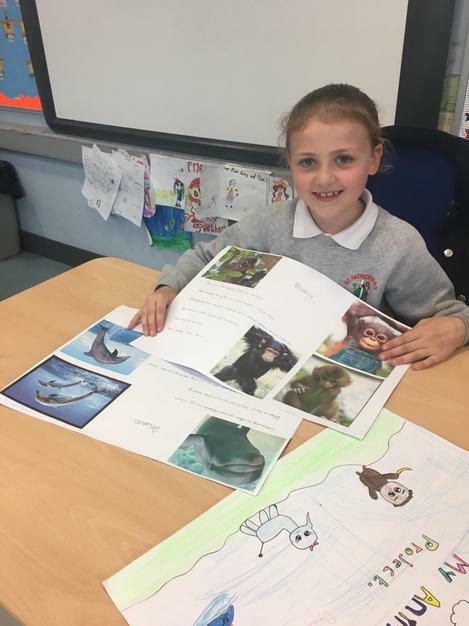 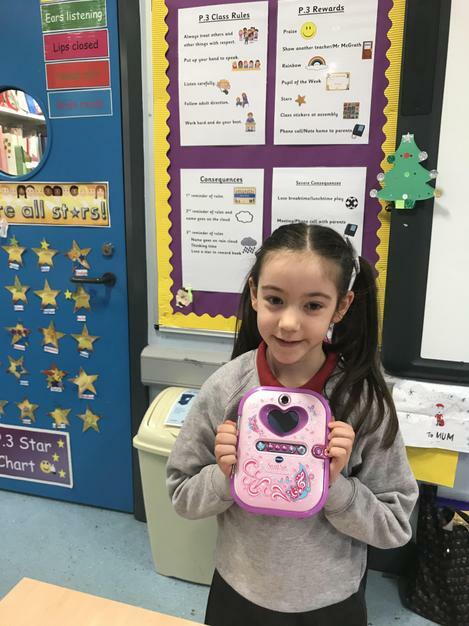 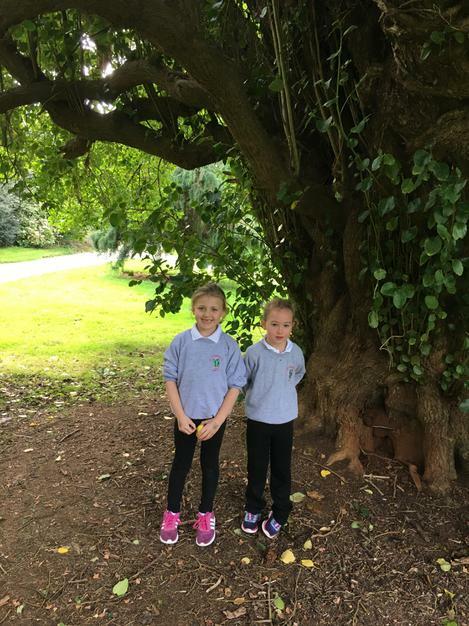 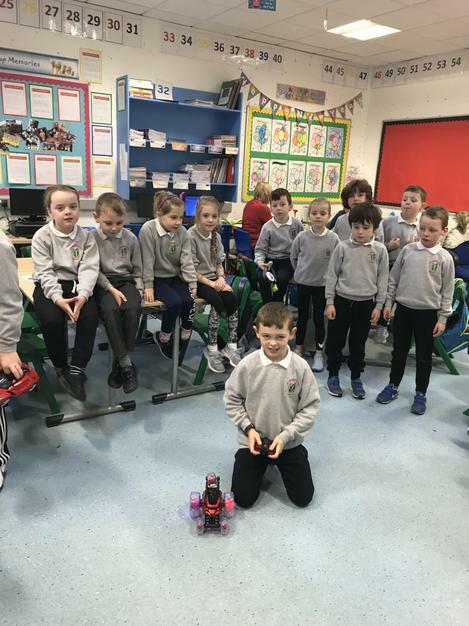 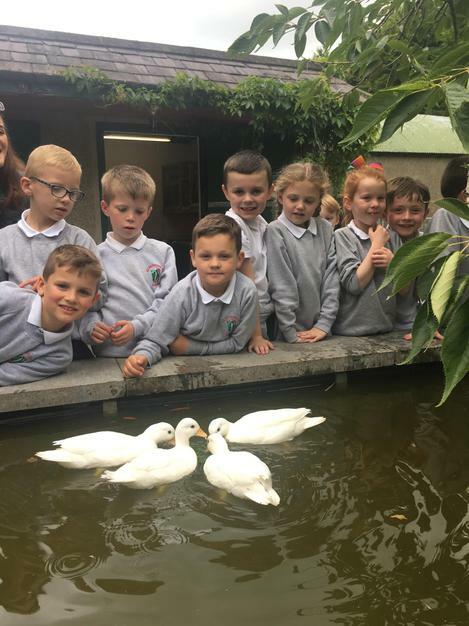 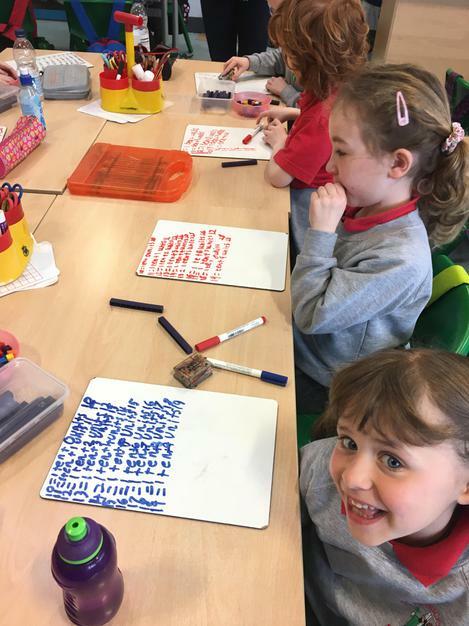 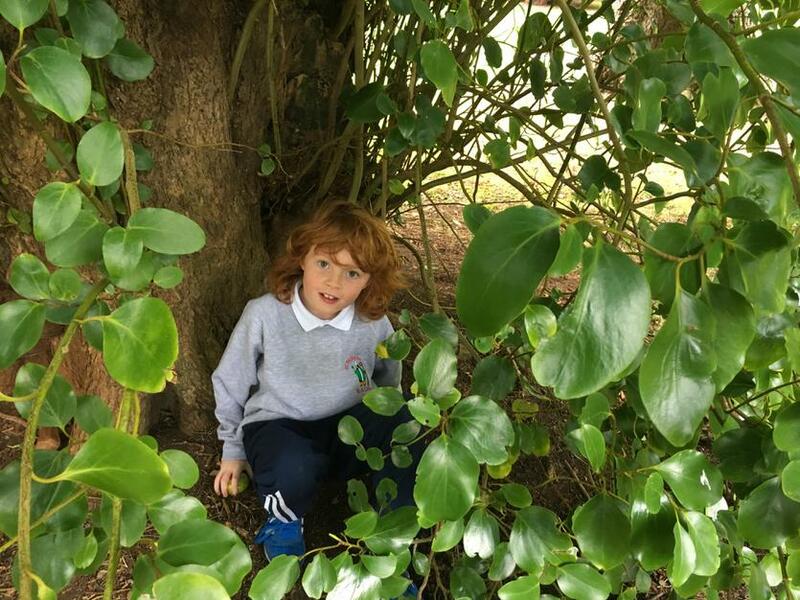 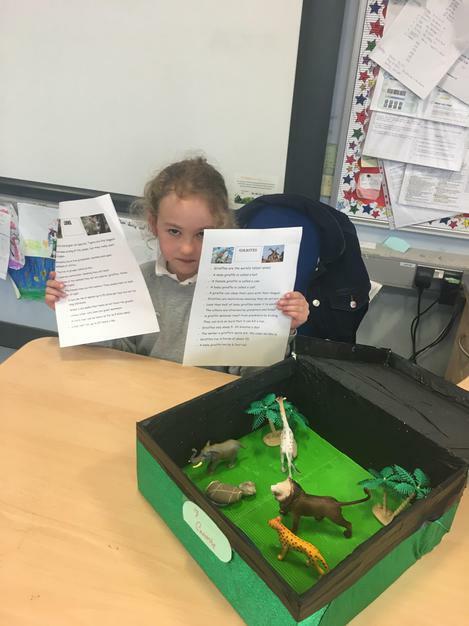 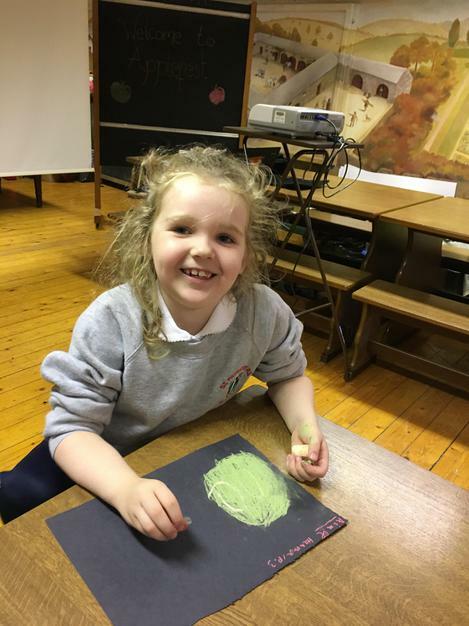 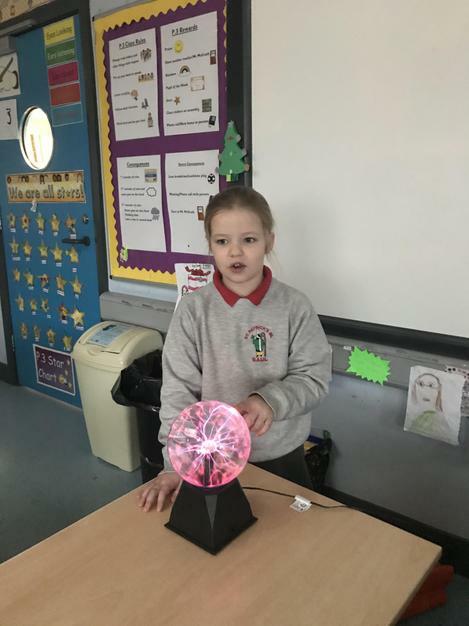 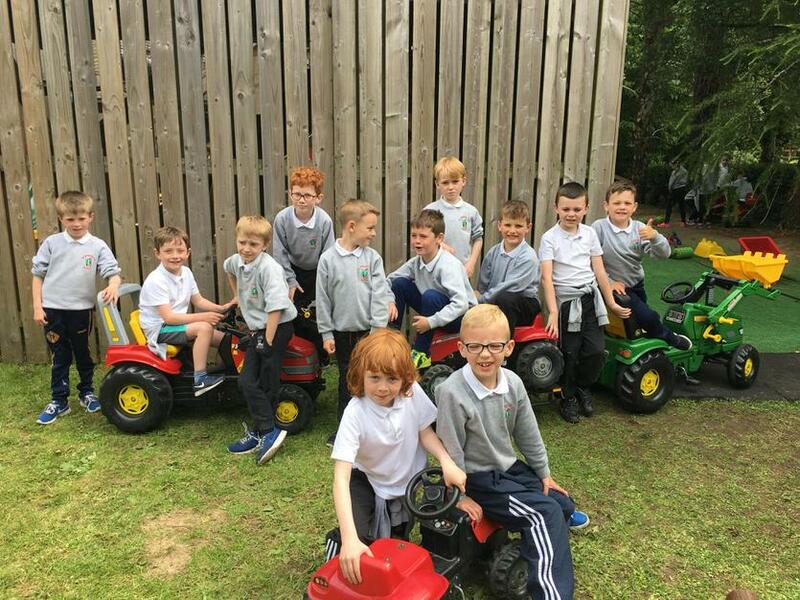 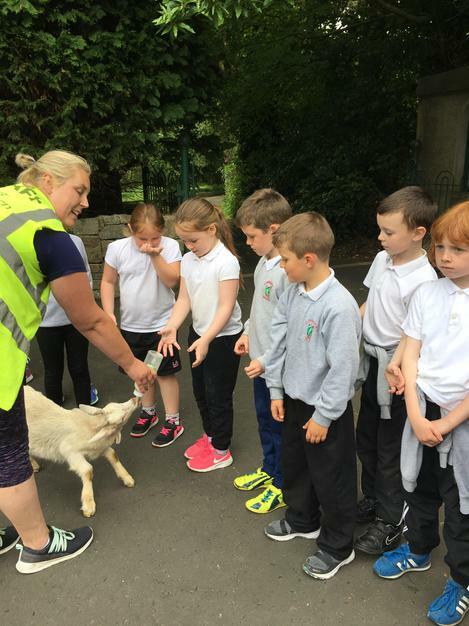 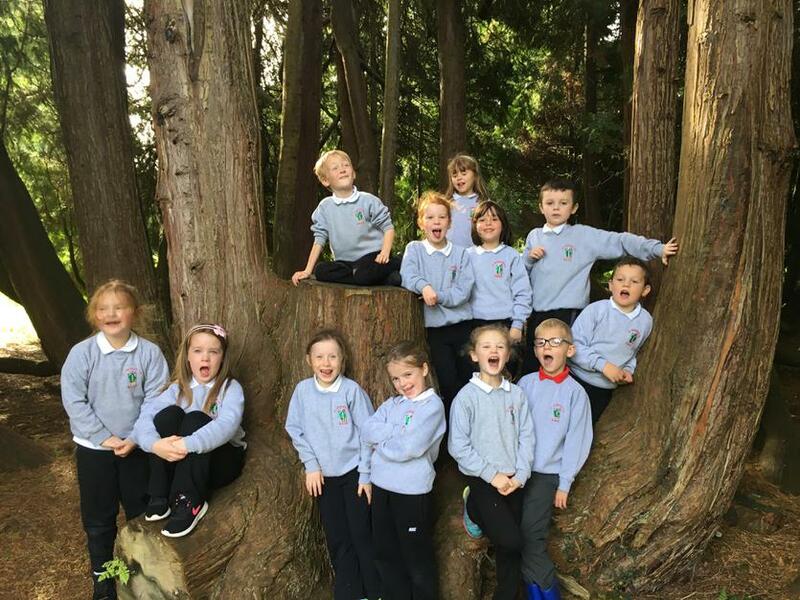 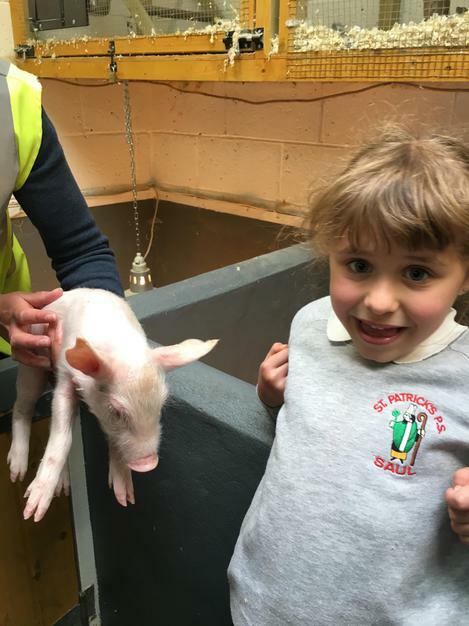 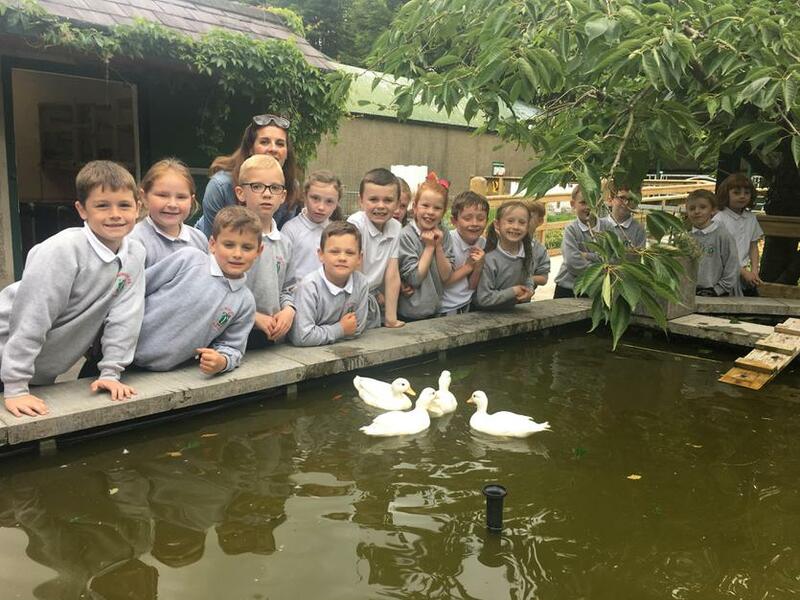 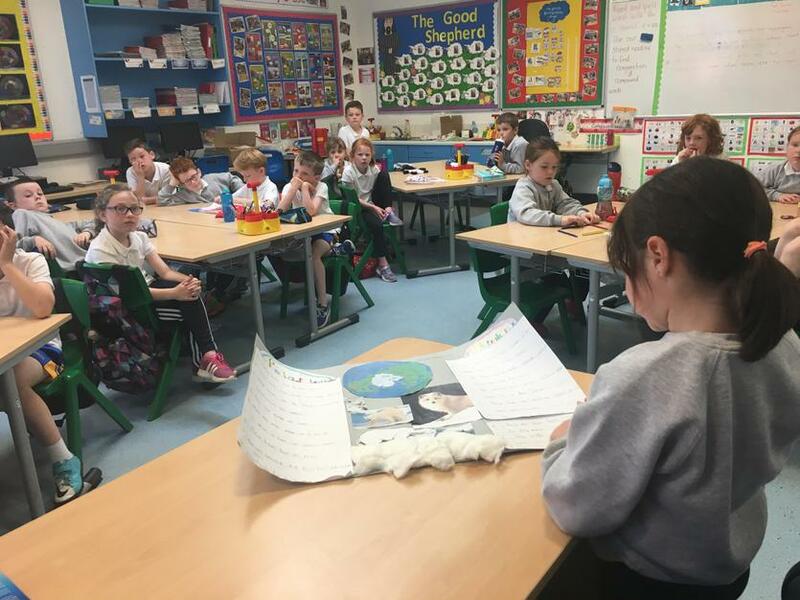 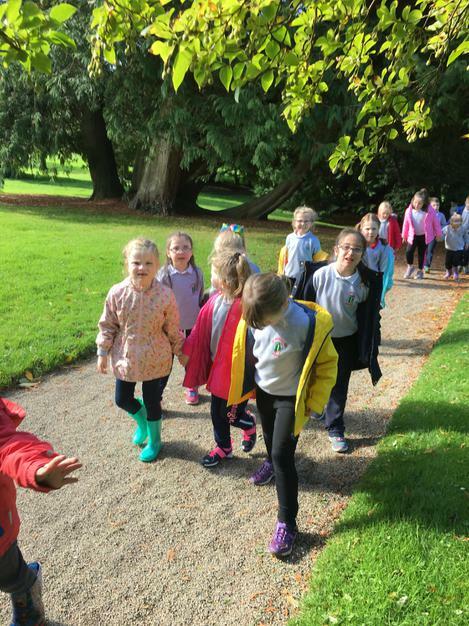 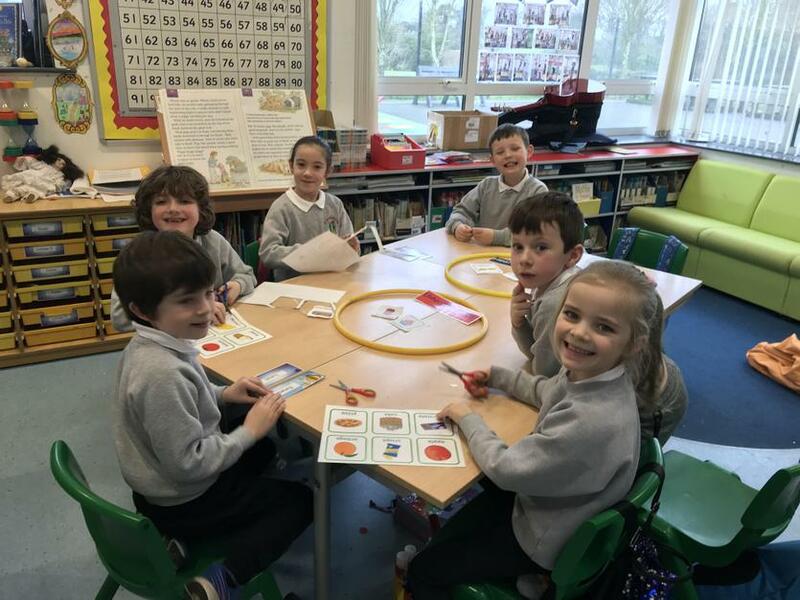 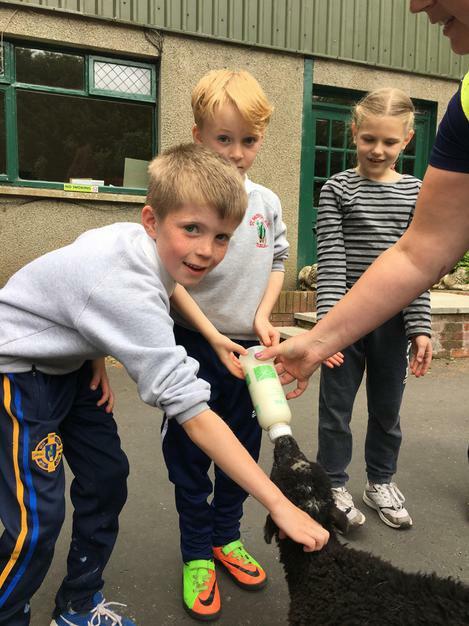 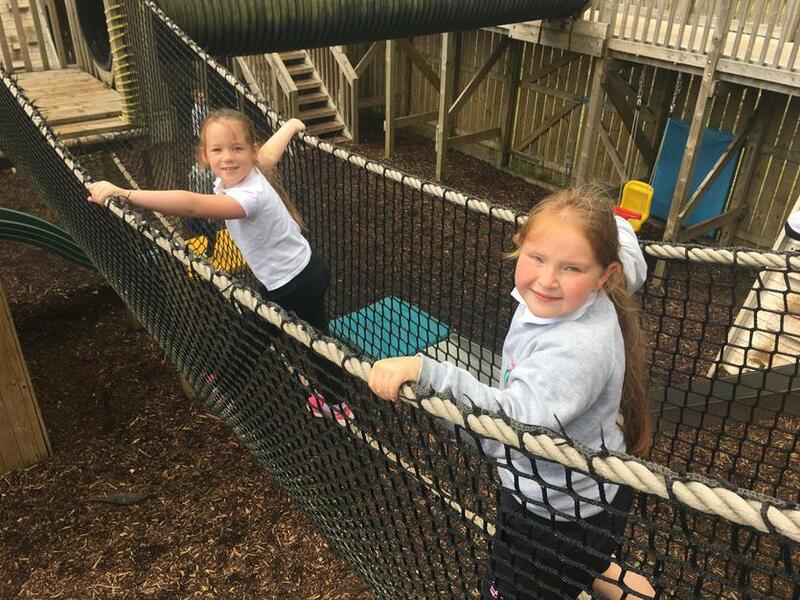 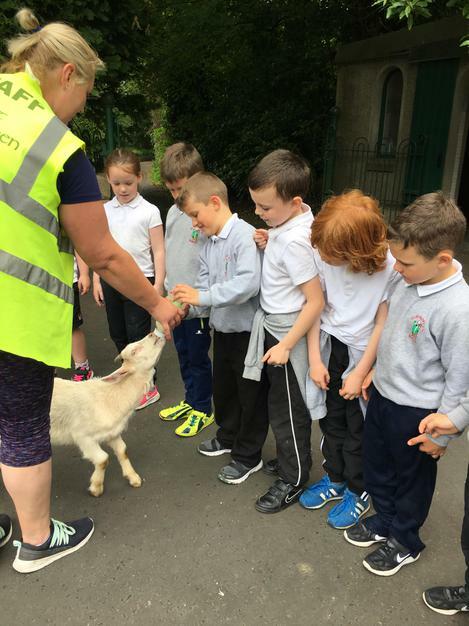 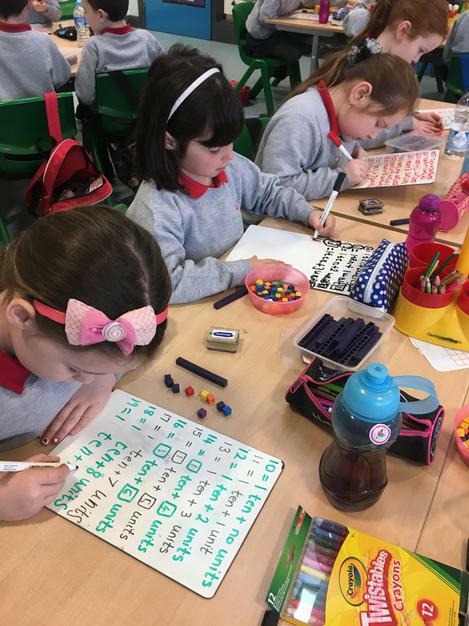 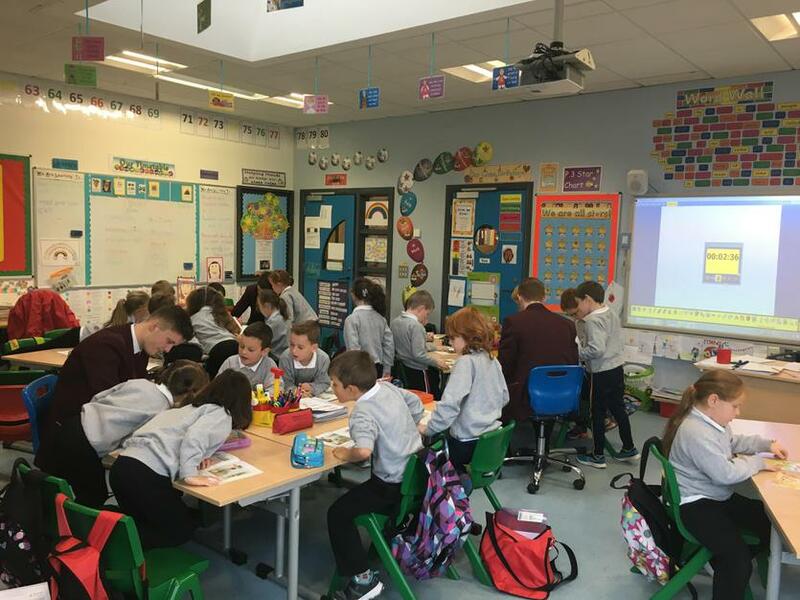 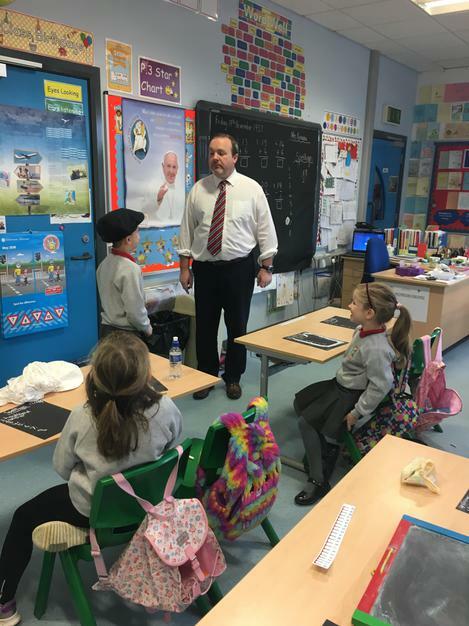 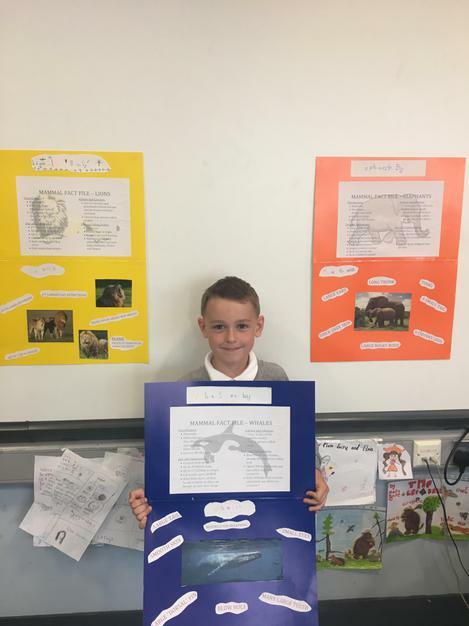 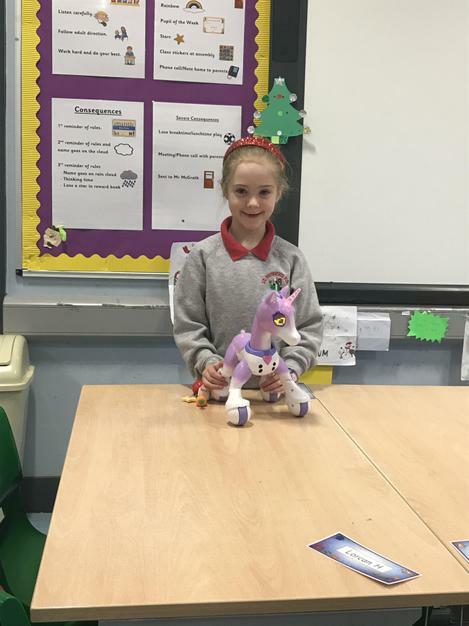 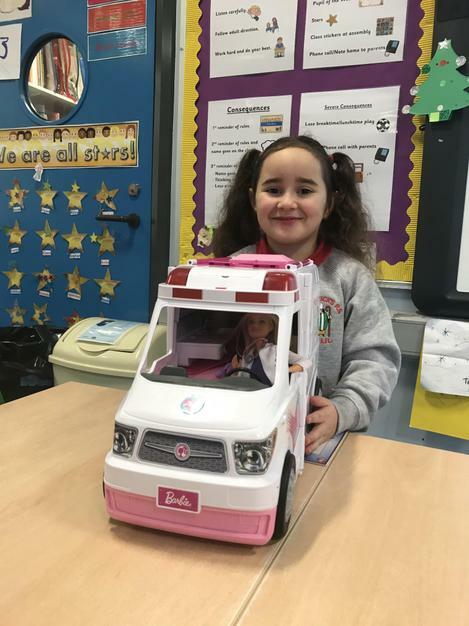 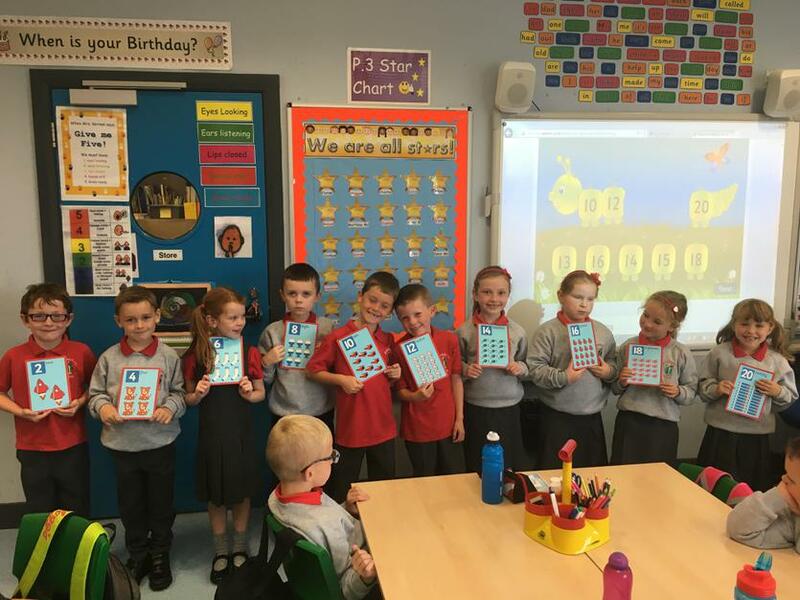 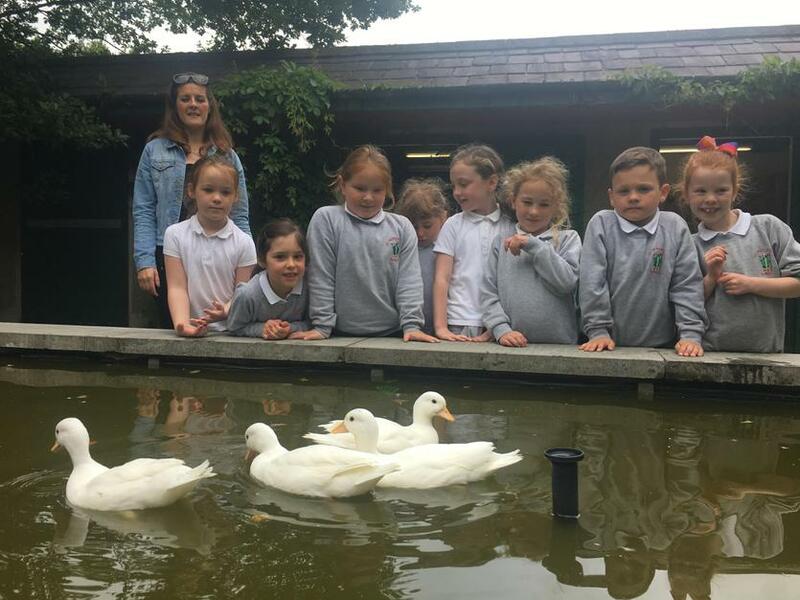 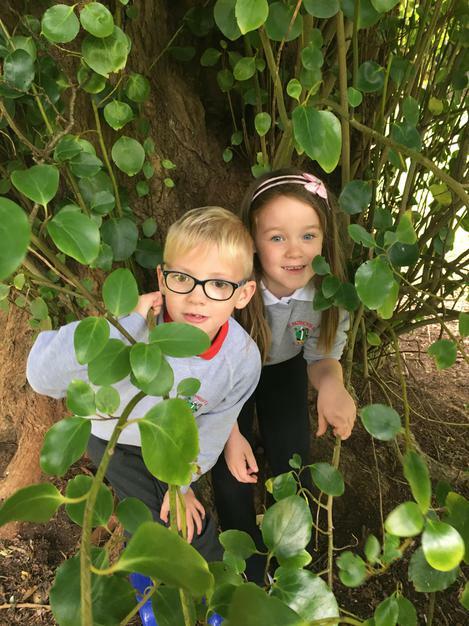 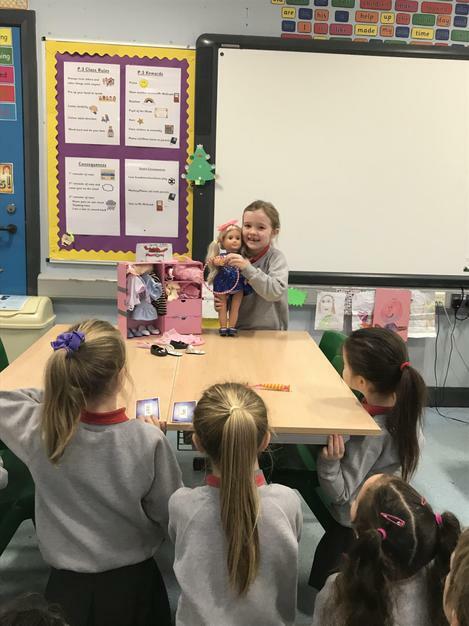 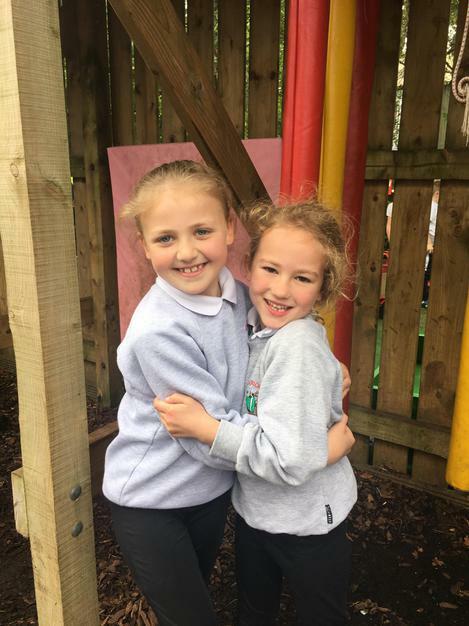 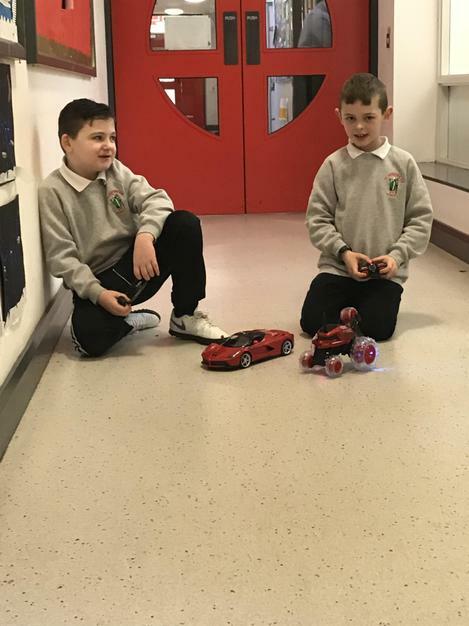 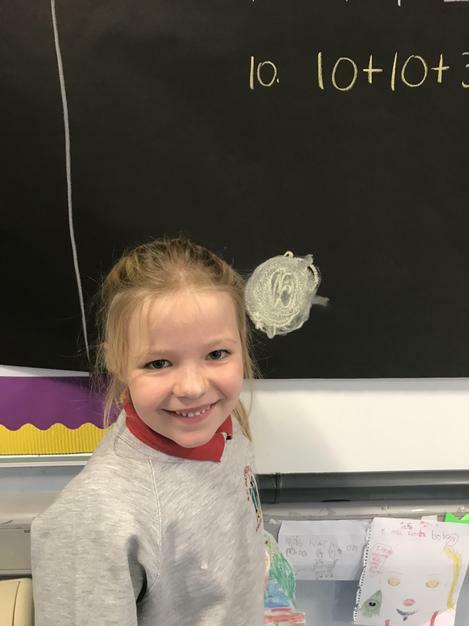 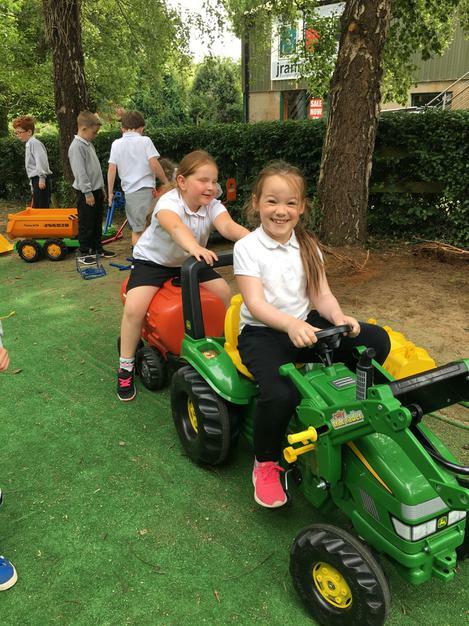 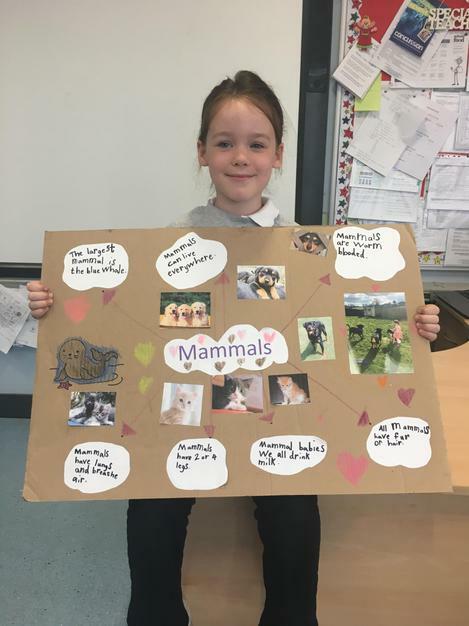 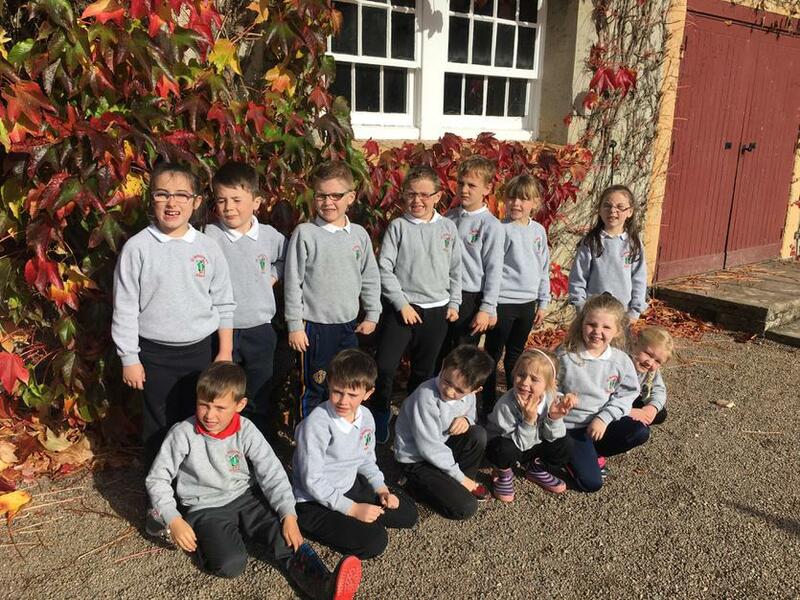 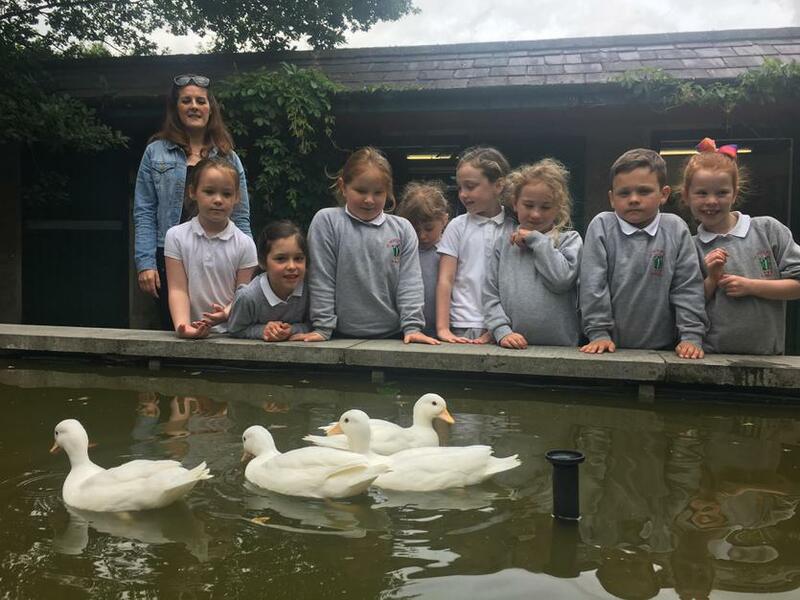 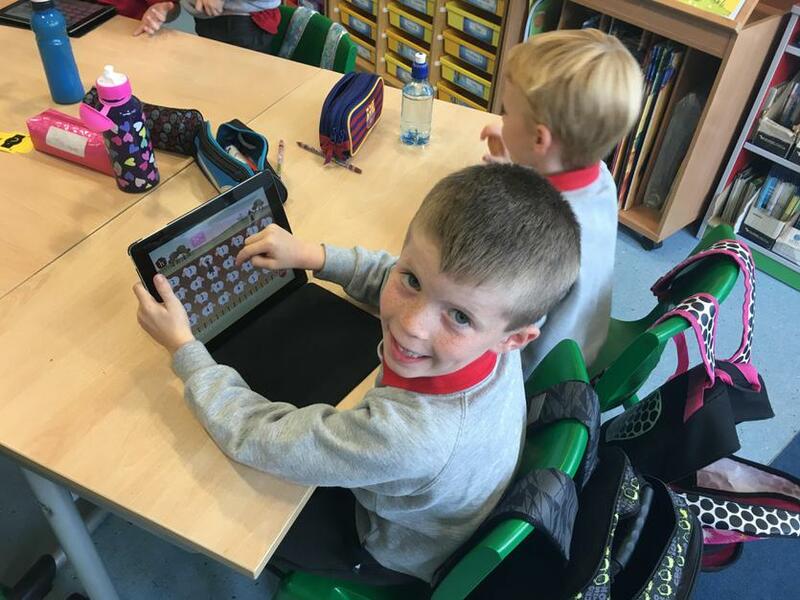 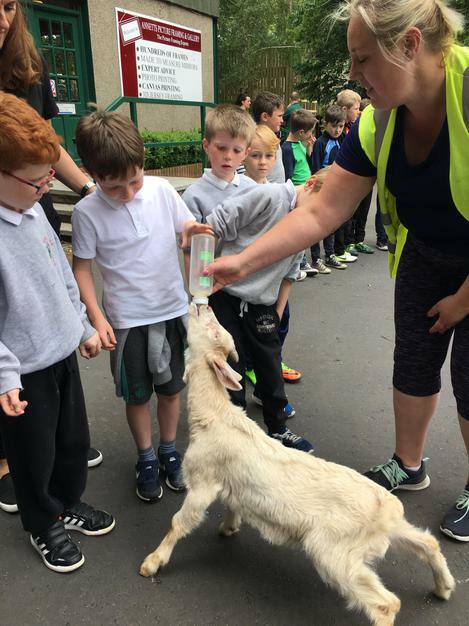 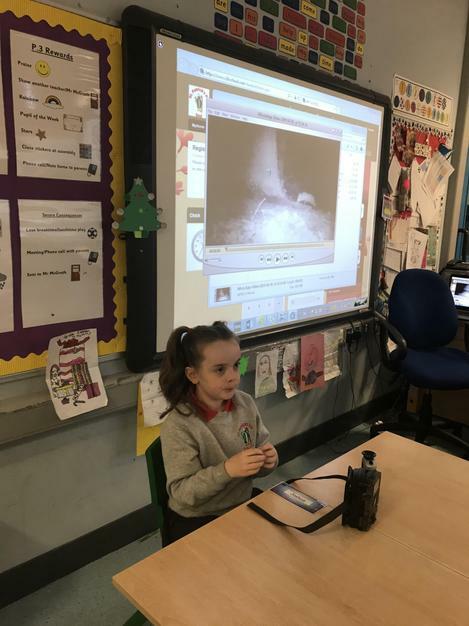 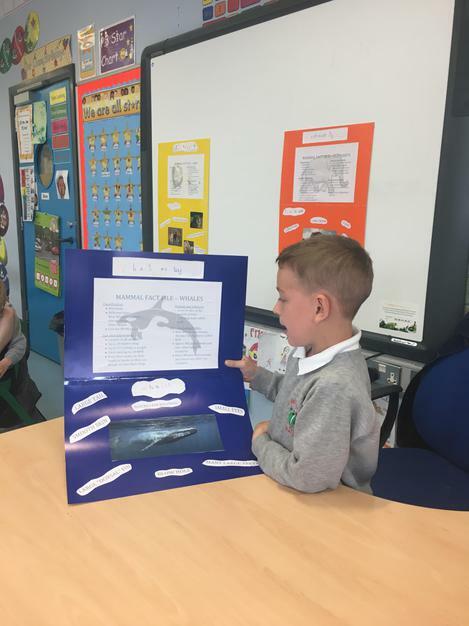 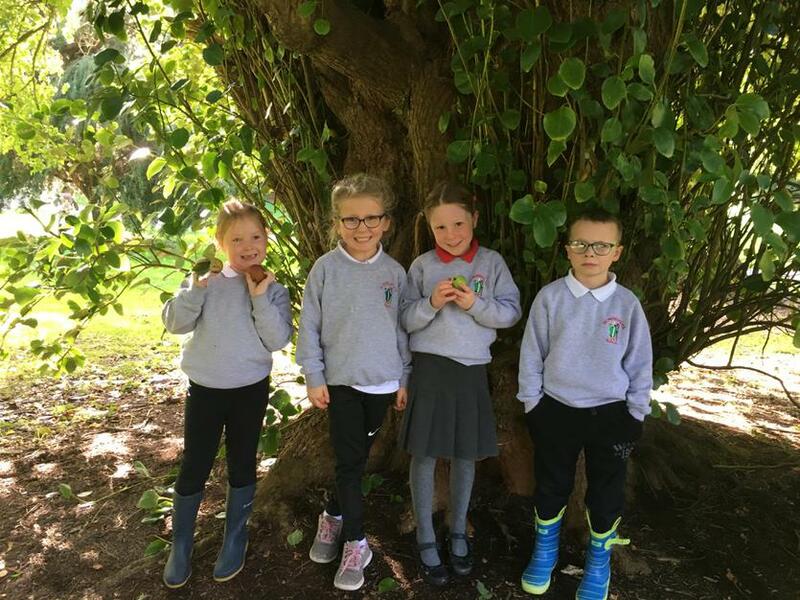 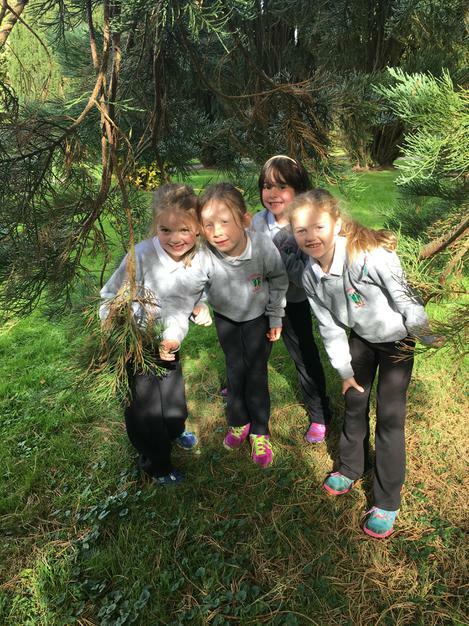 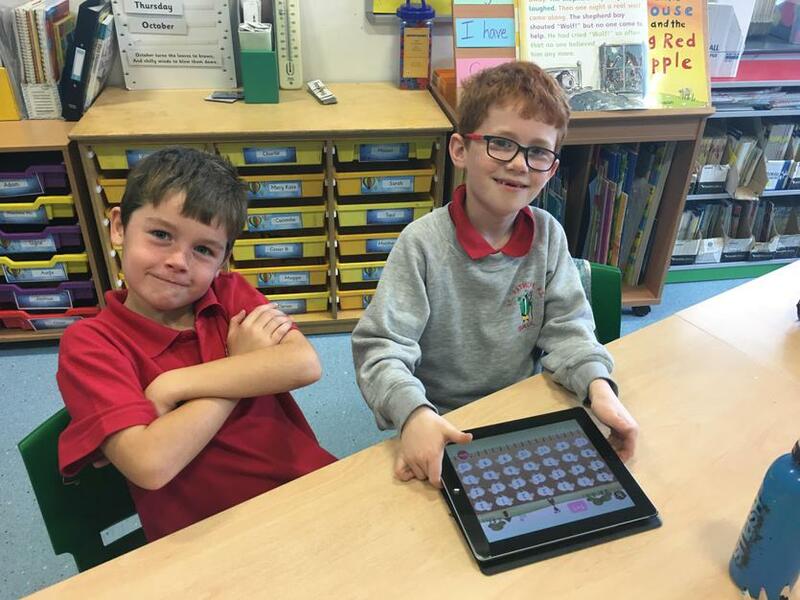 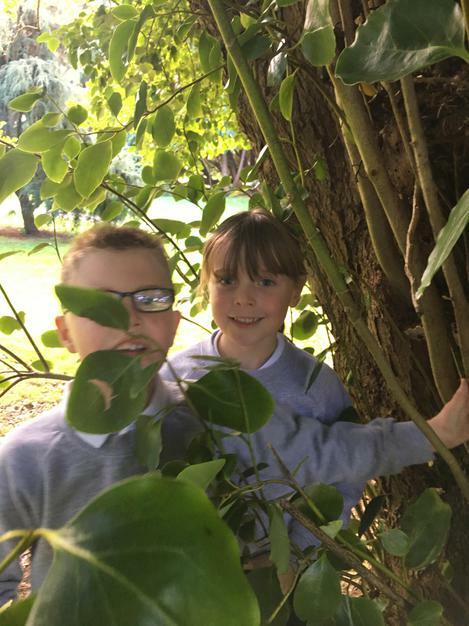 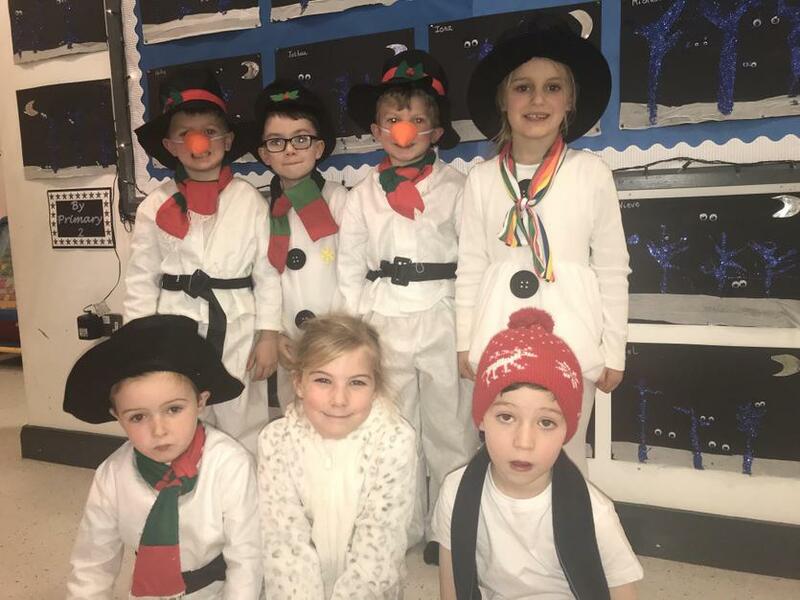 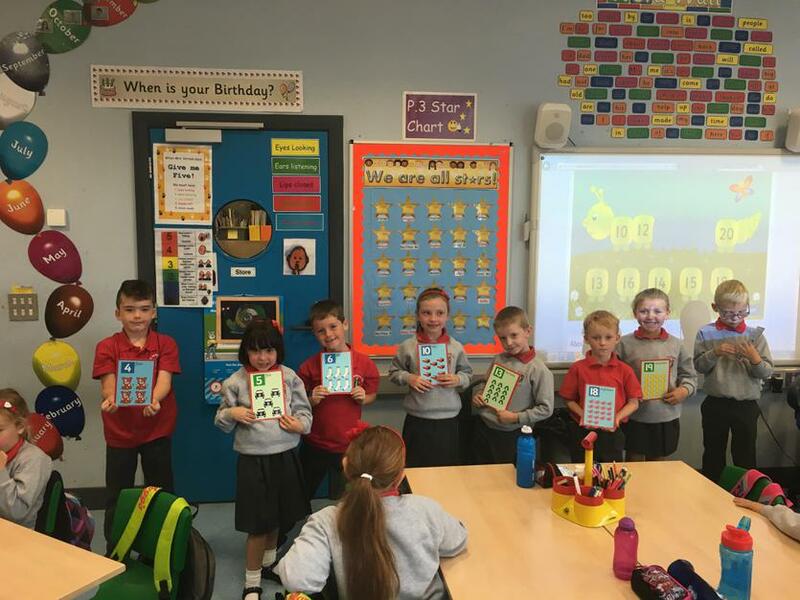 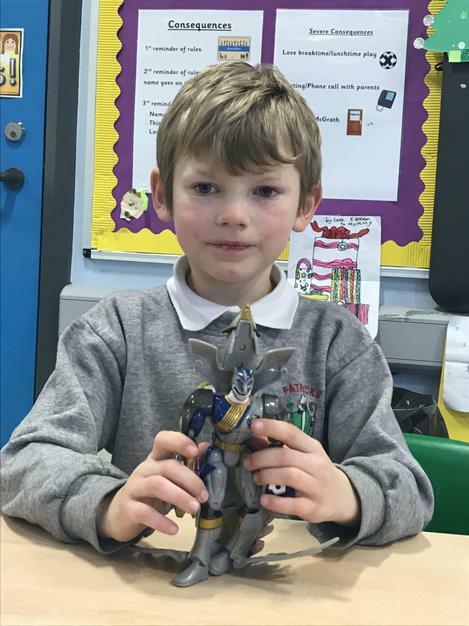 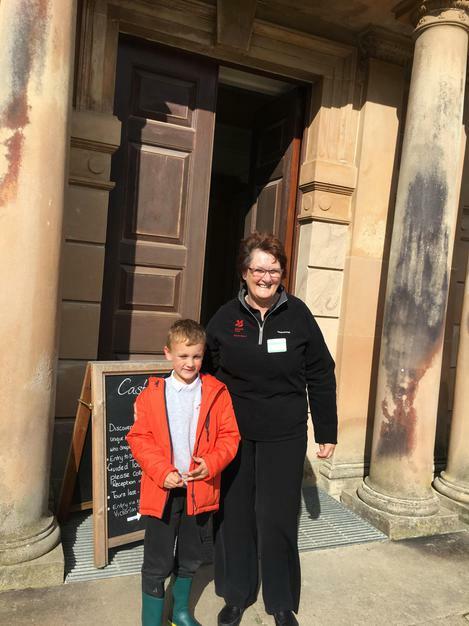 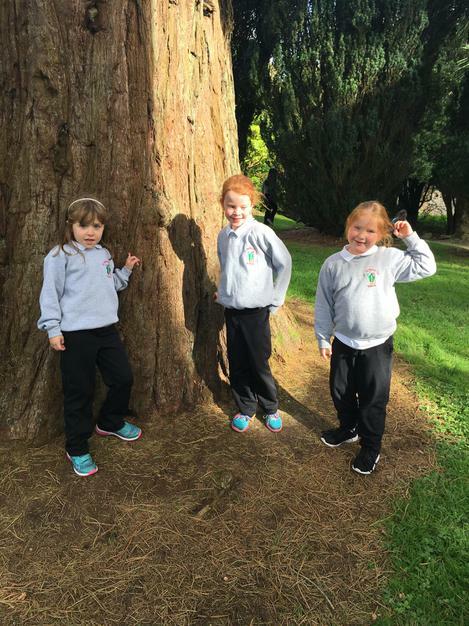 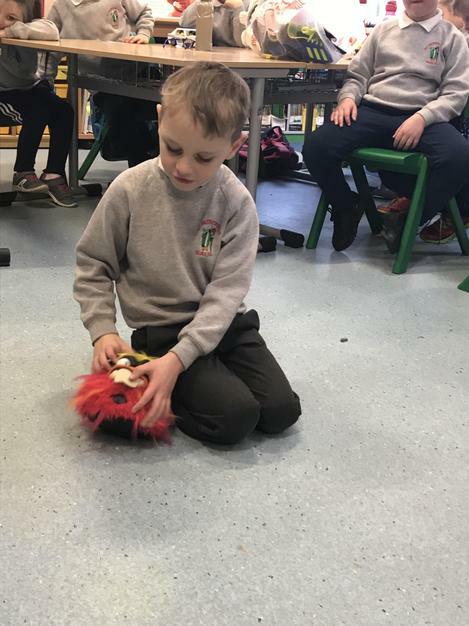 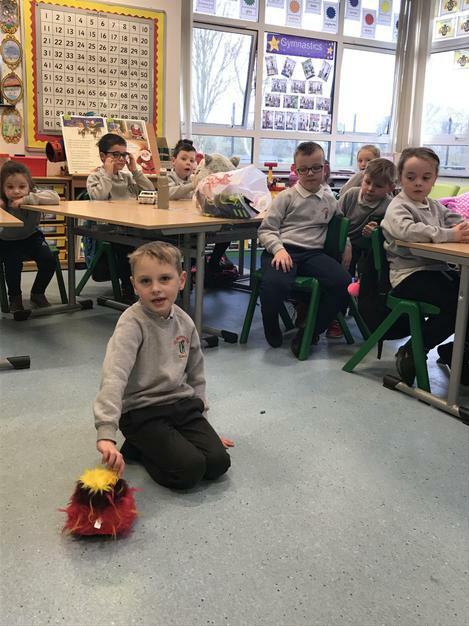 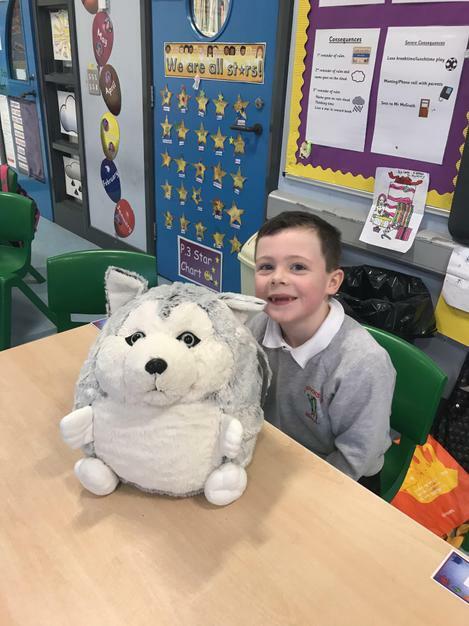 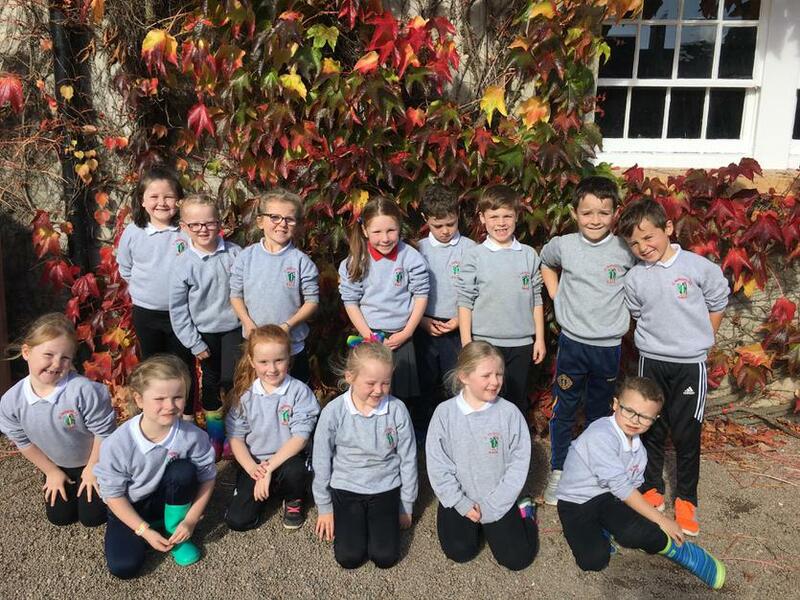 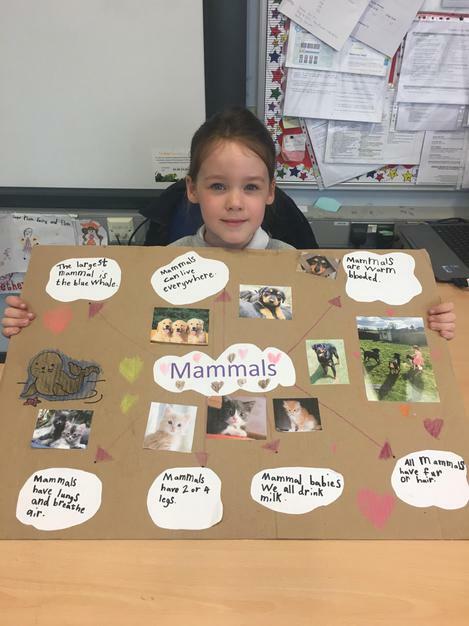 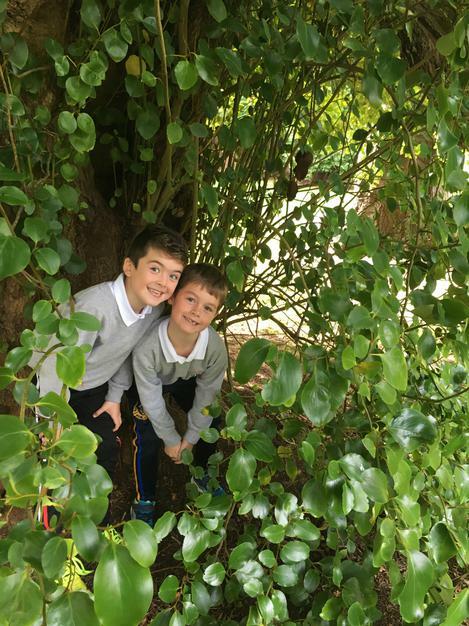 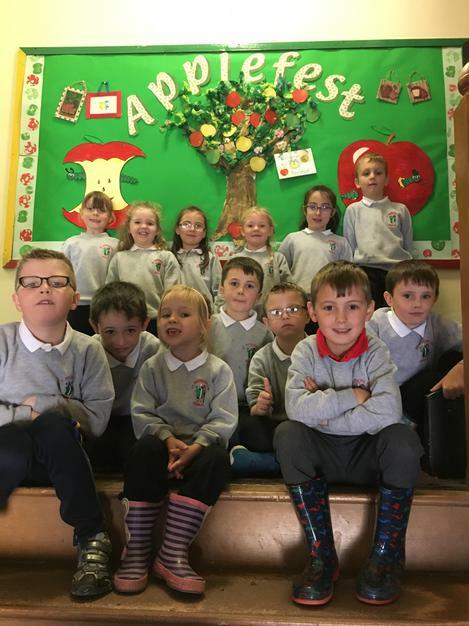 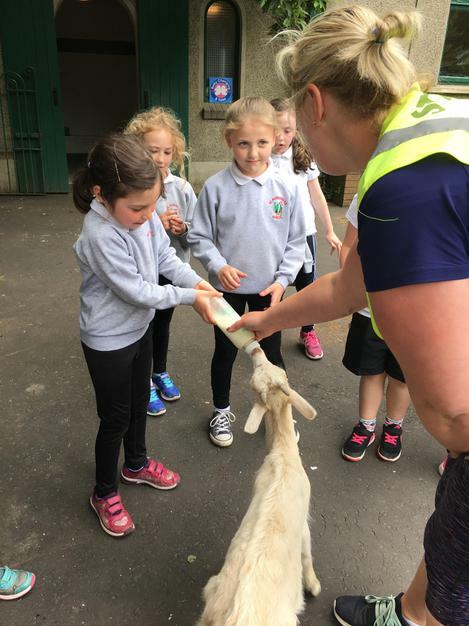 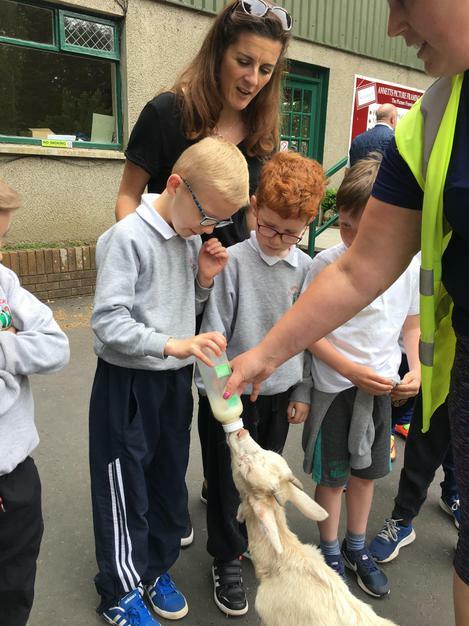 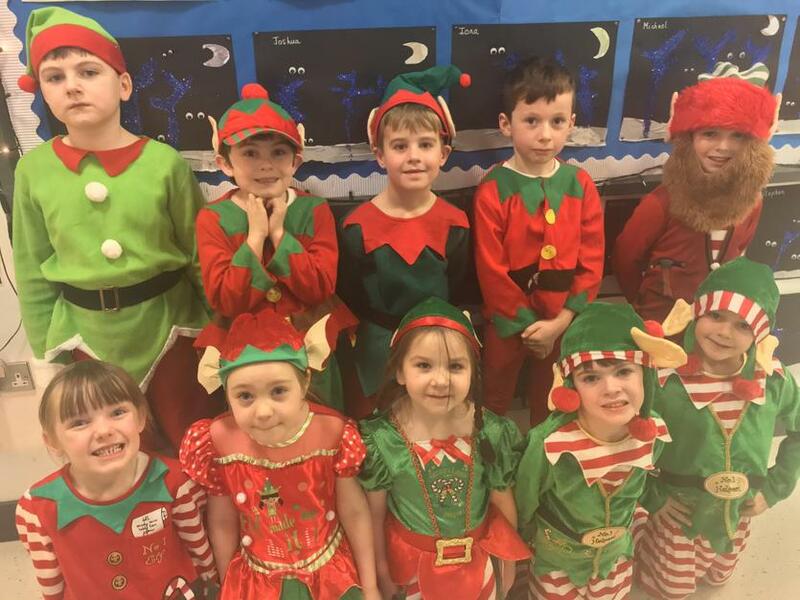 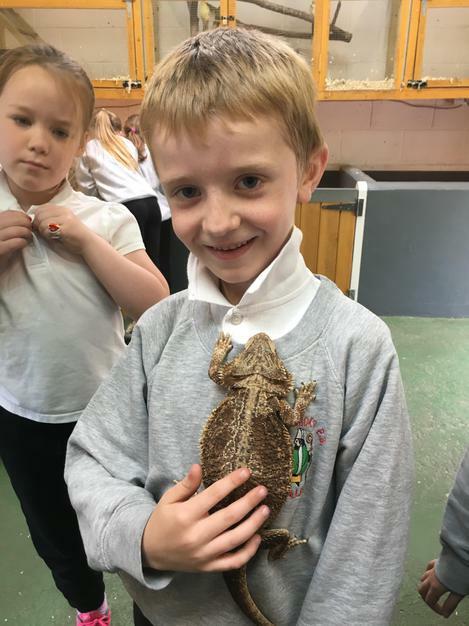 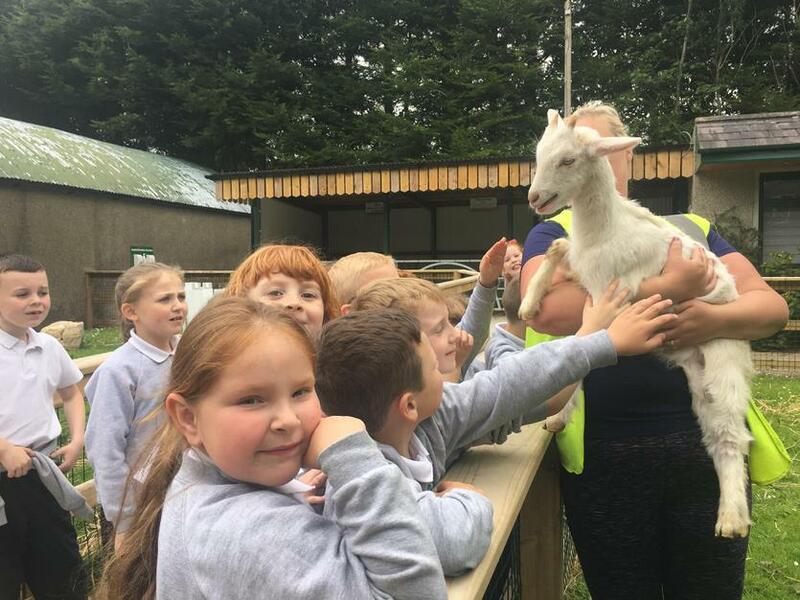 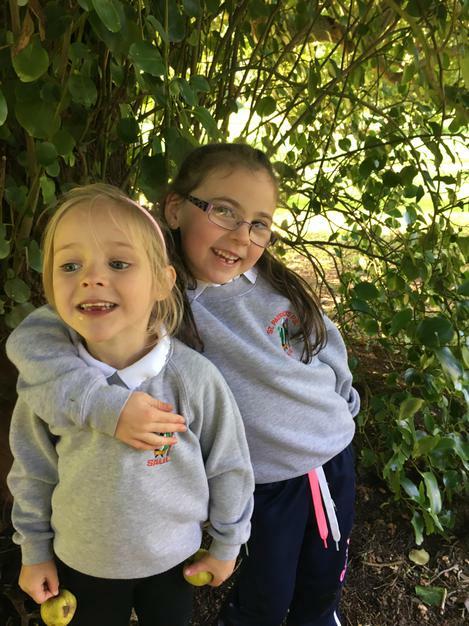 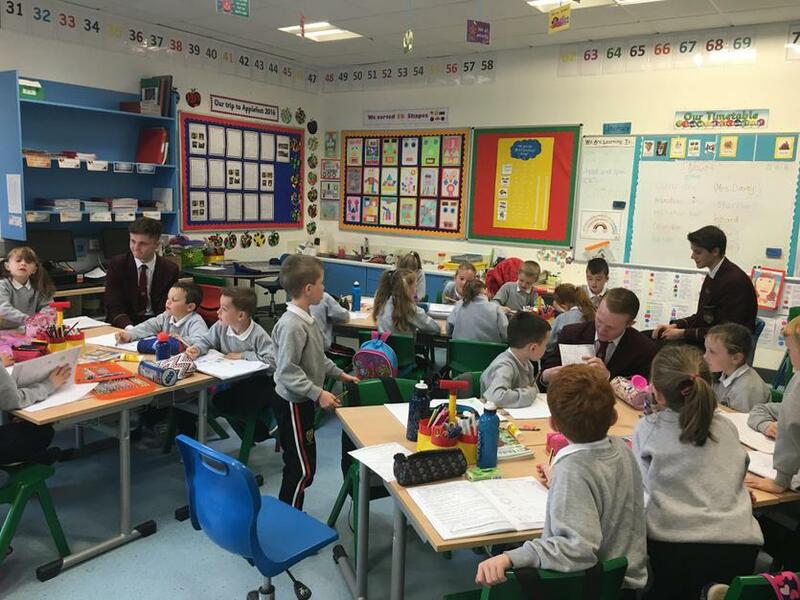 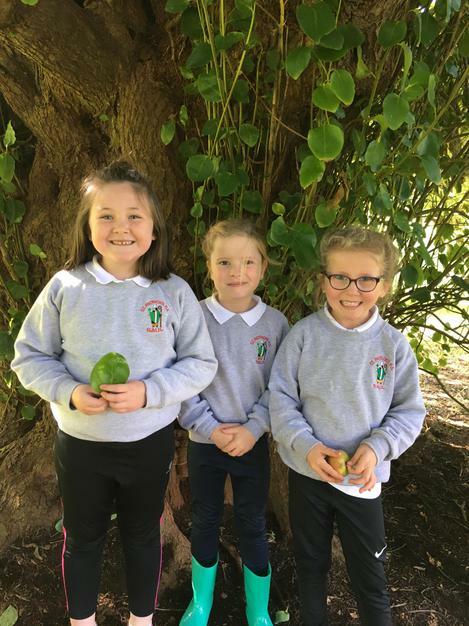 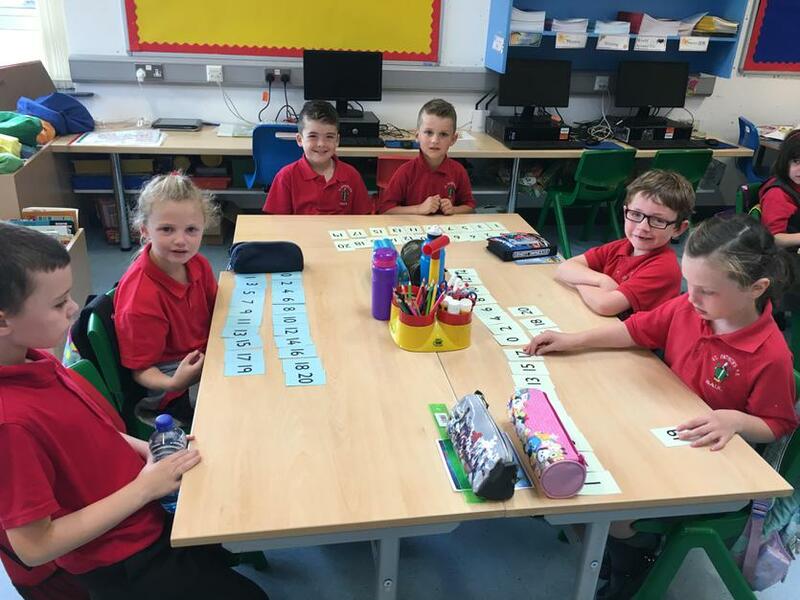 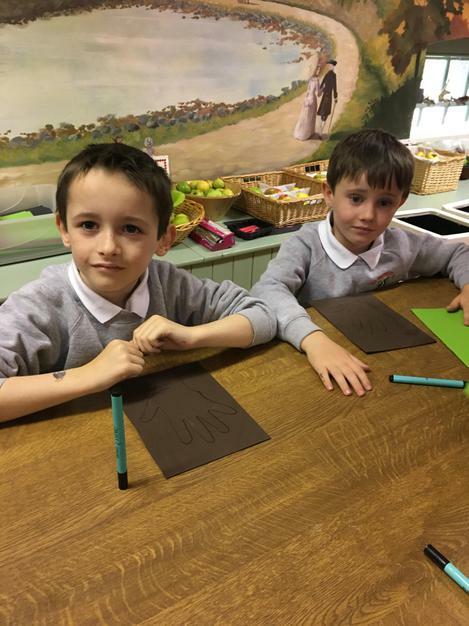 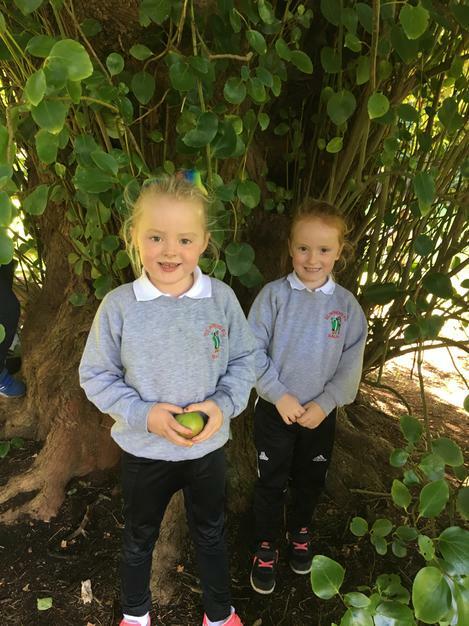 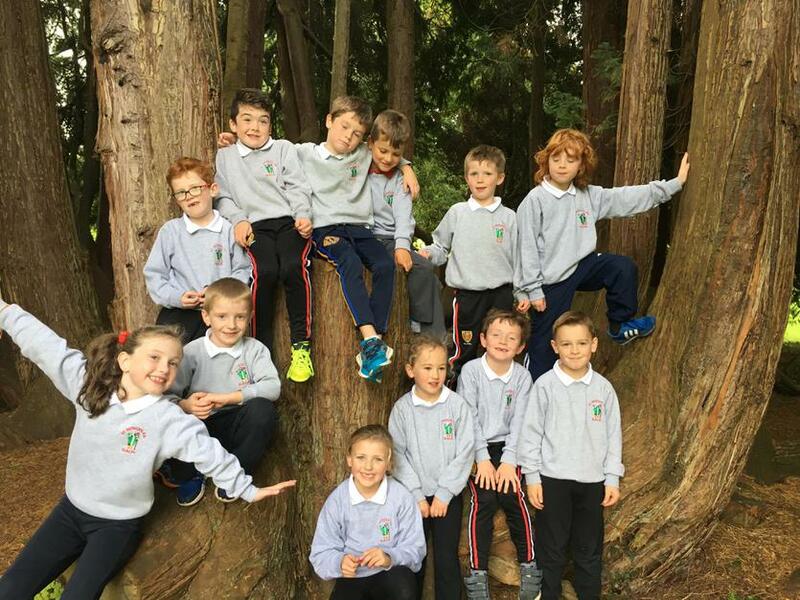 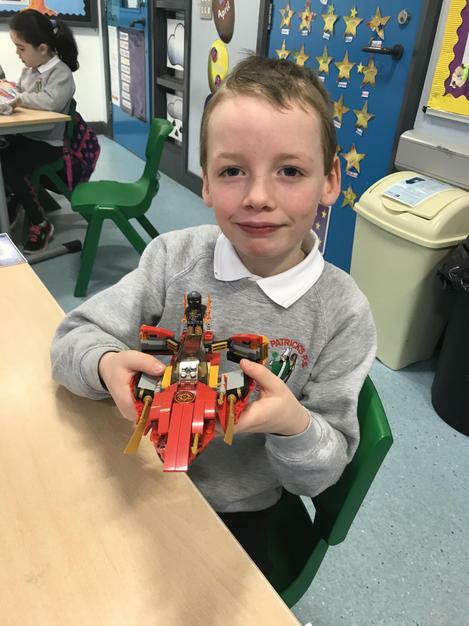 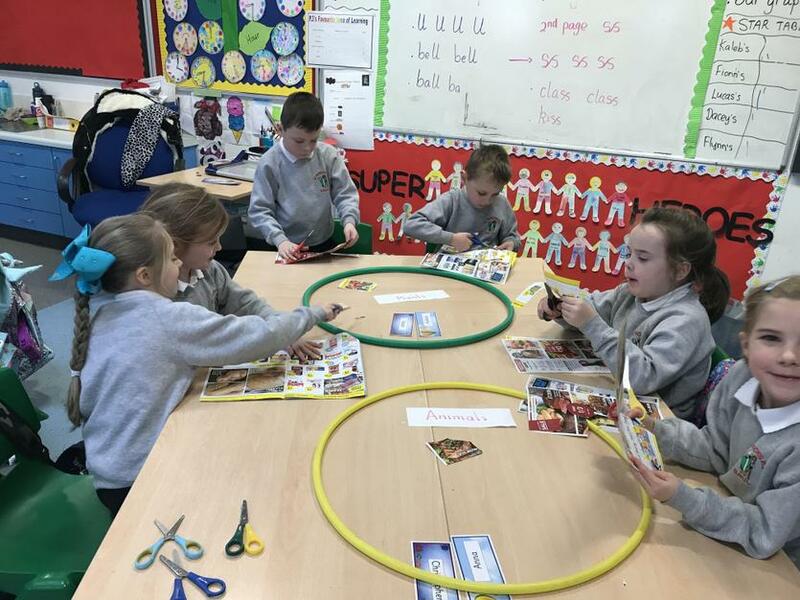 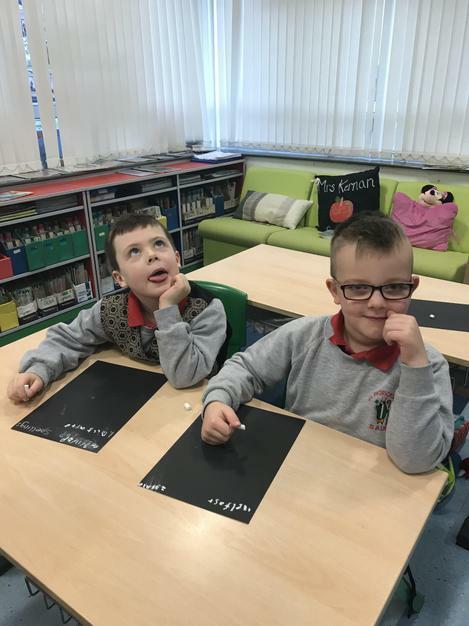 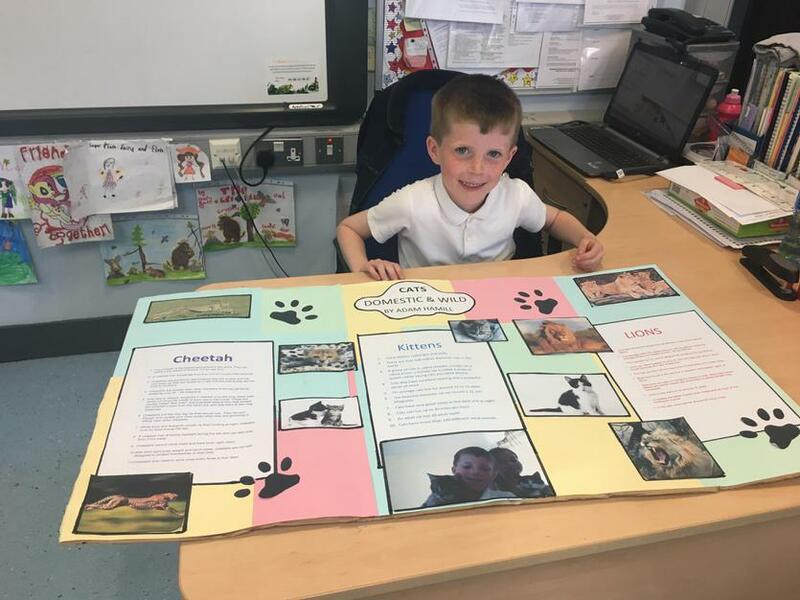 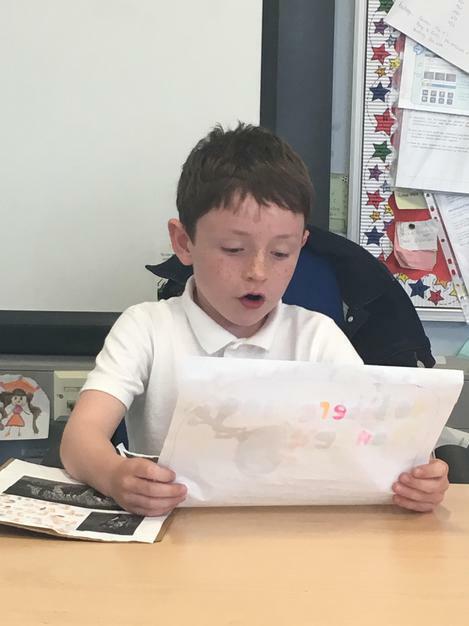 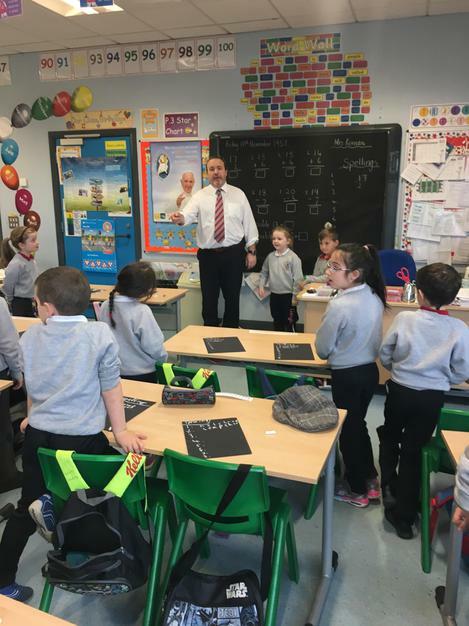 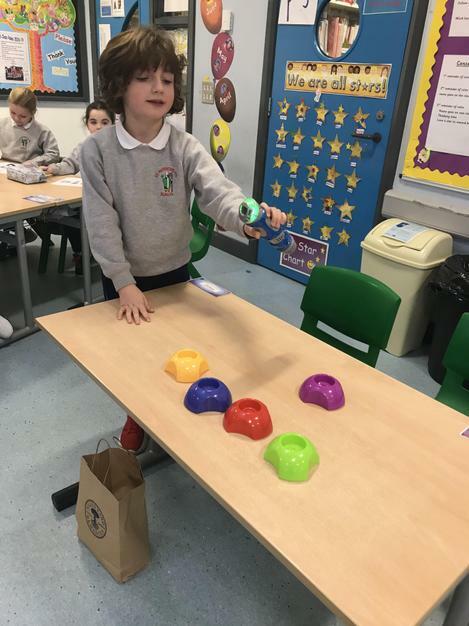 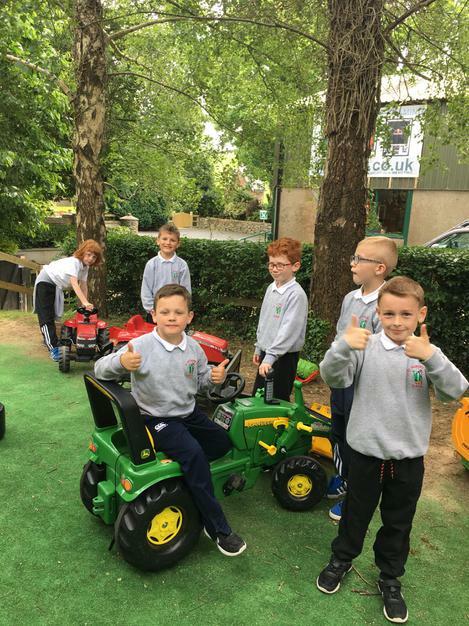 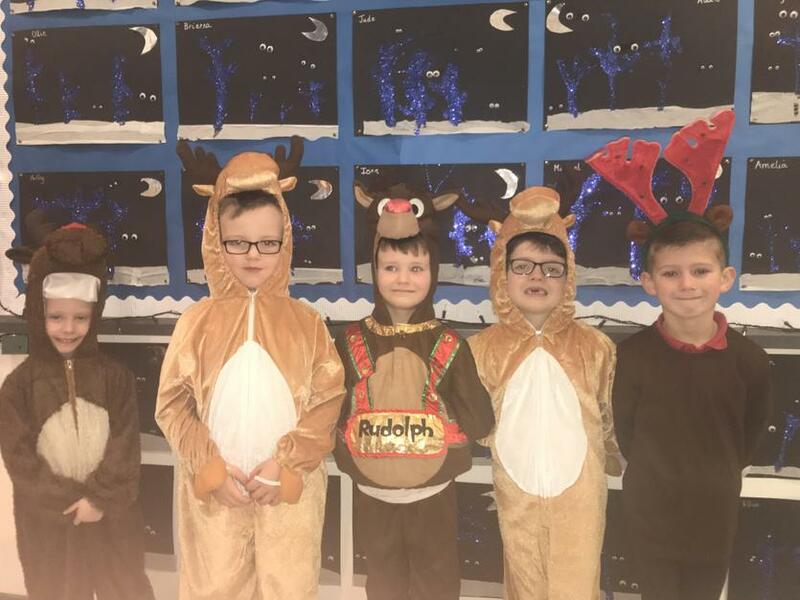 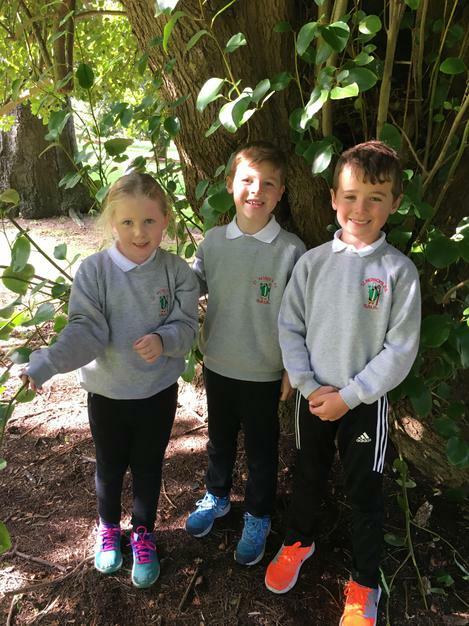 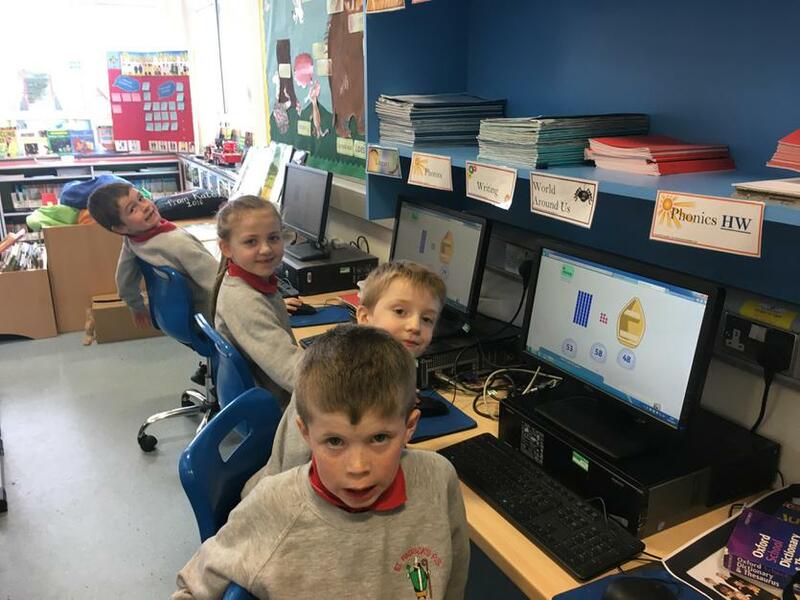 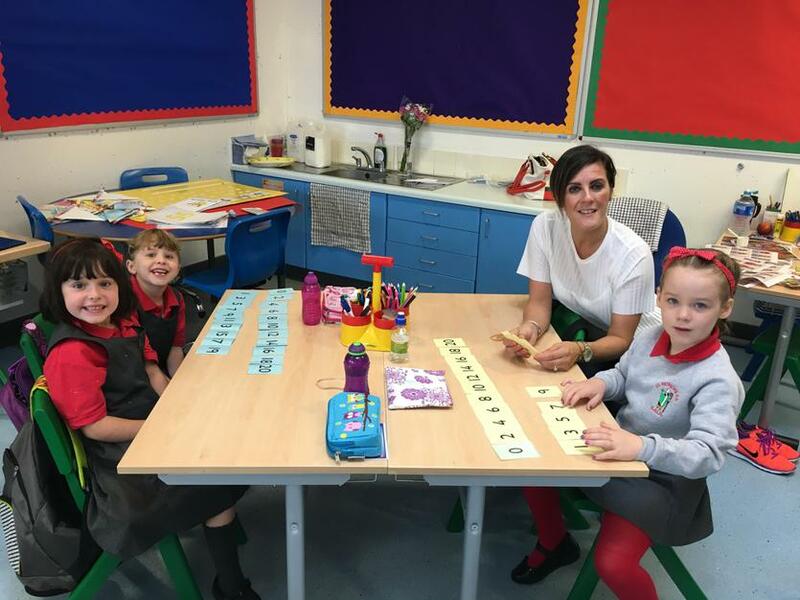 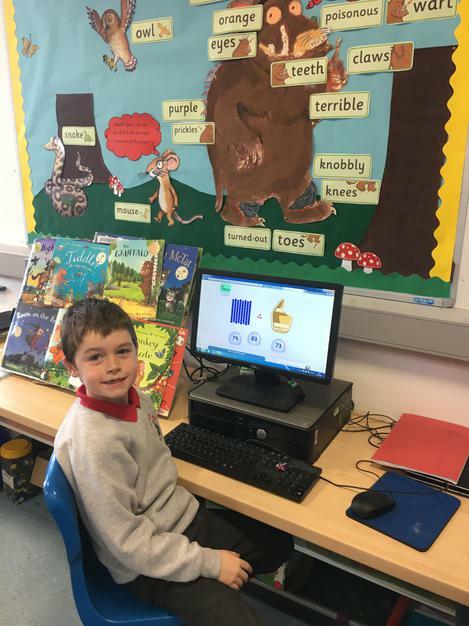 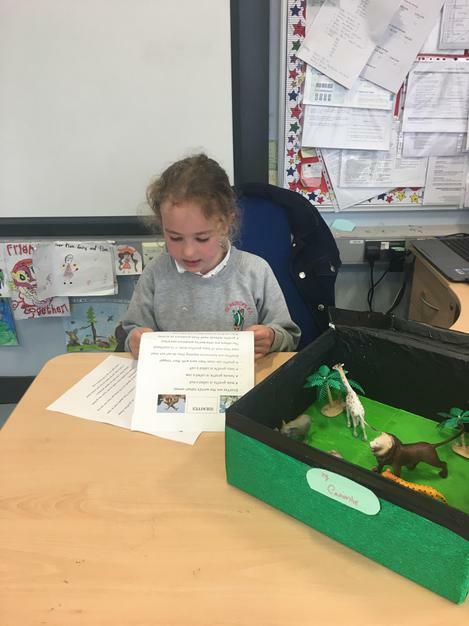 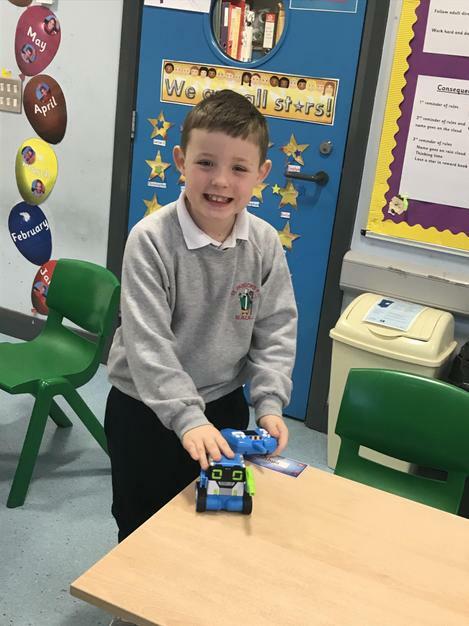 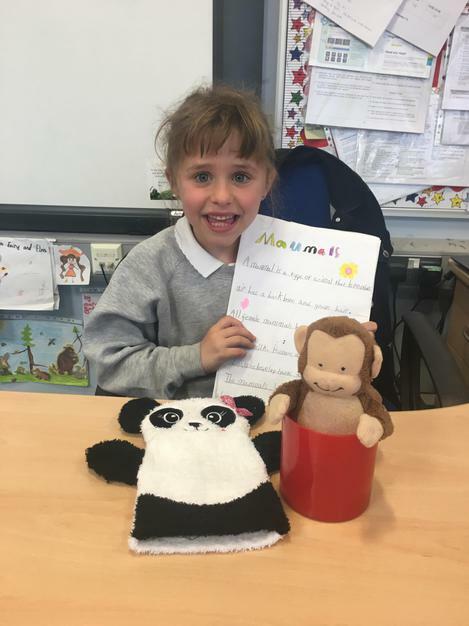 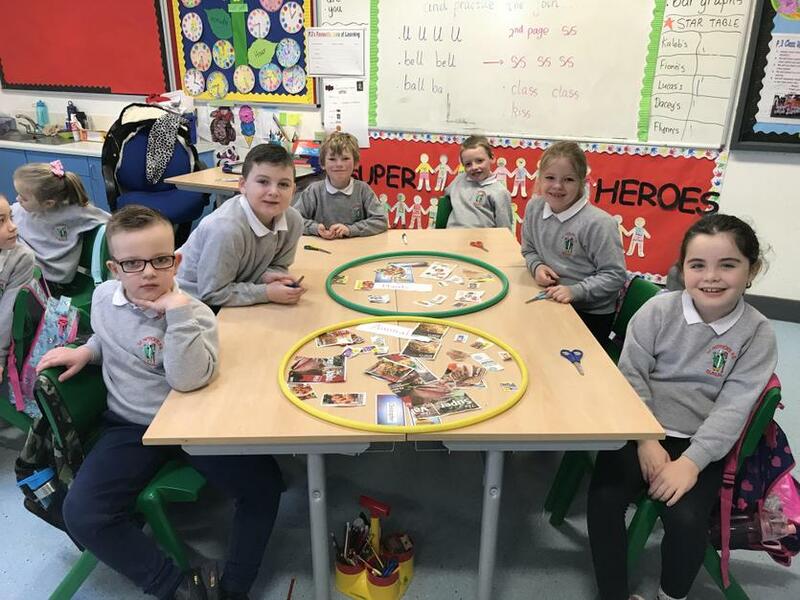 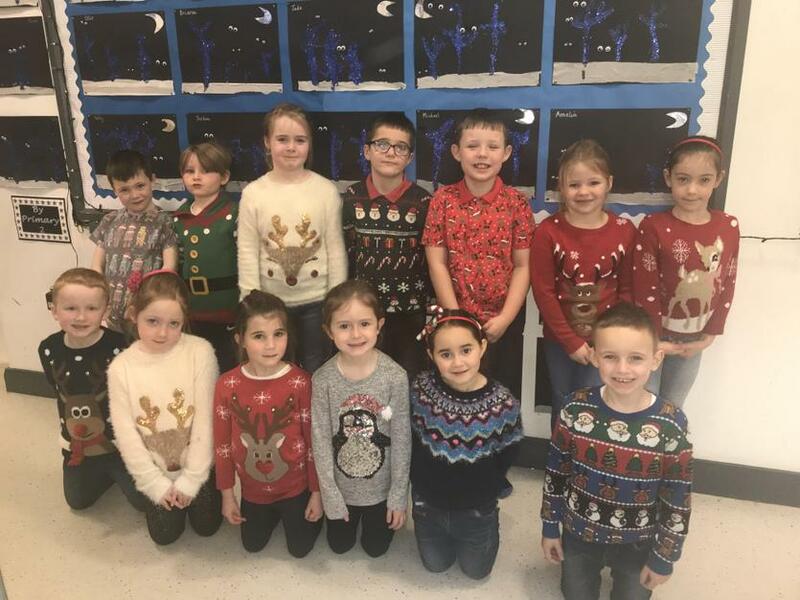 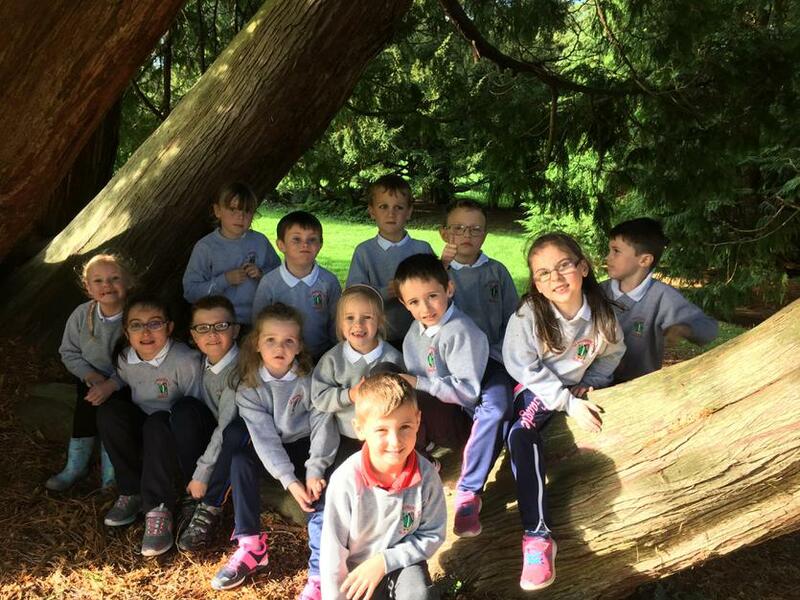 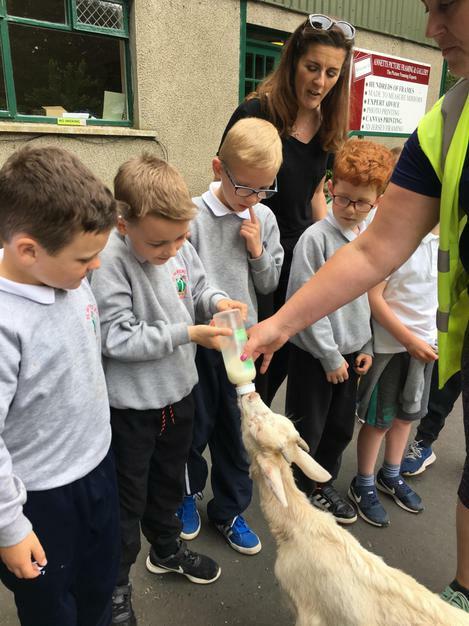 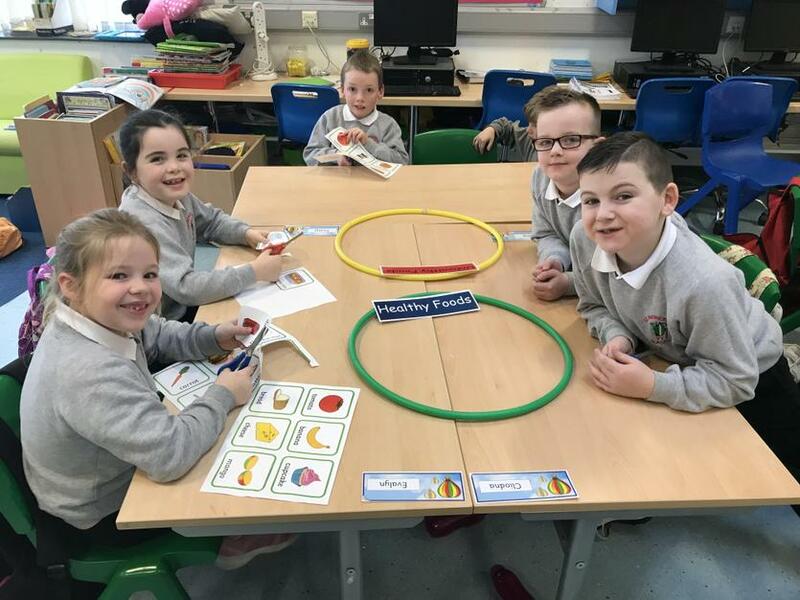 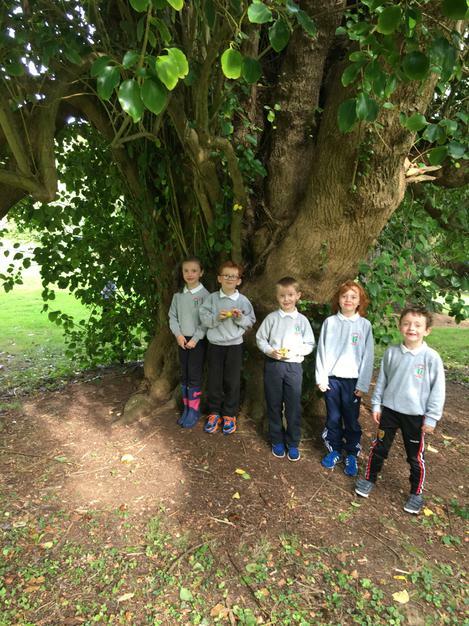 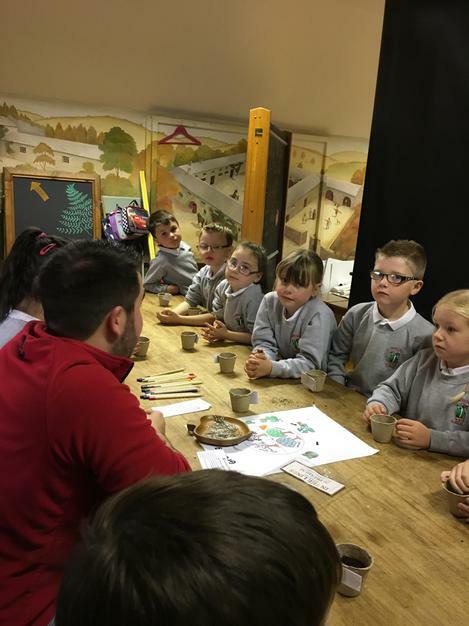 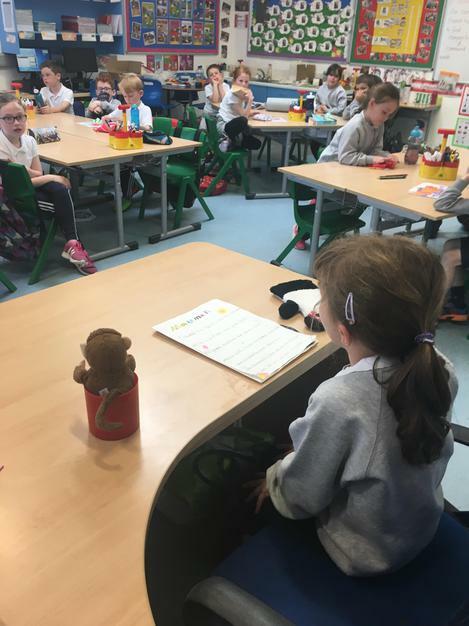 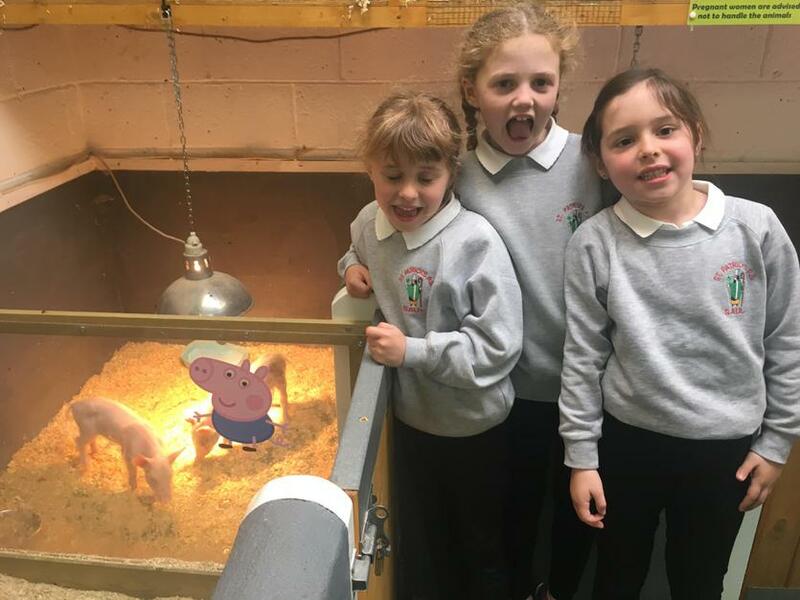 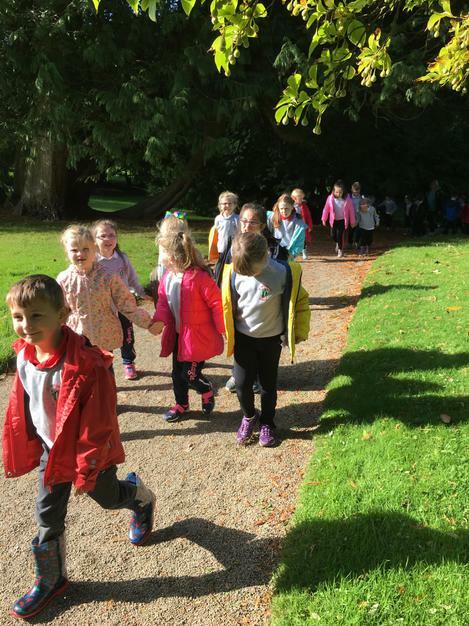 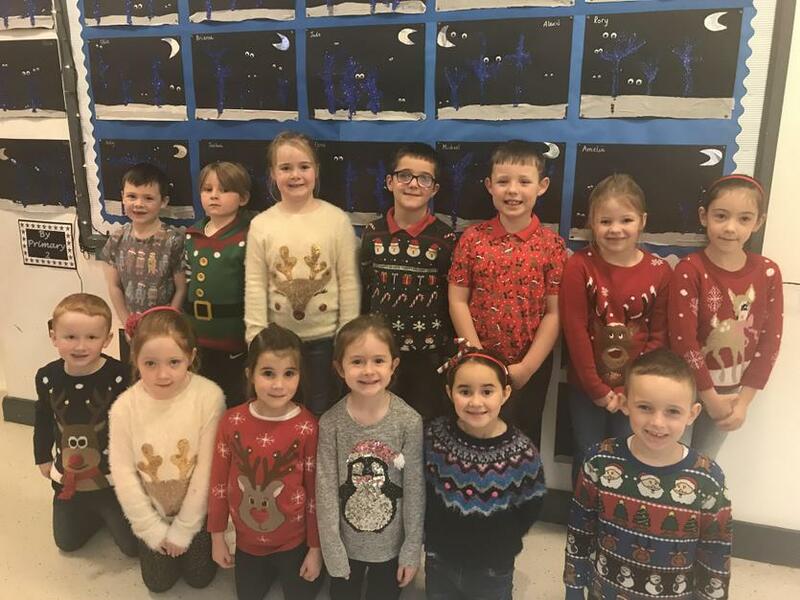 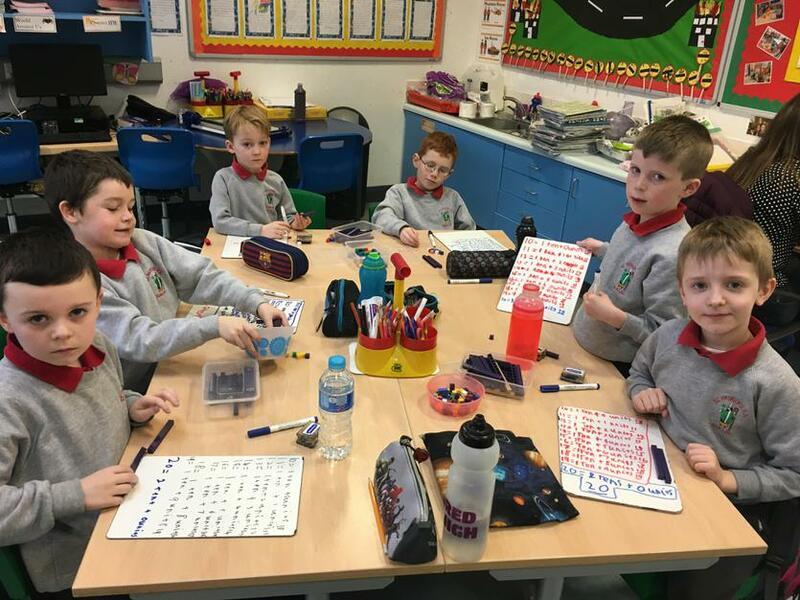 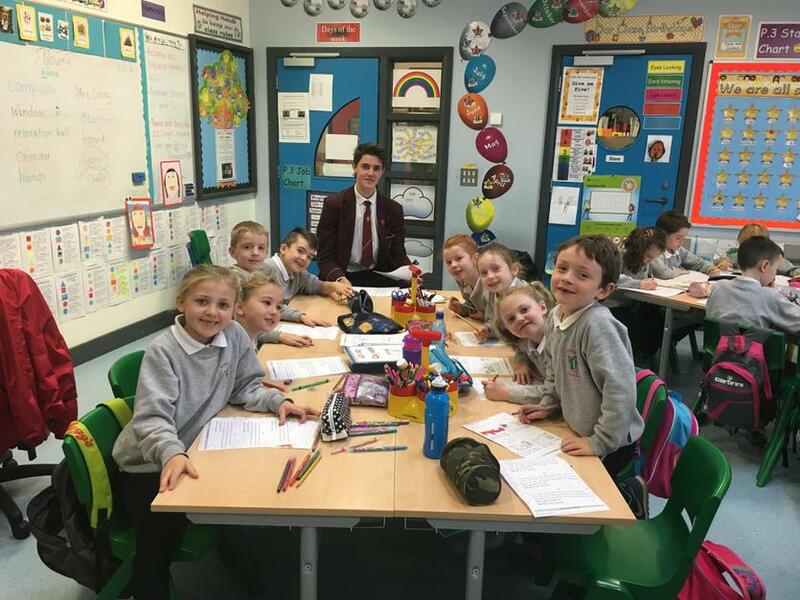 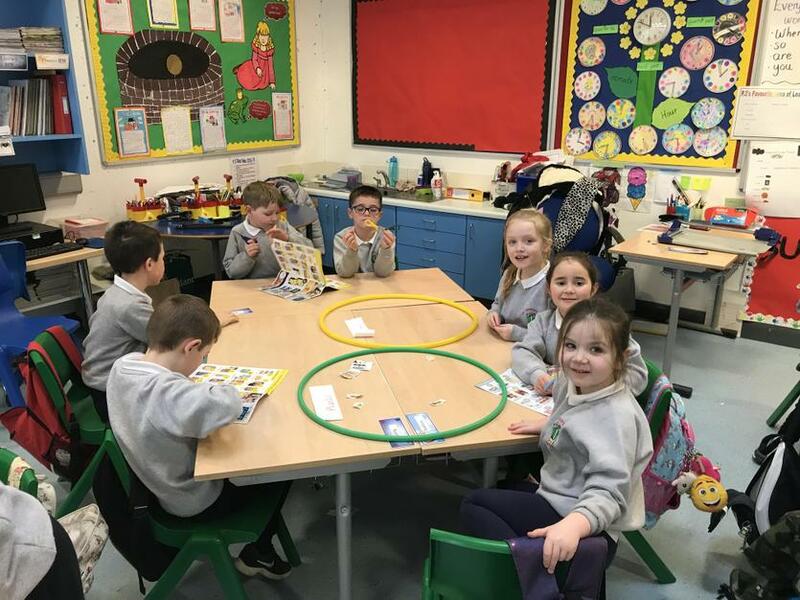 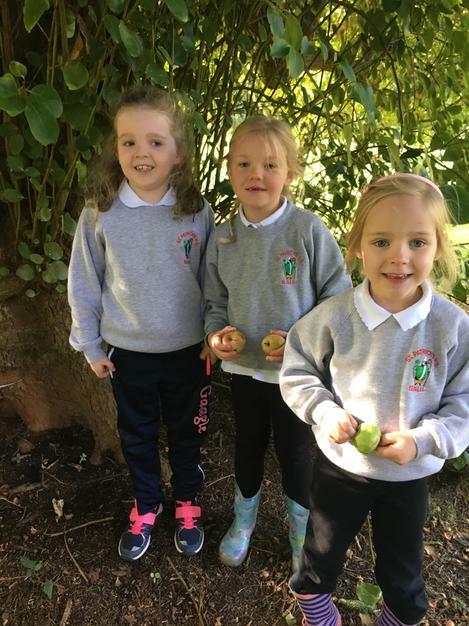 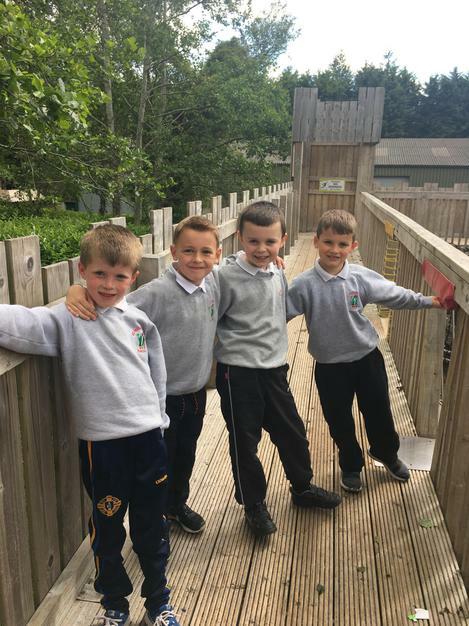 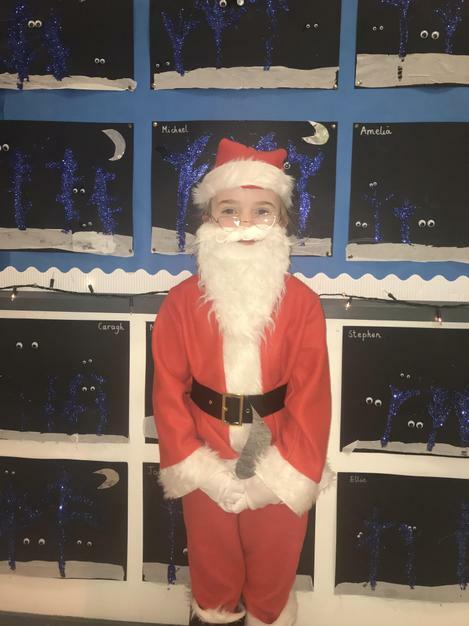 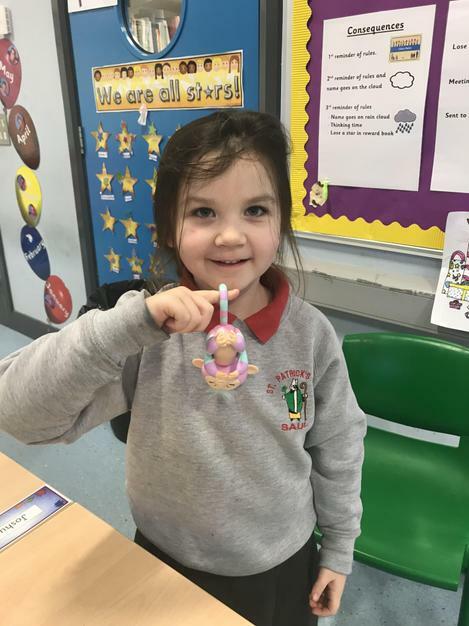 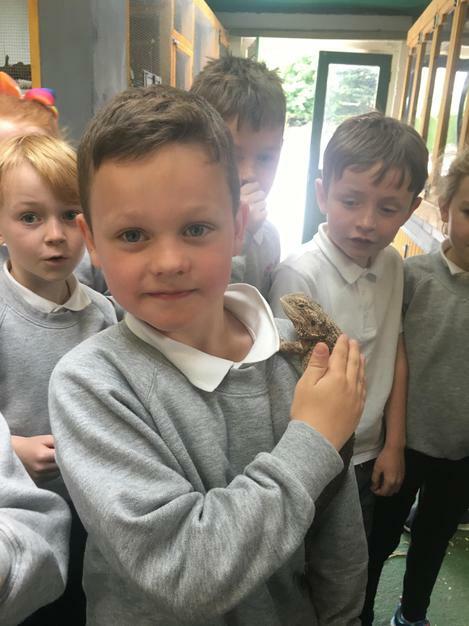 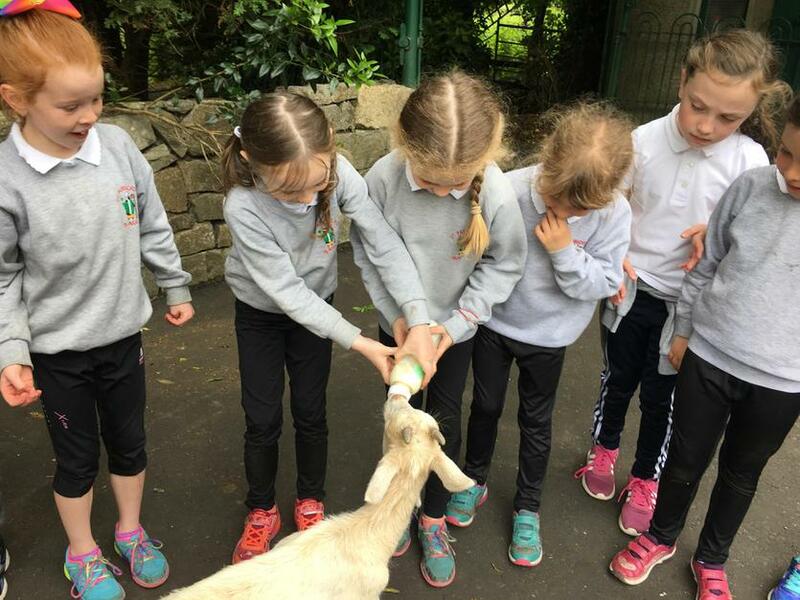 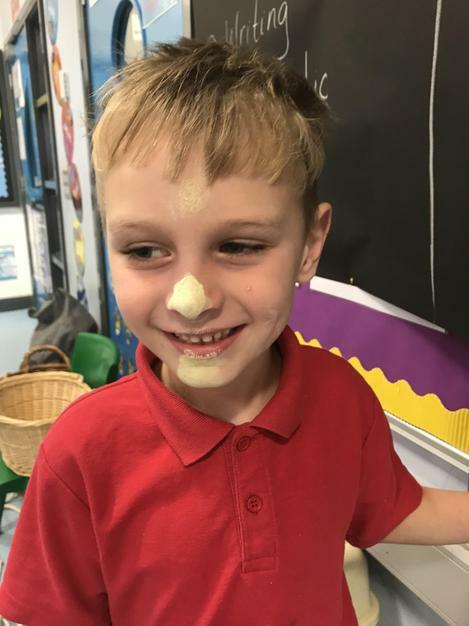 We hope they enjoyed their time in P.3- we certainly enjoyed having them. 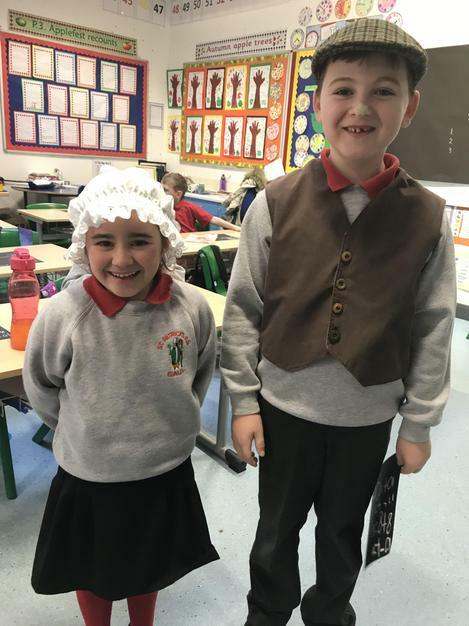 A step back in time! 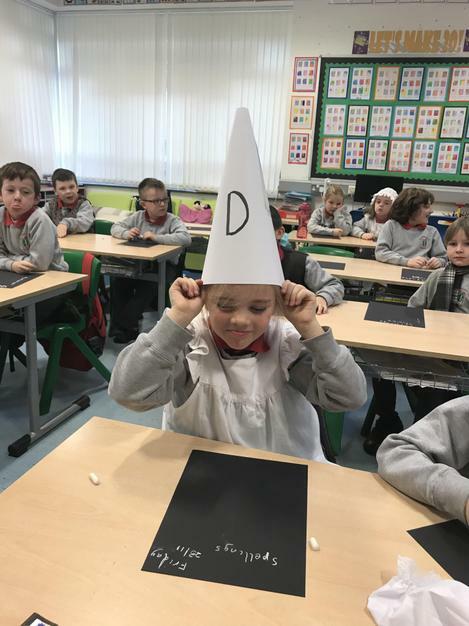 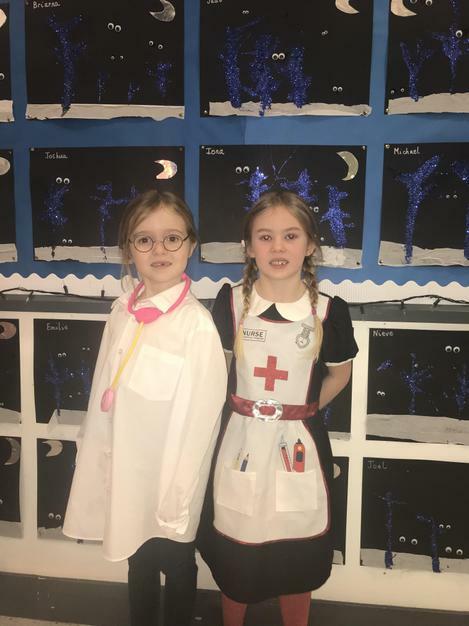 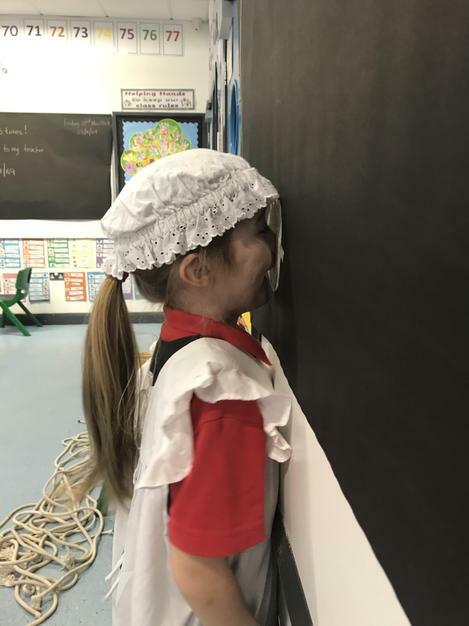 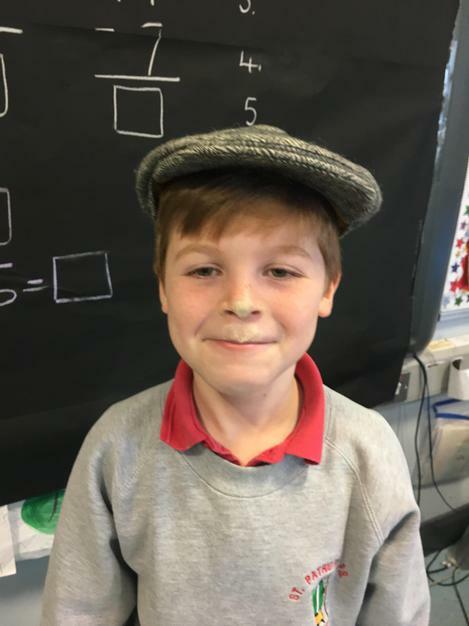 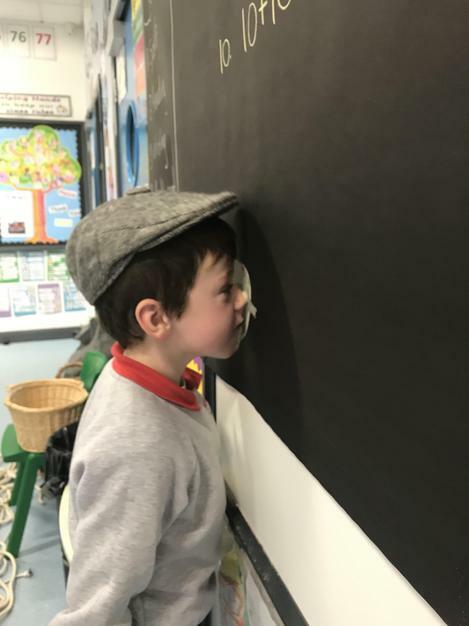 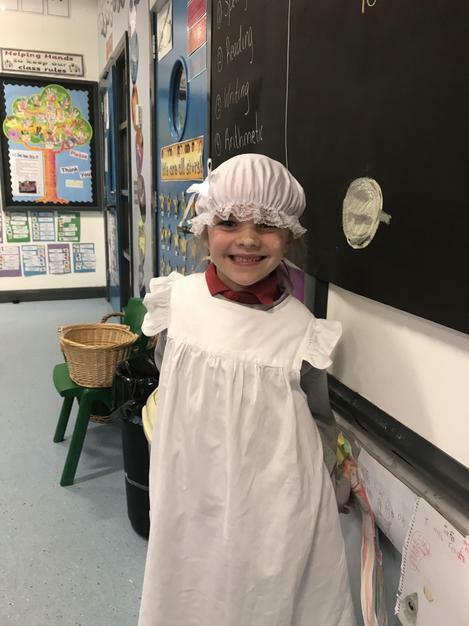 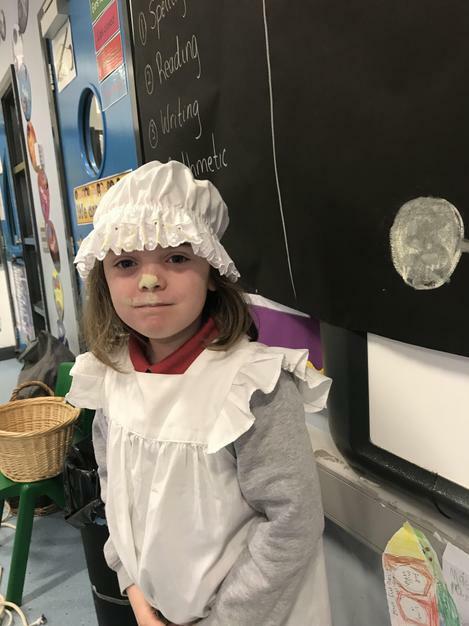 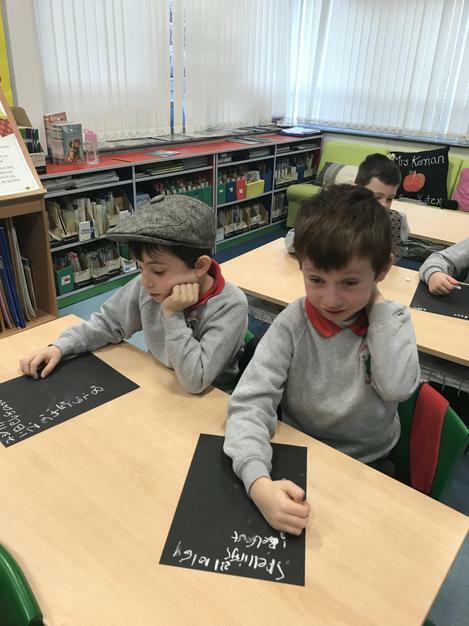 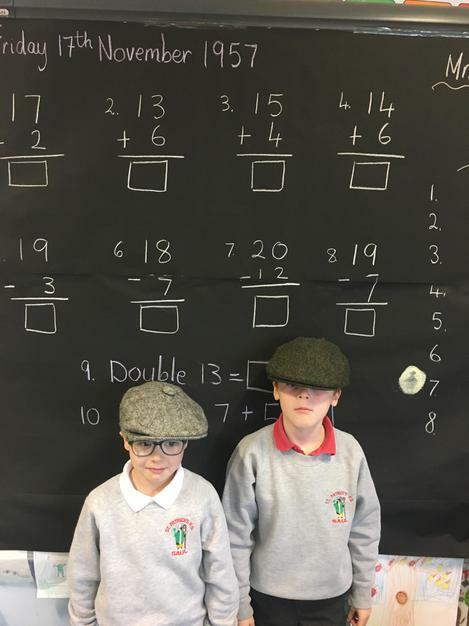 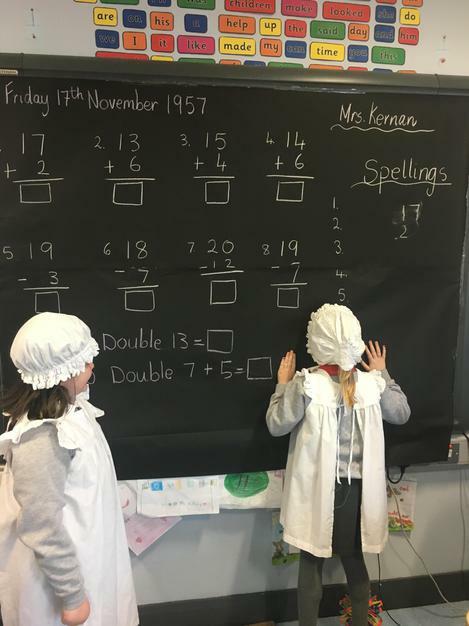 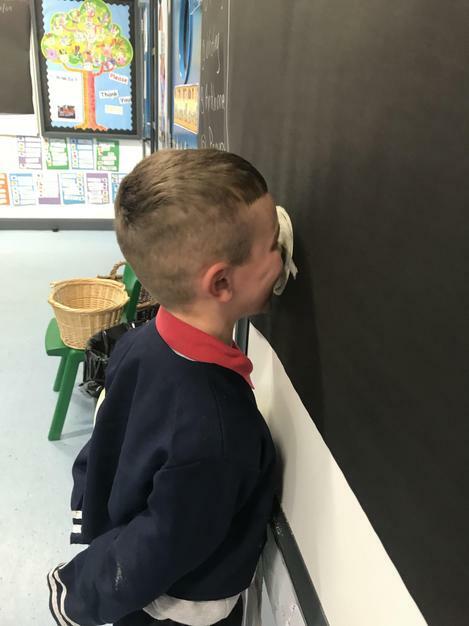 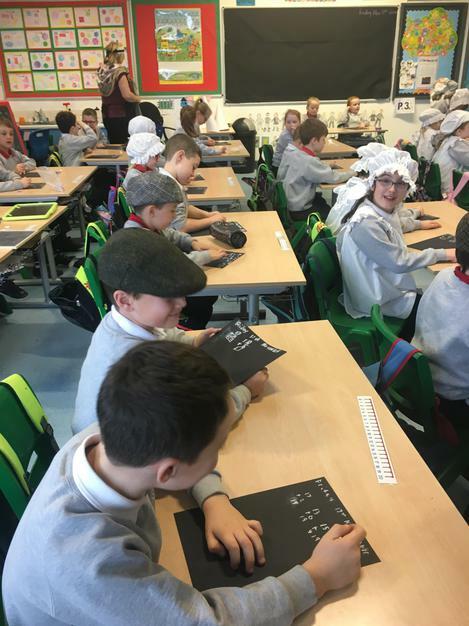 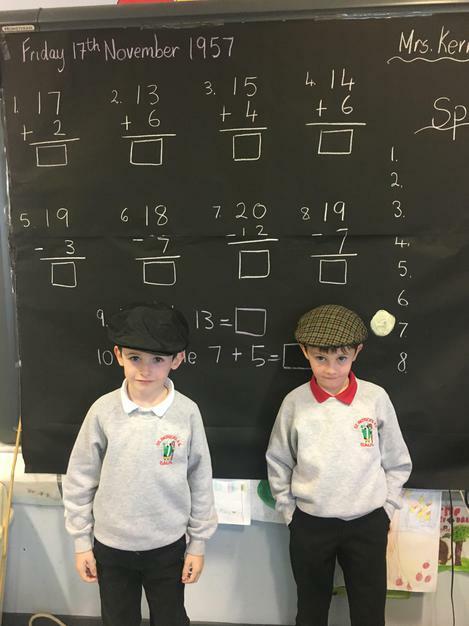 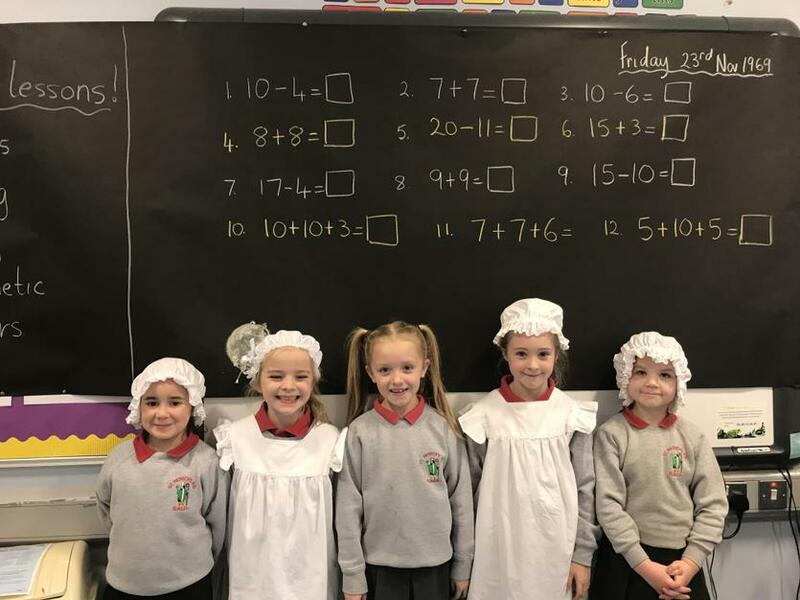 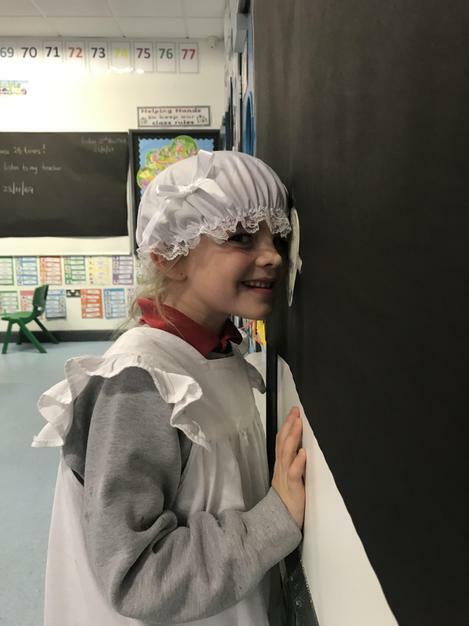 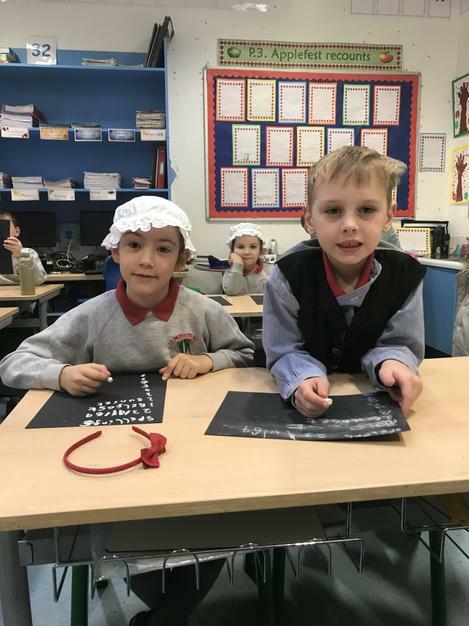 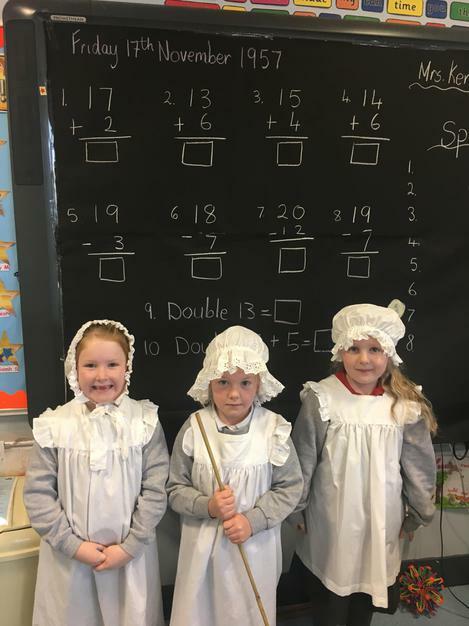 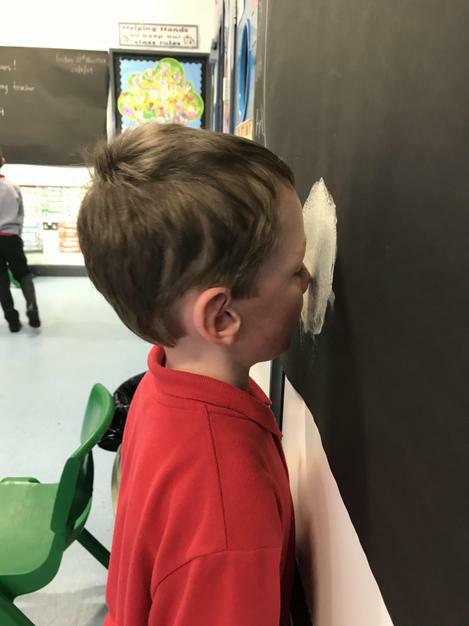 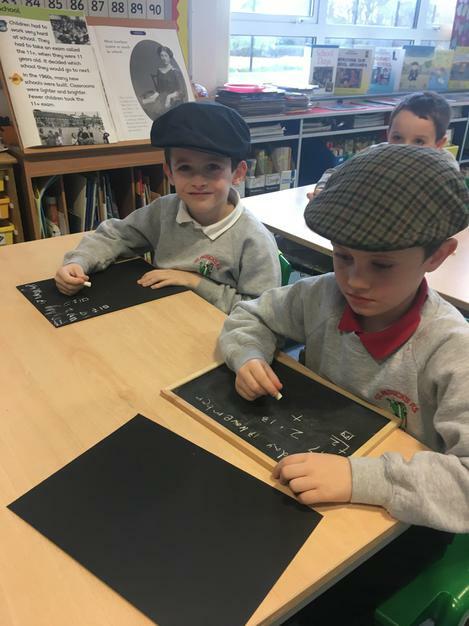 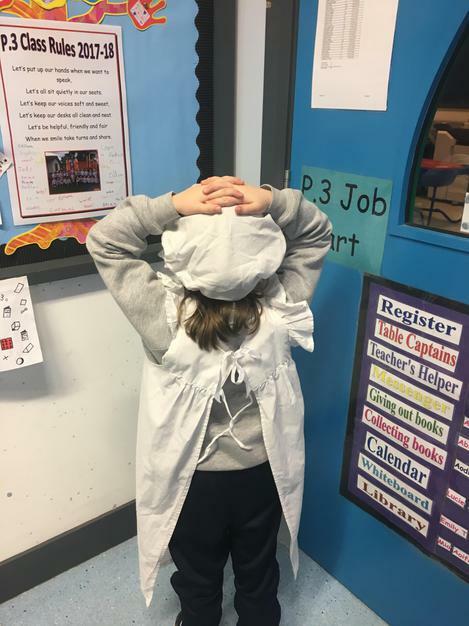 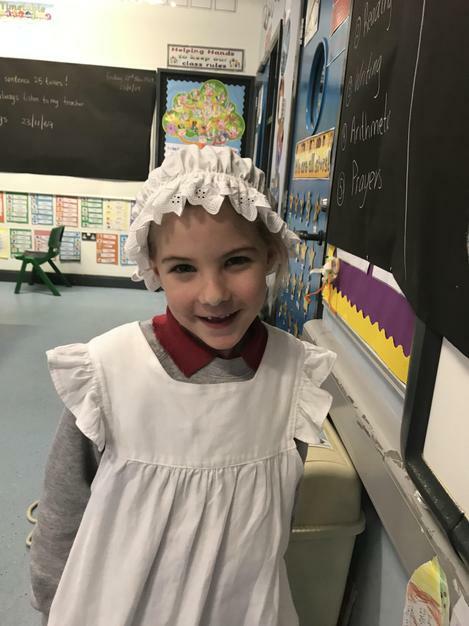 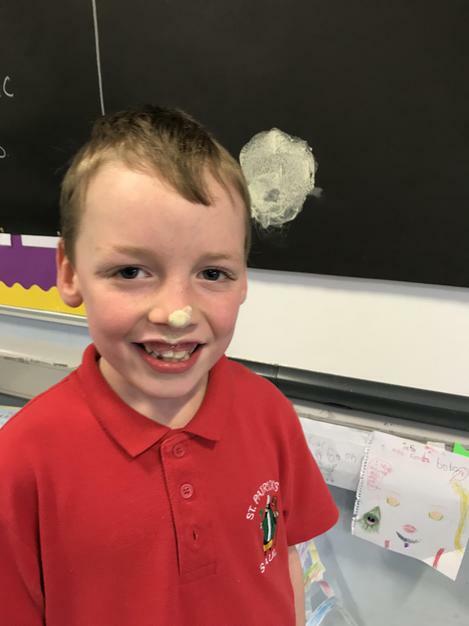 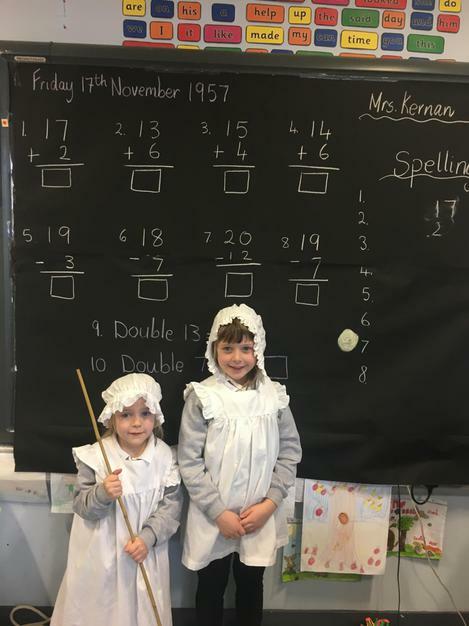 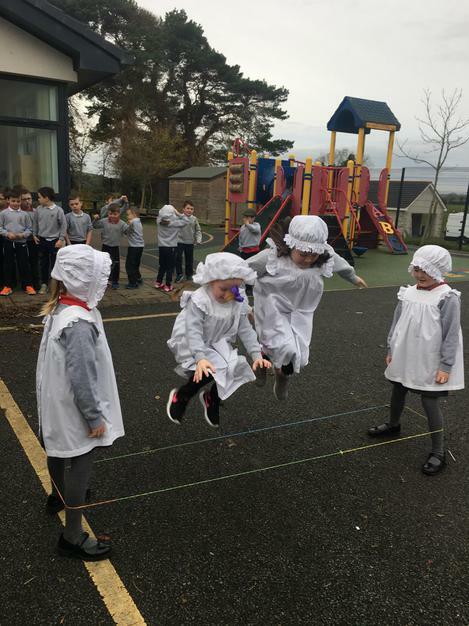 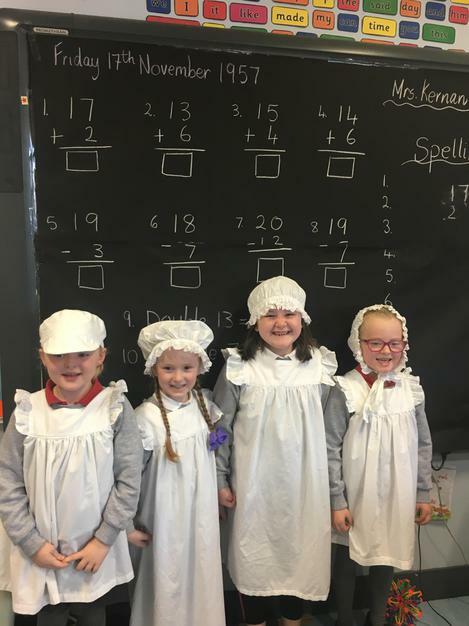 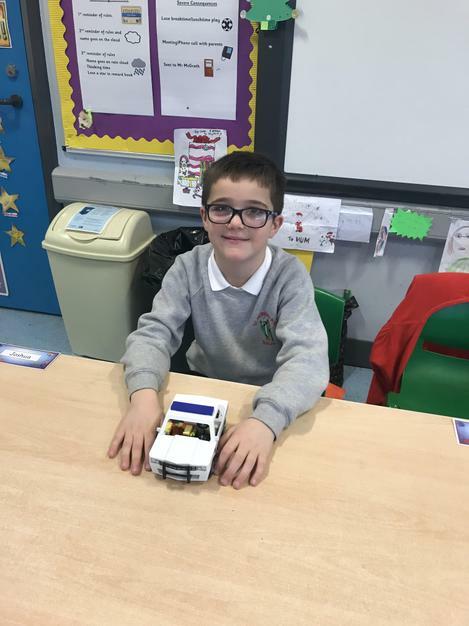 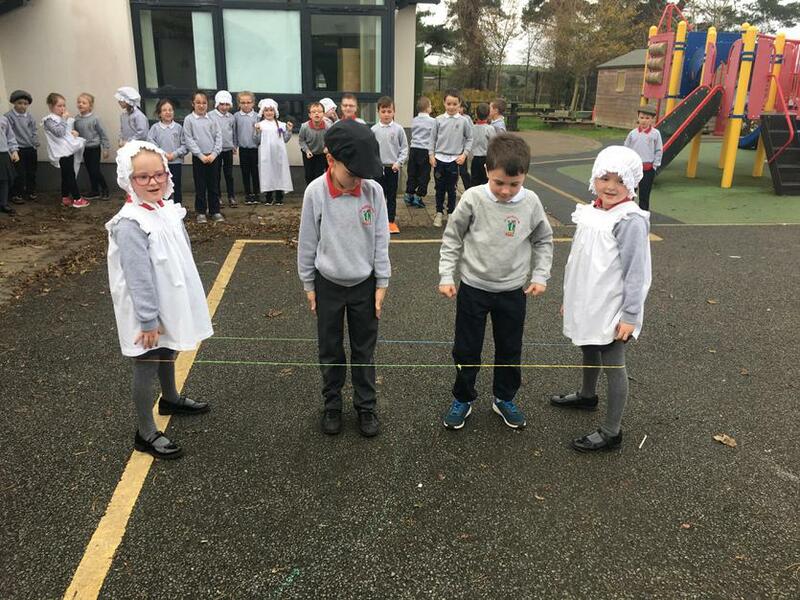 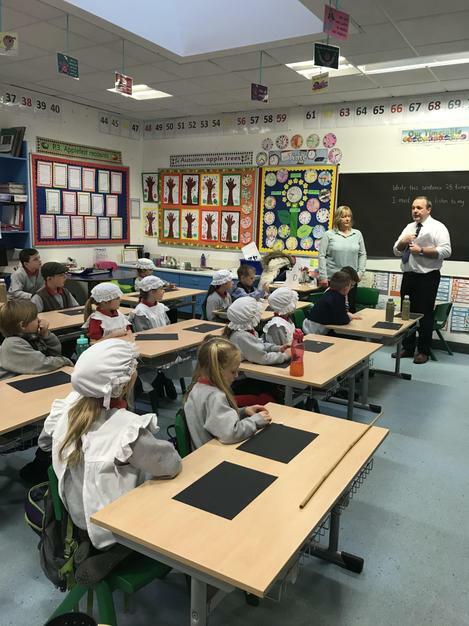 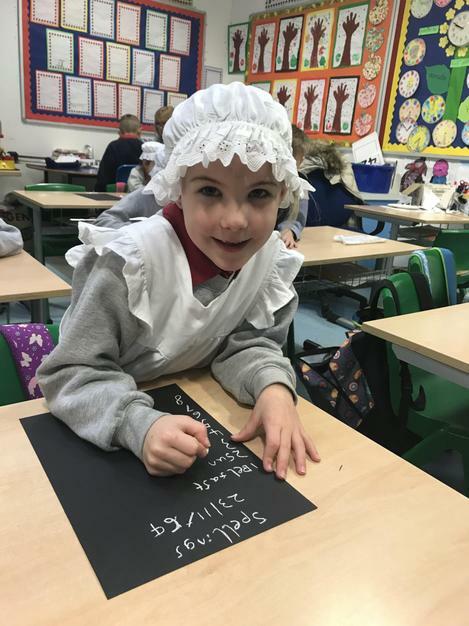 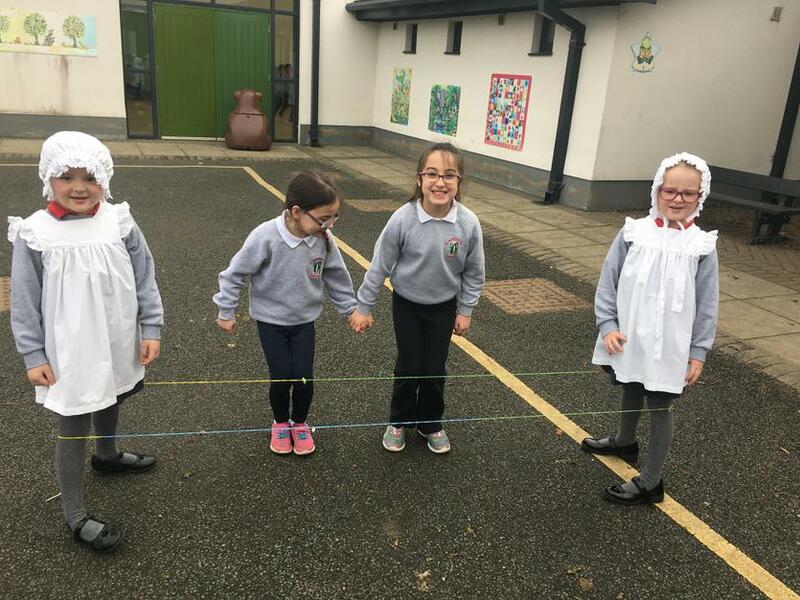 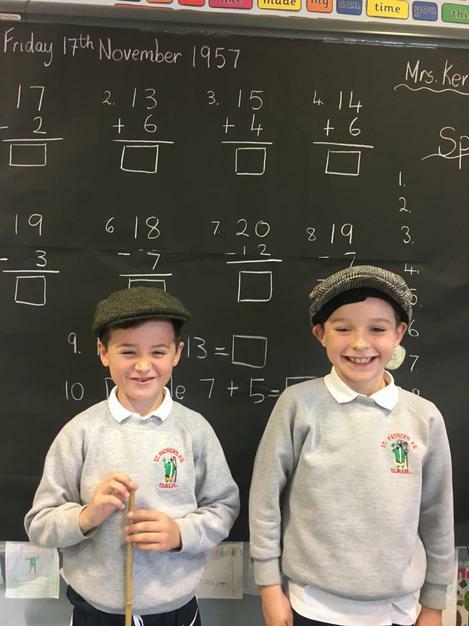 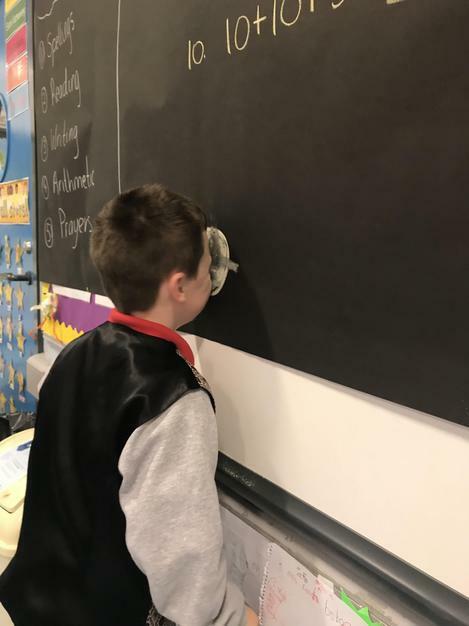 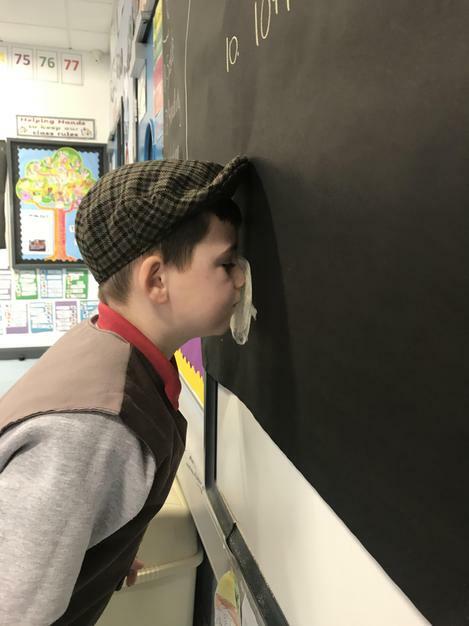 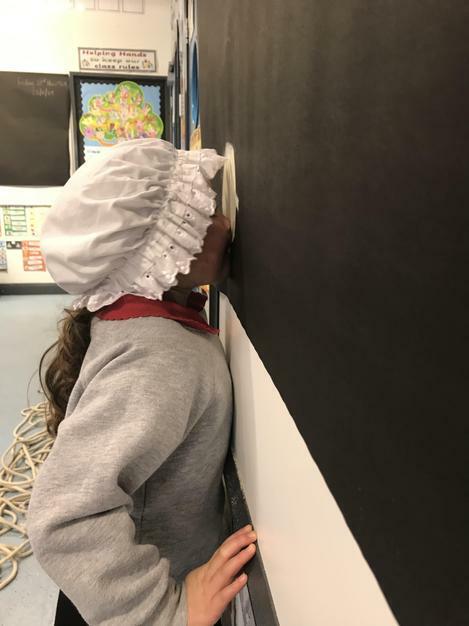 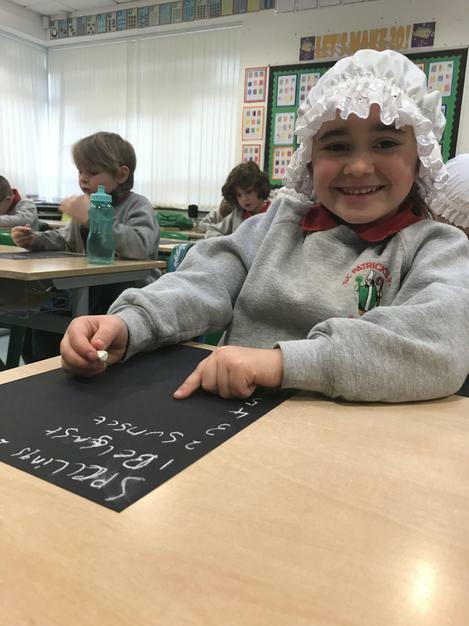 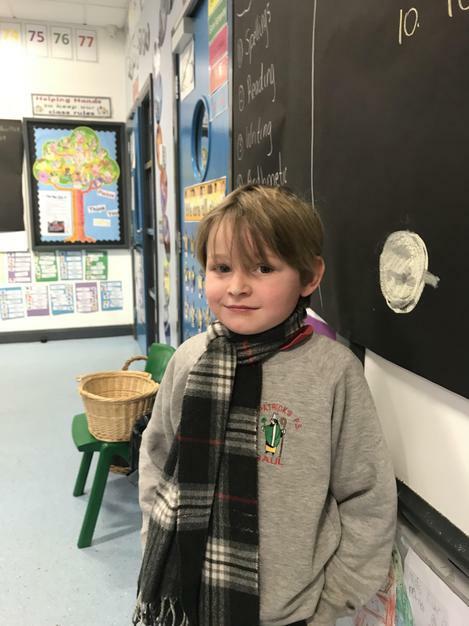 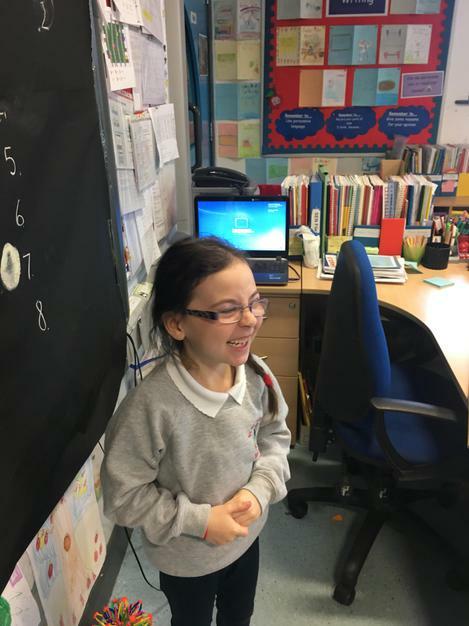 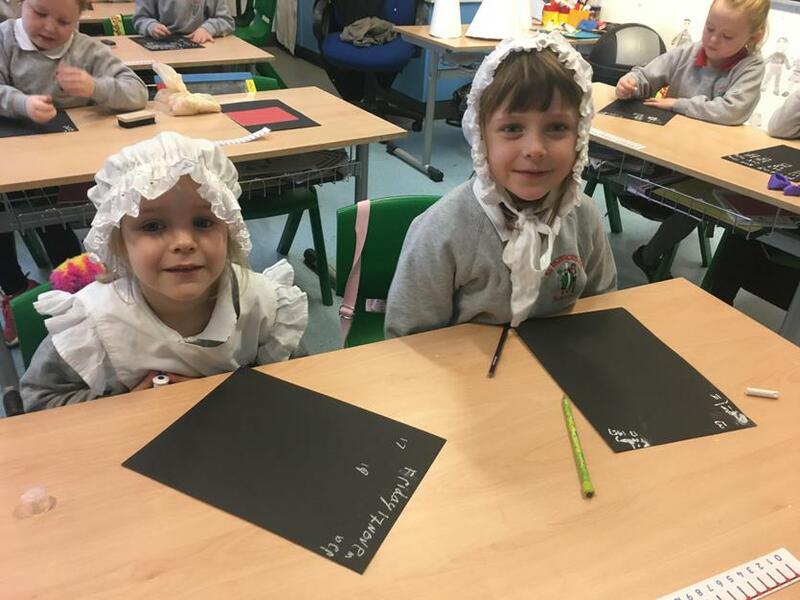 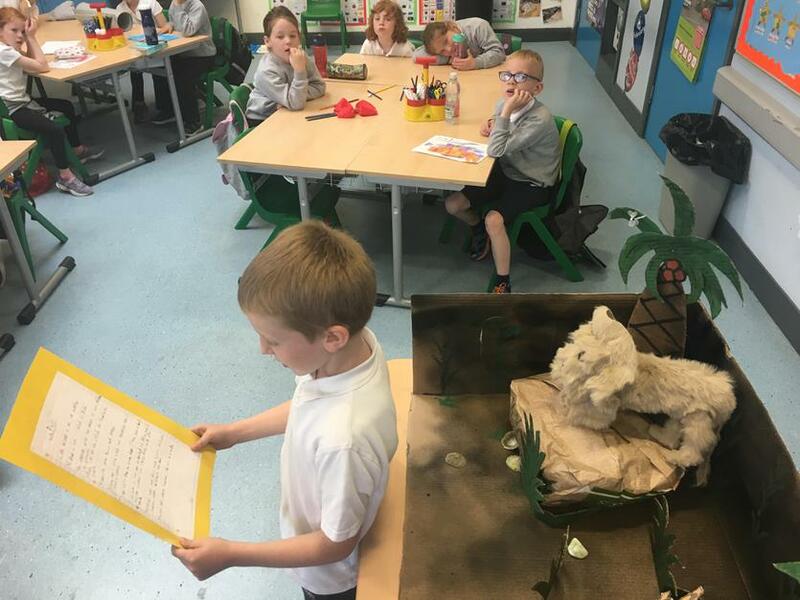 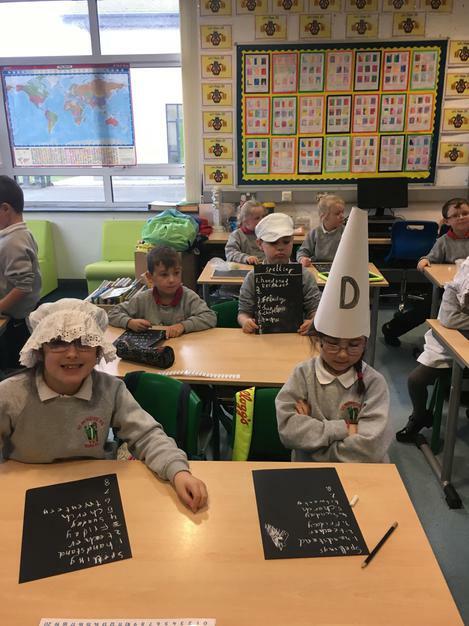 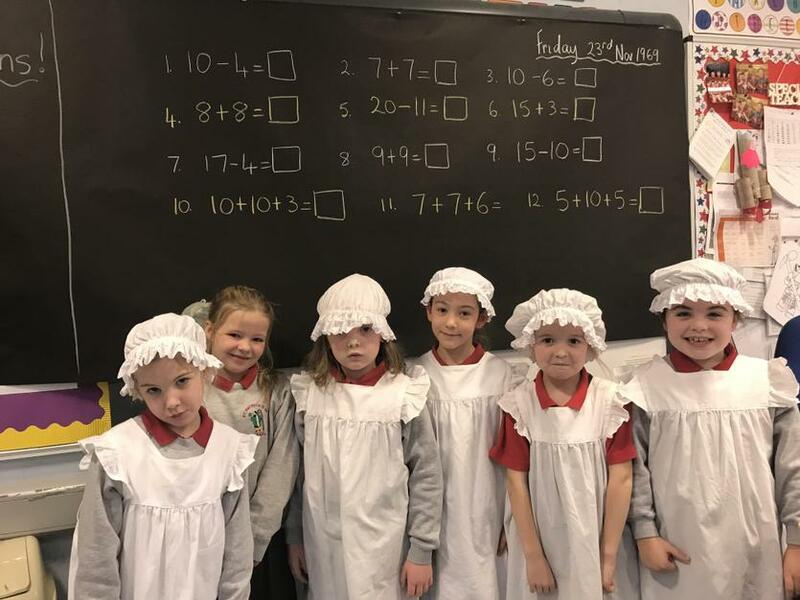 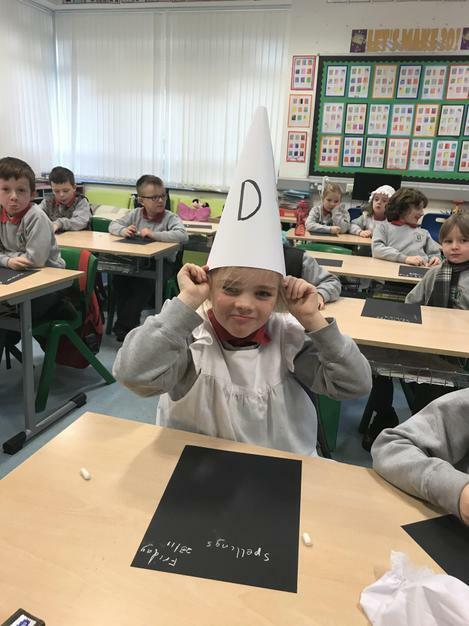 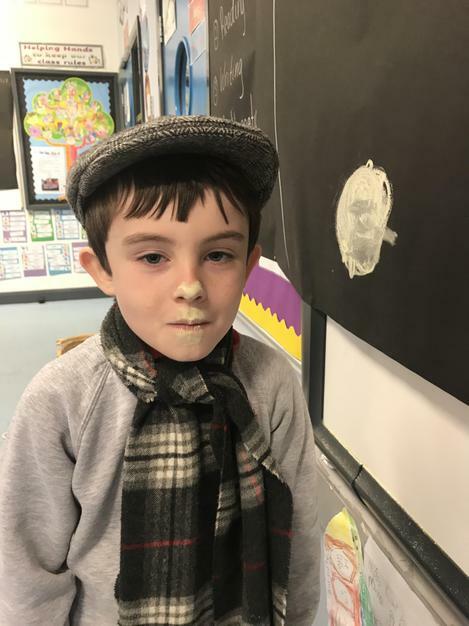 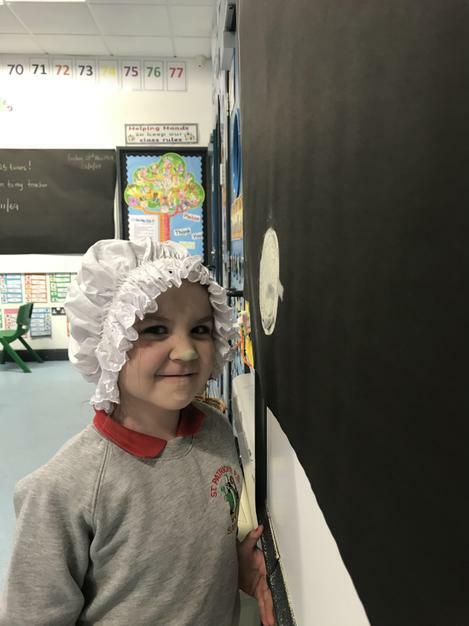 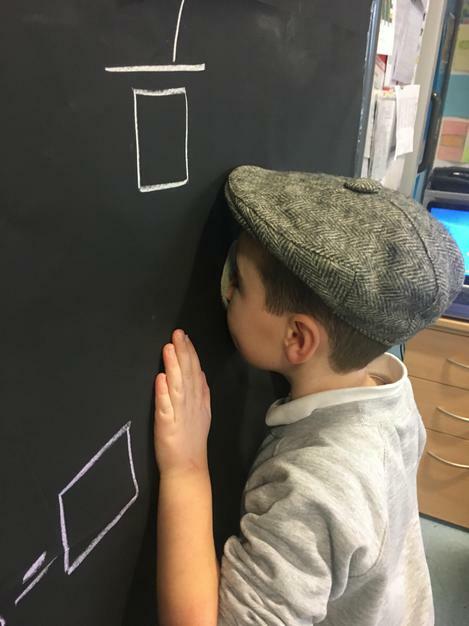 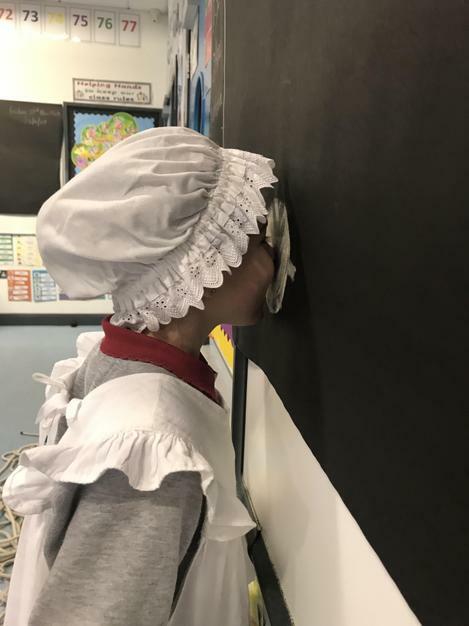 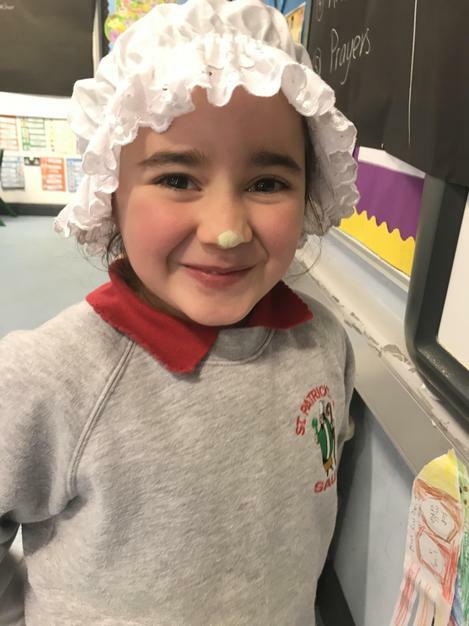 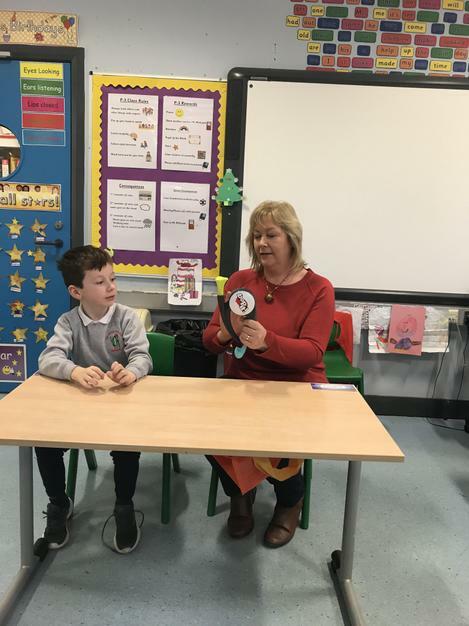 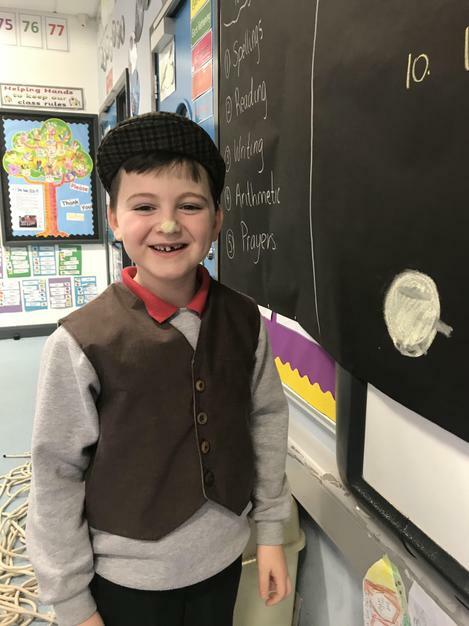 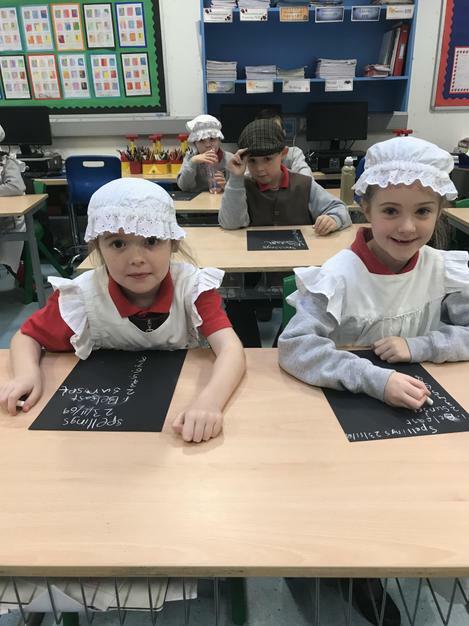 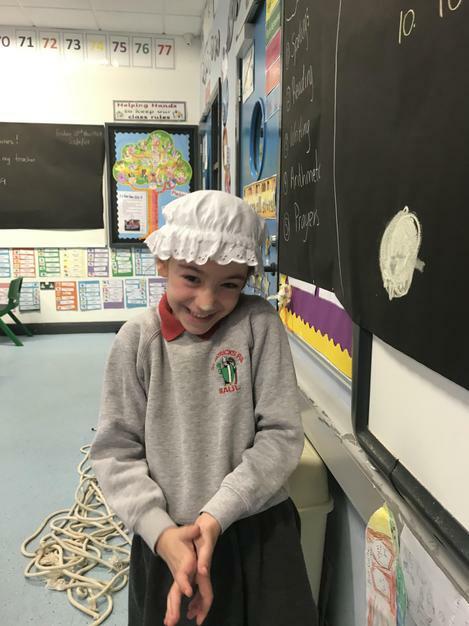 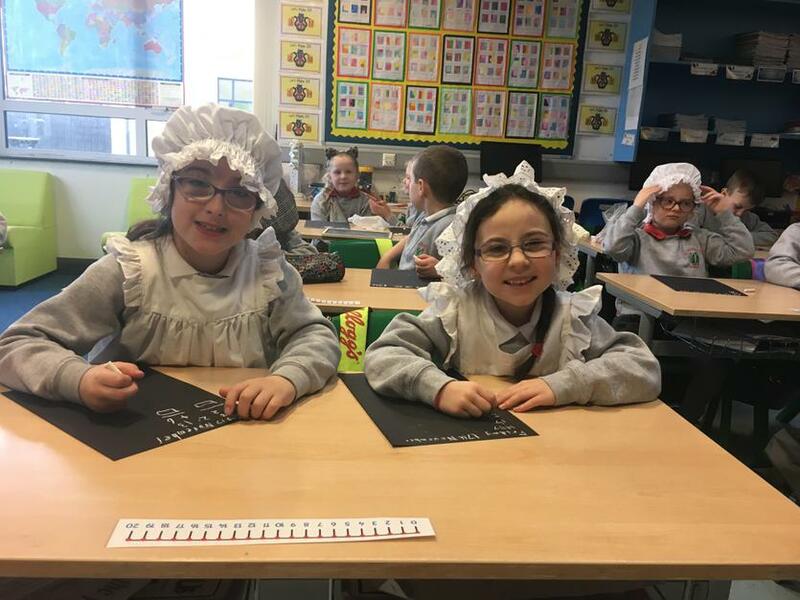 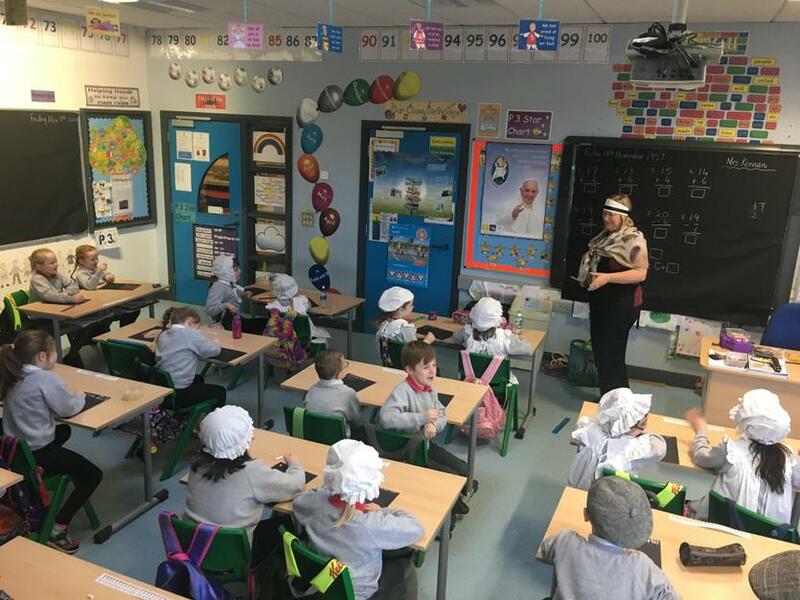 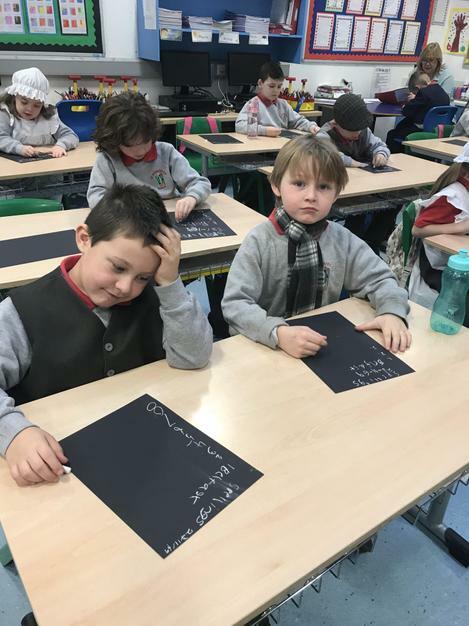 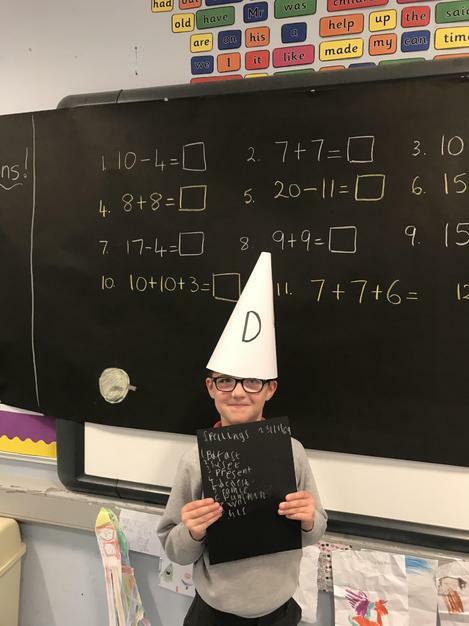 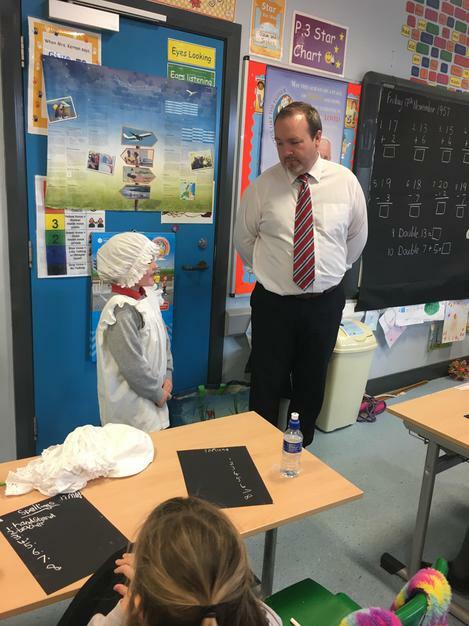 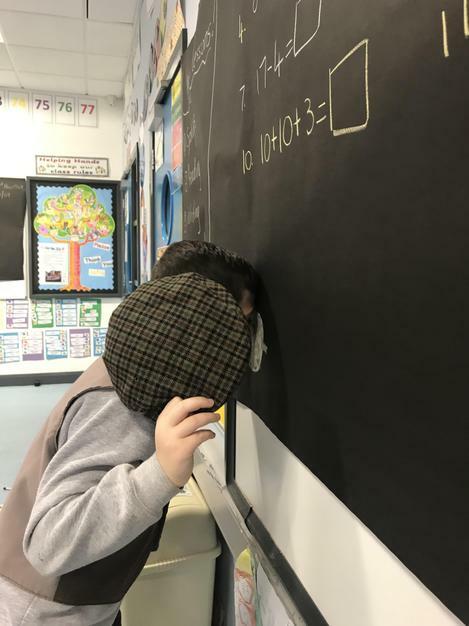 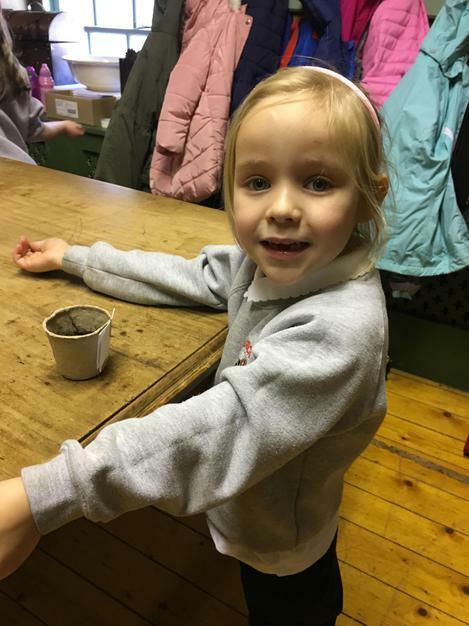 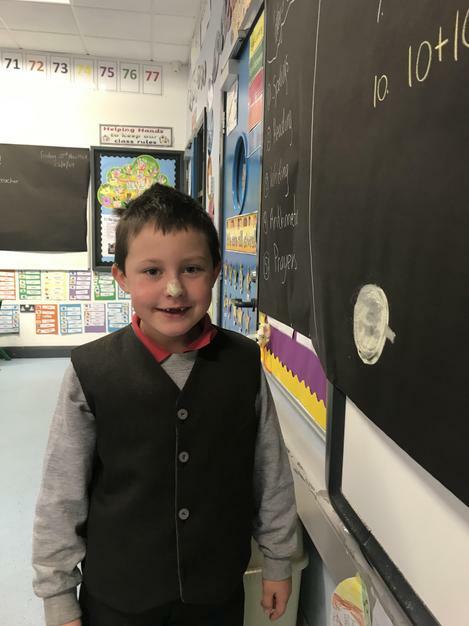 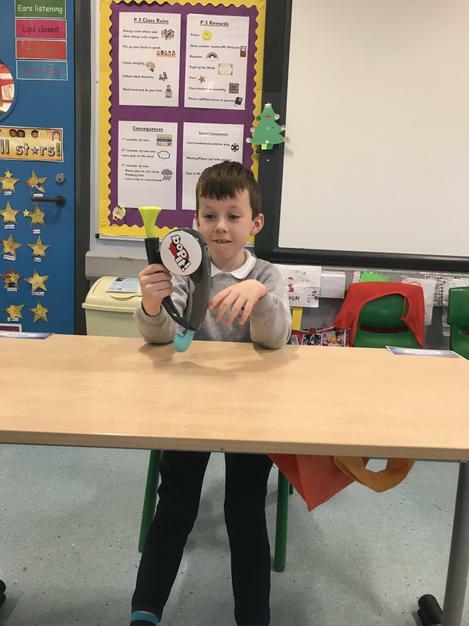 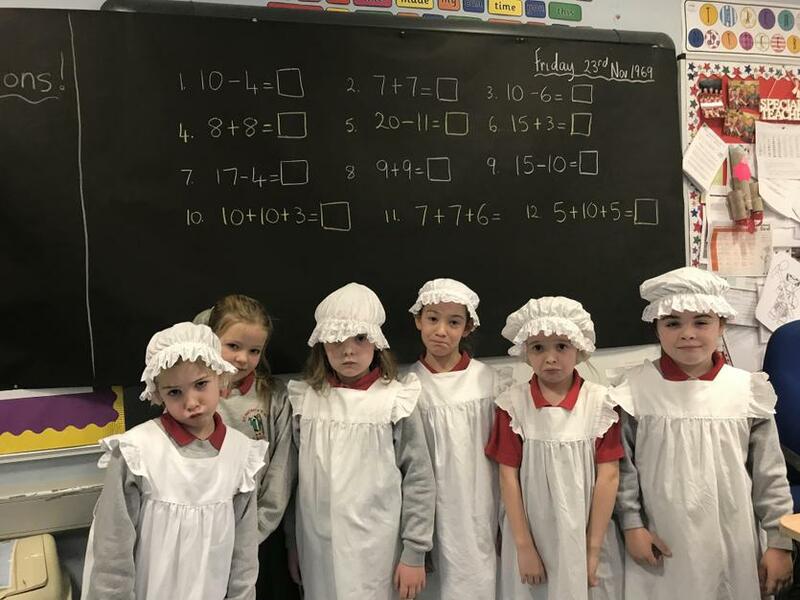 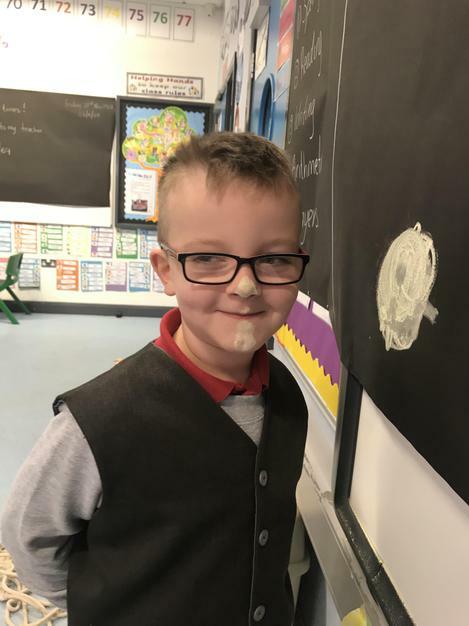 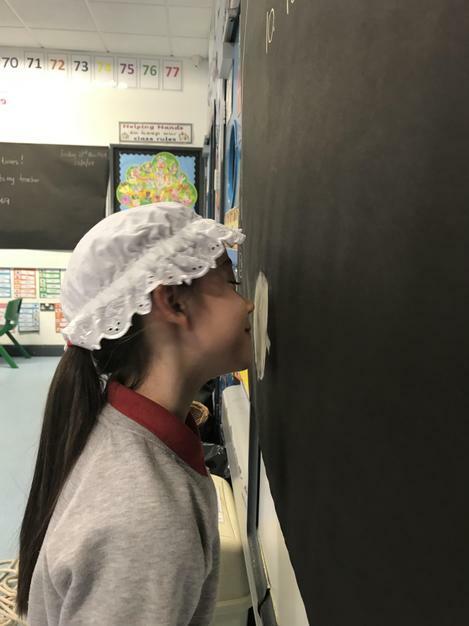 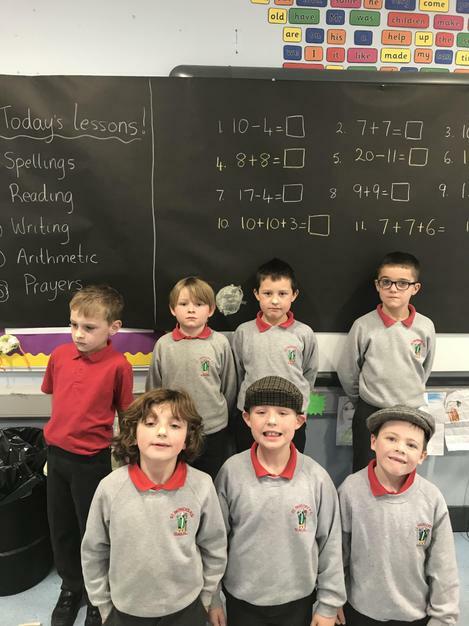 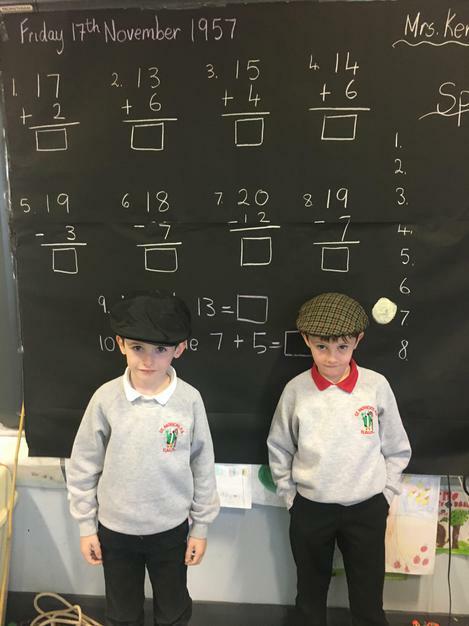 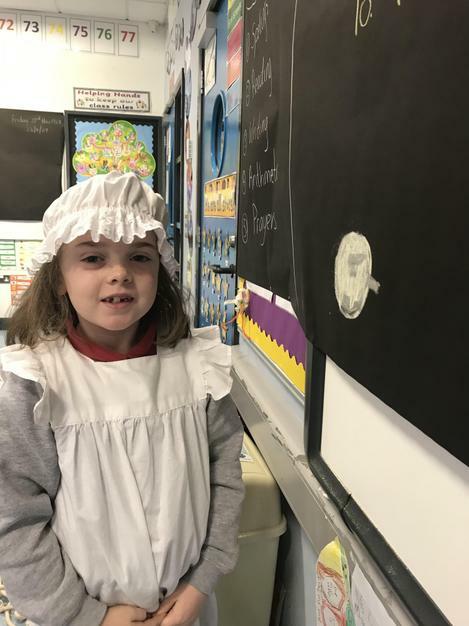 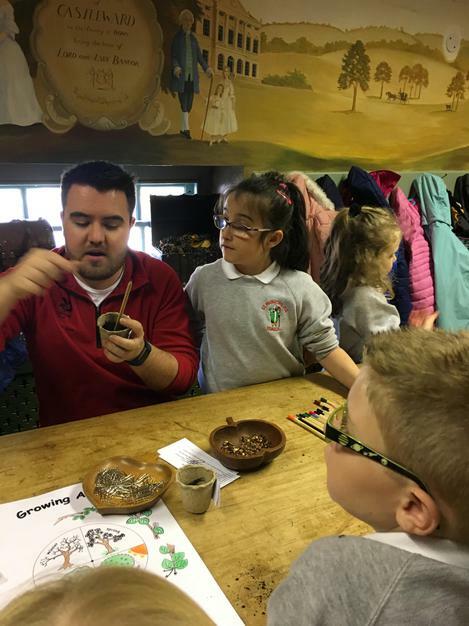 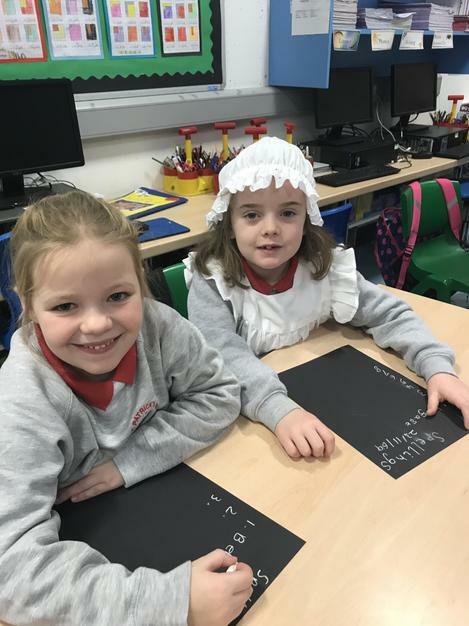 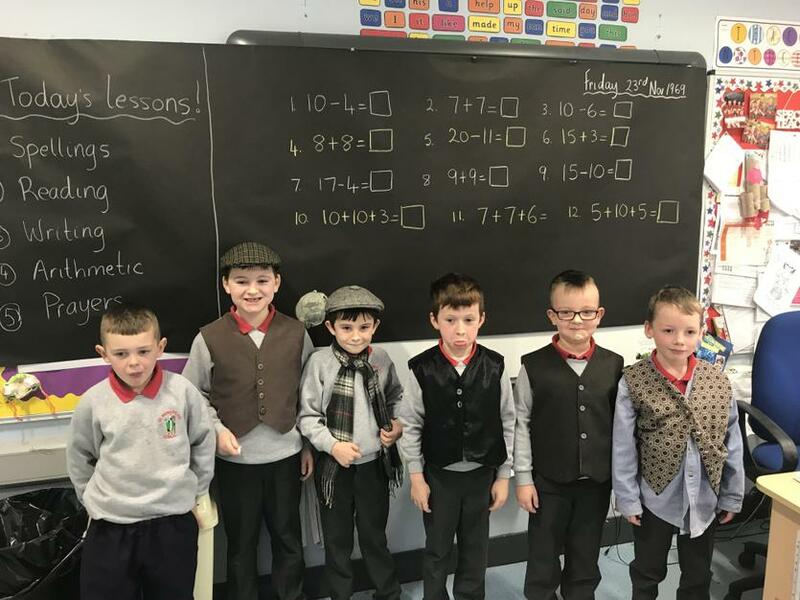 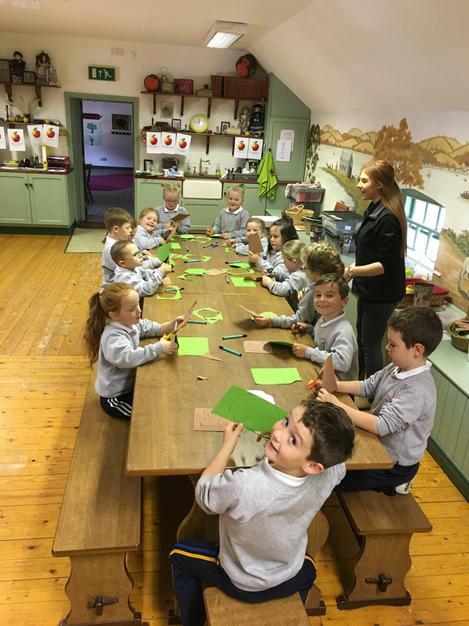 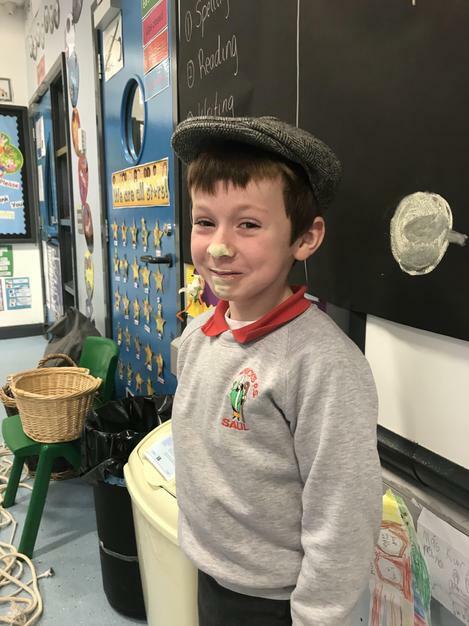 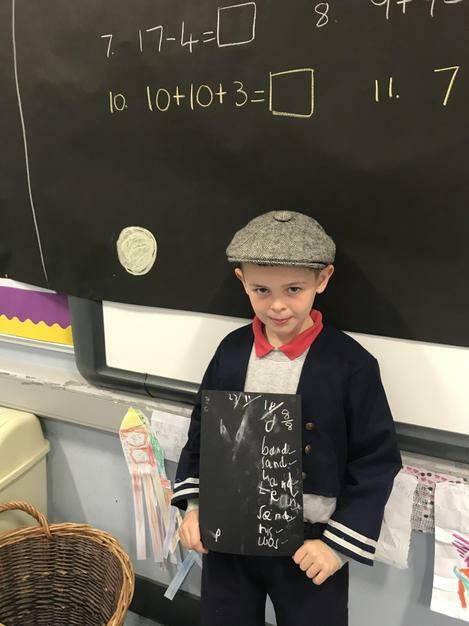 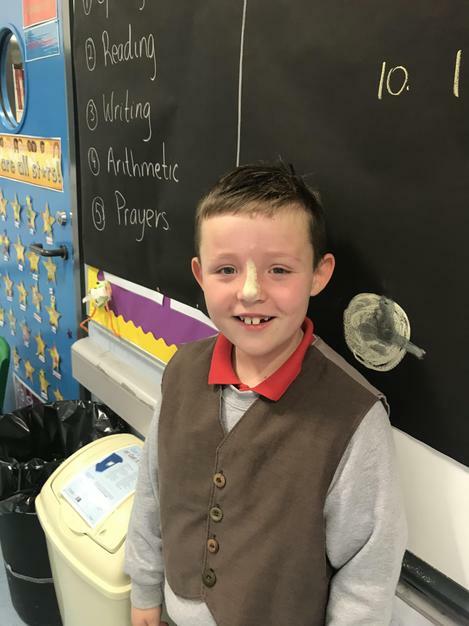 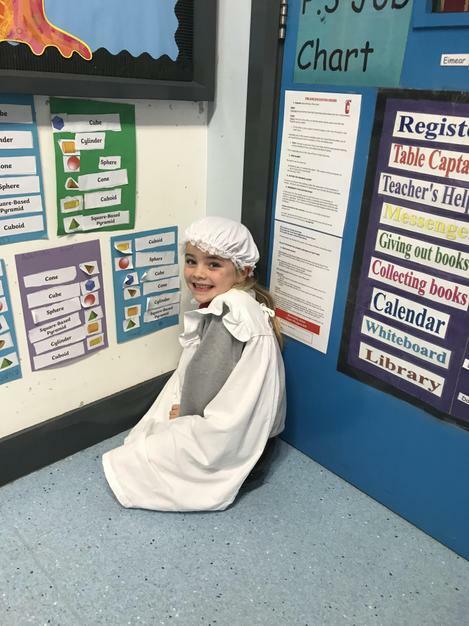 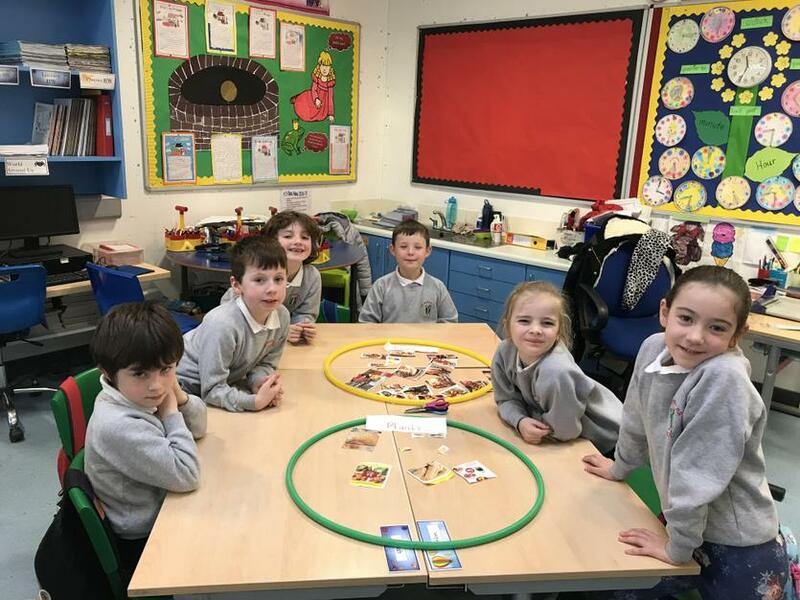 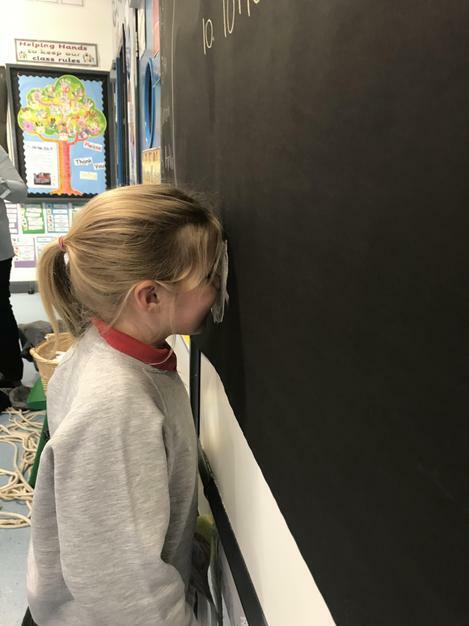 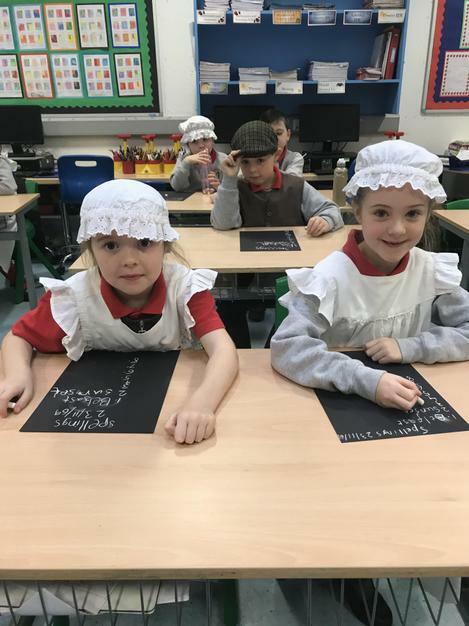 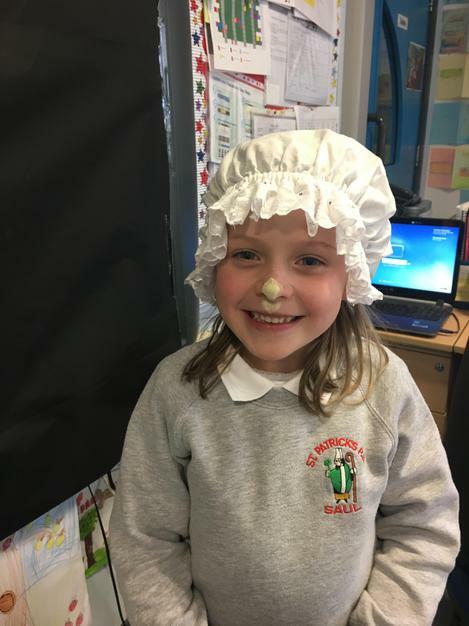 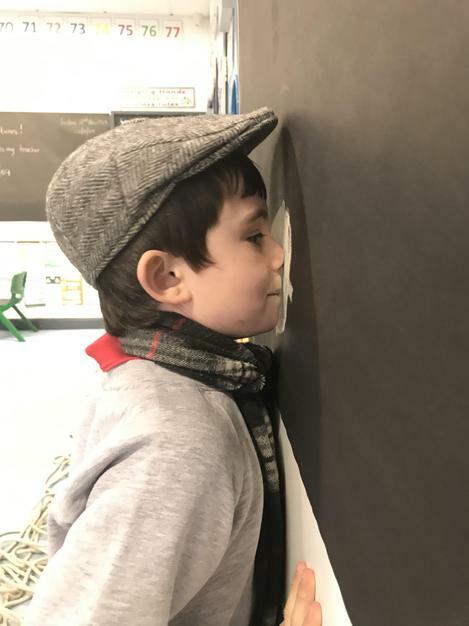 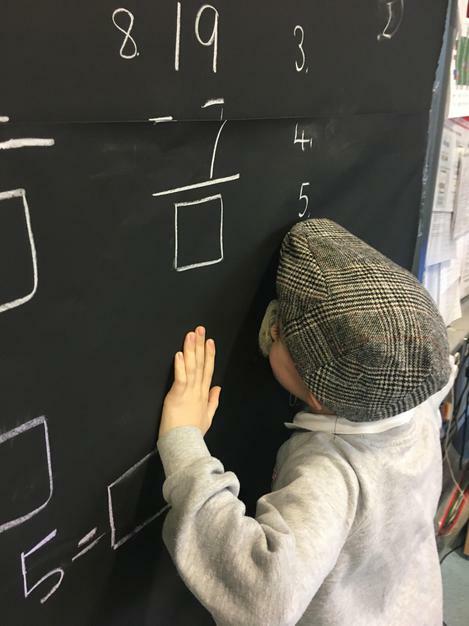 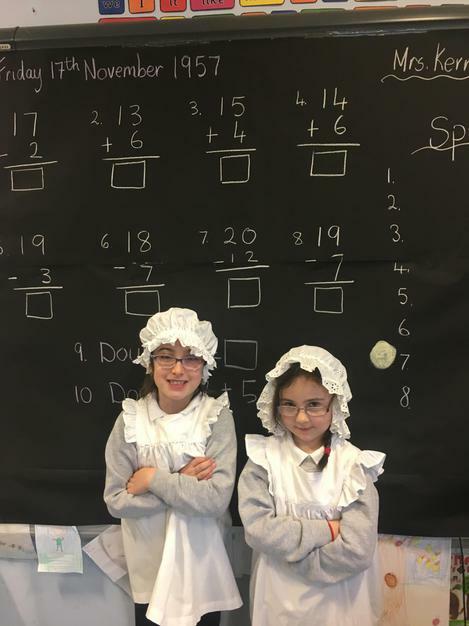 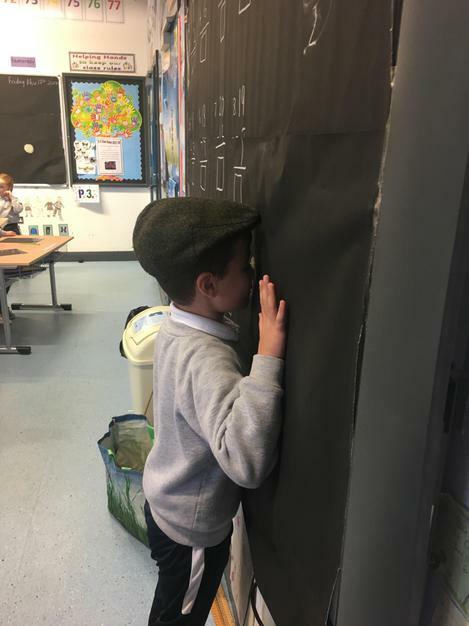 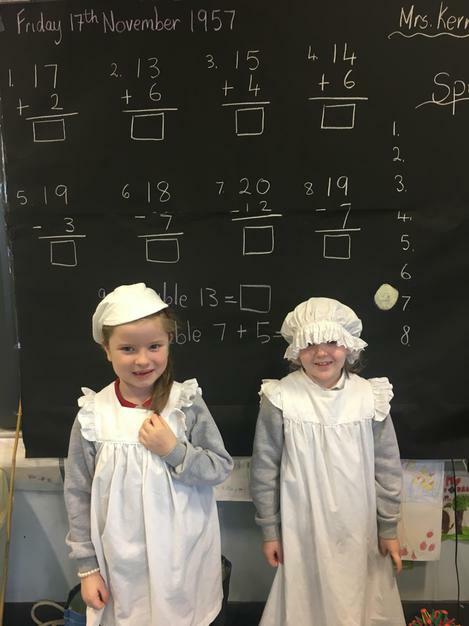 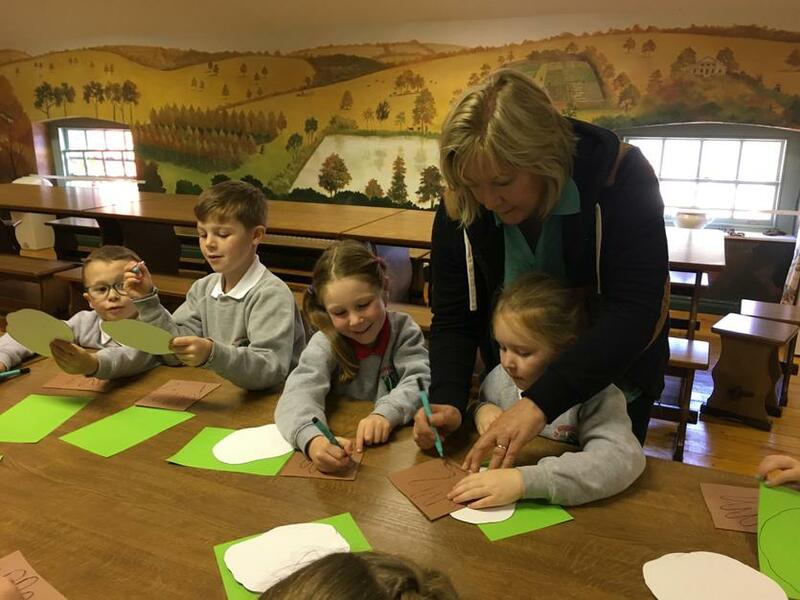 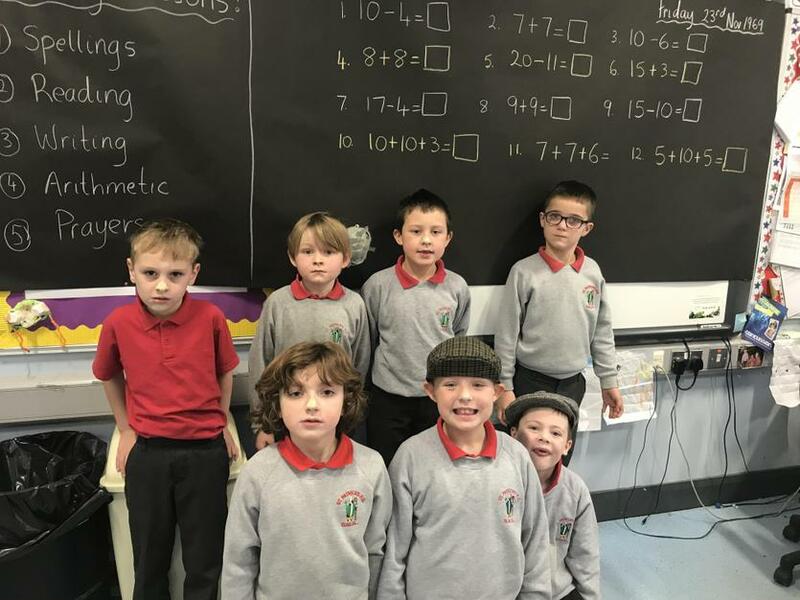 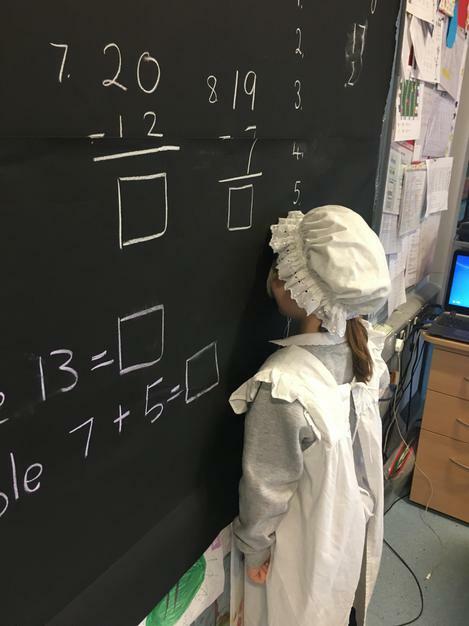 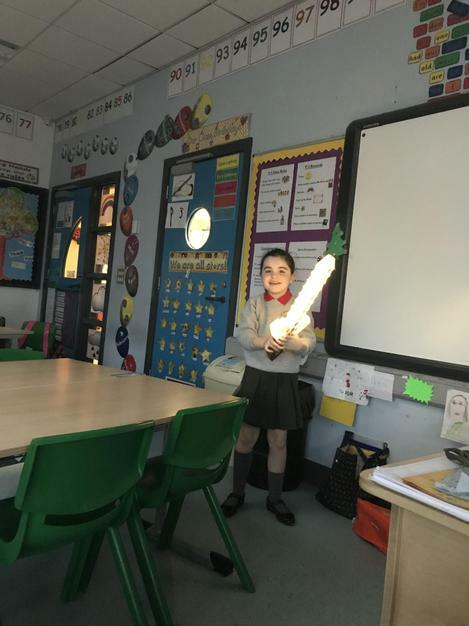 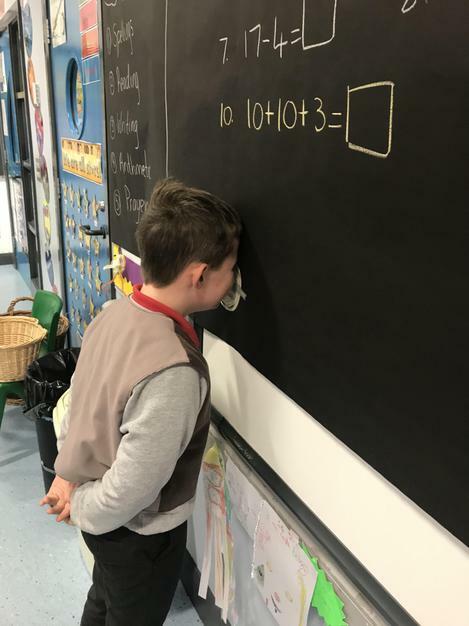 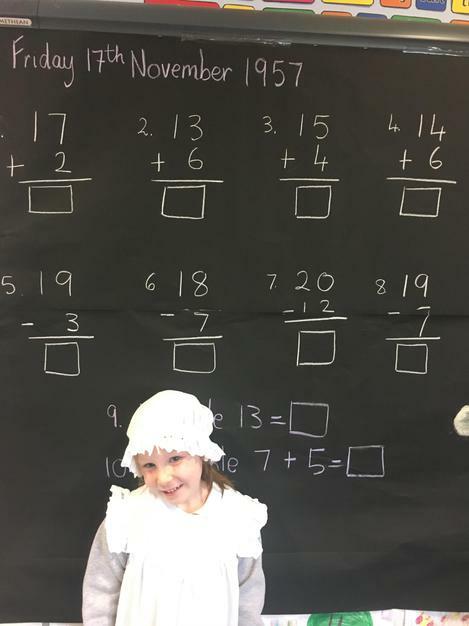 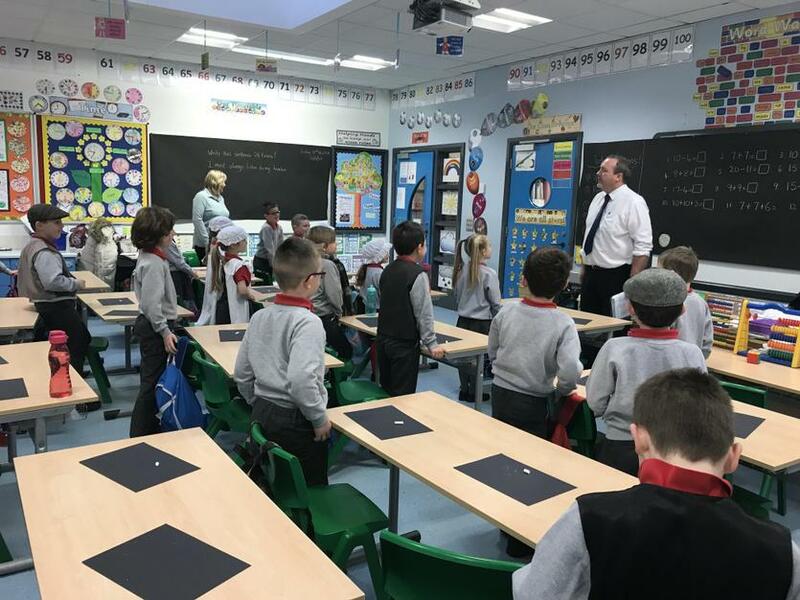 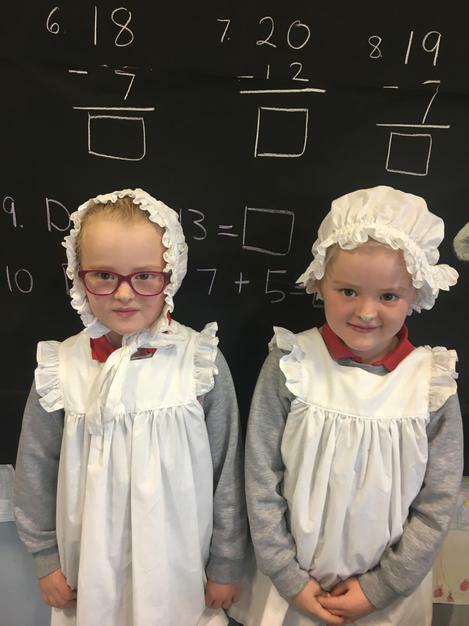 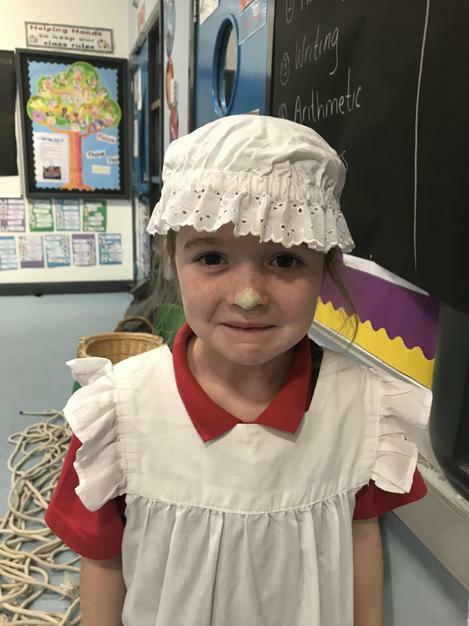 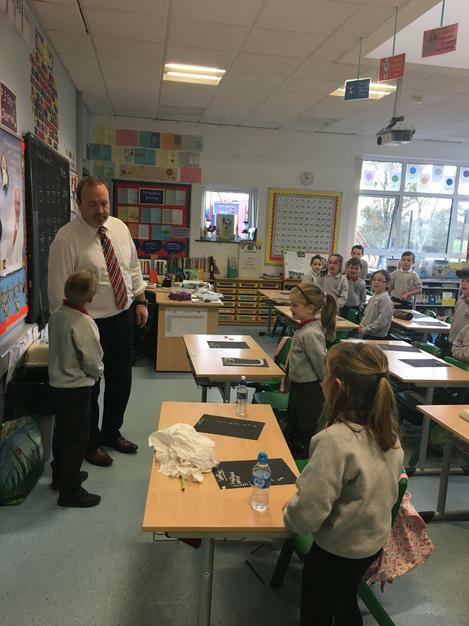 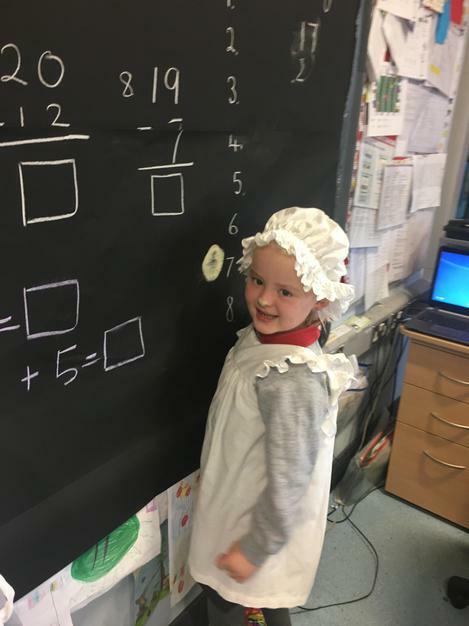 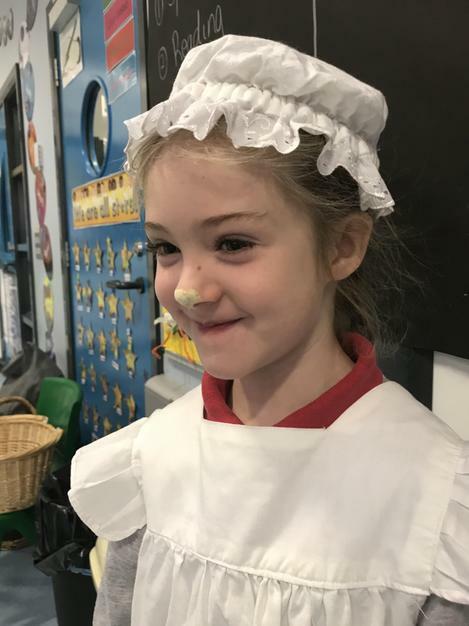 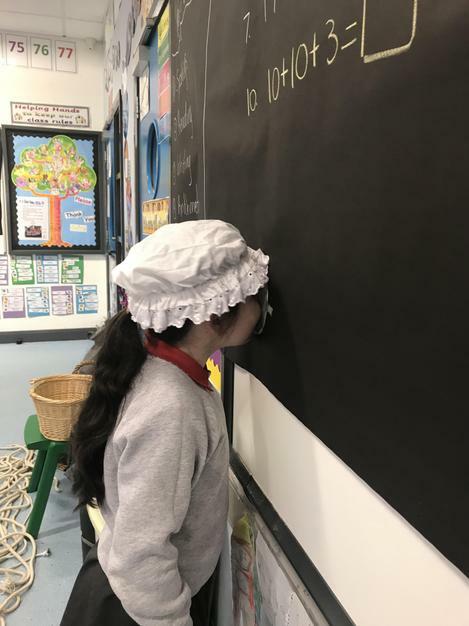 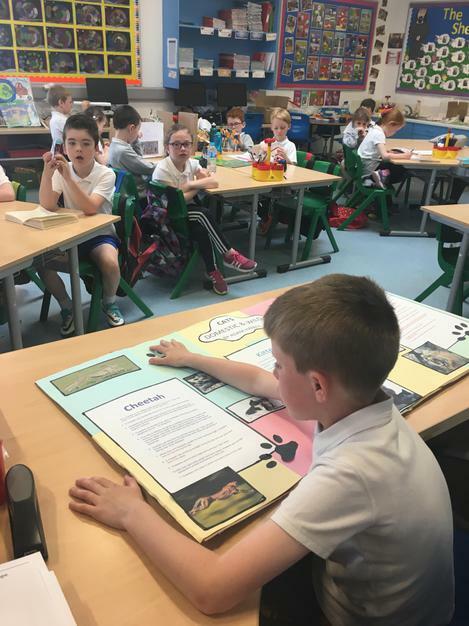 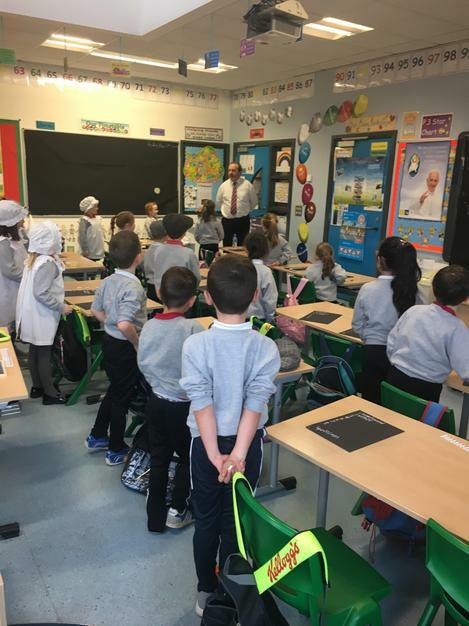 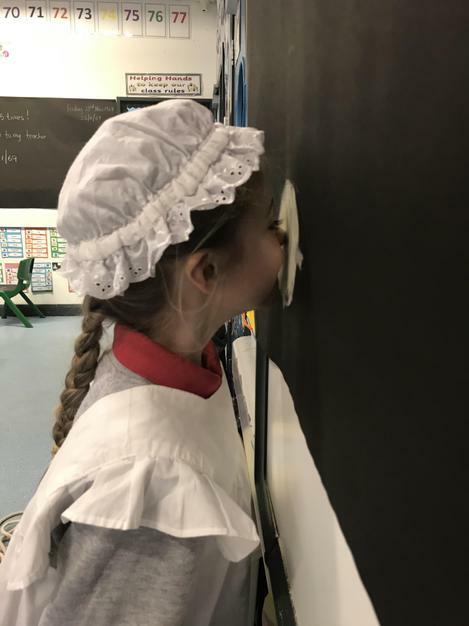 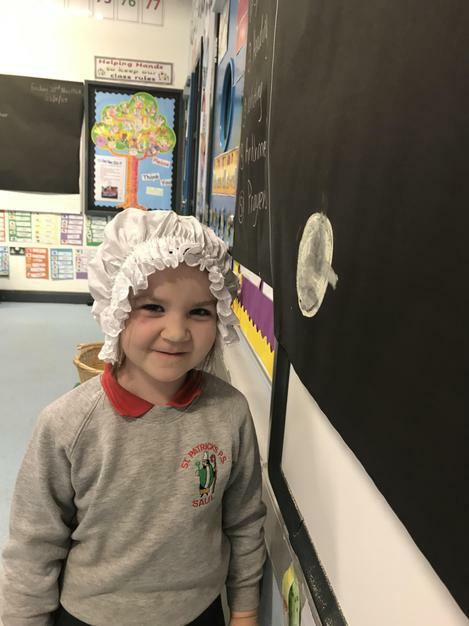 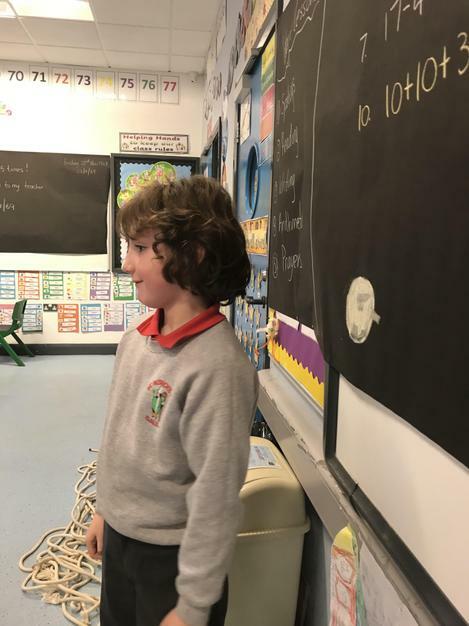 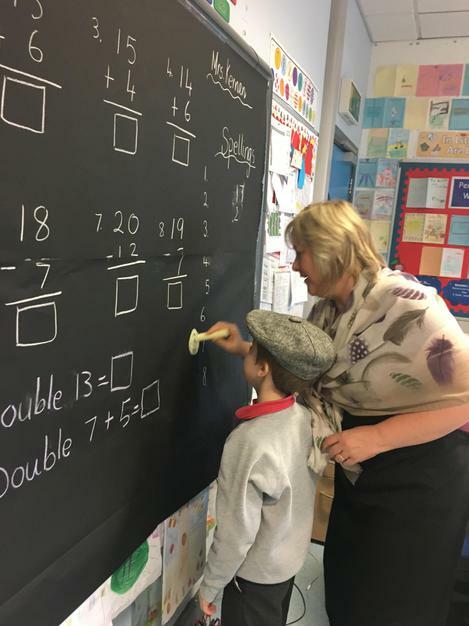 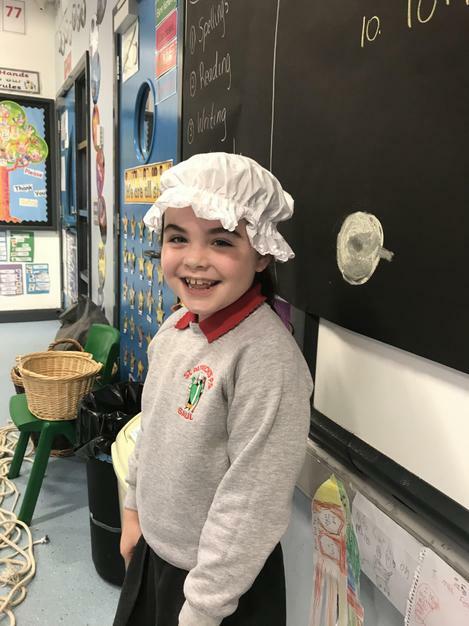 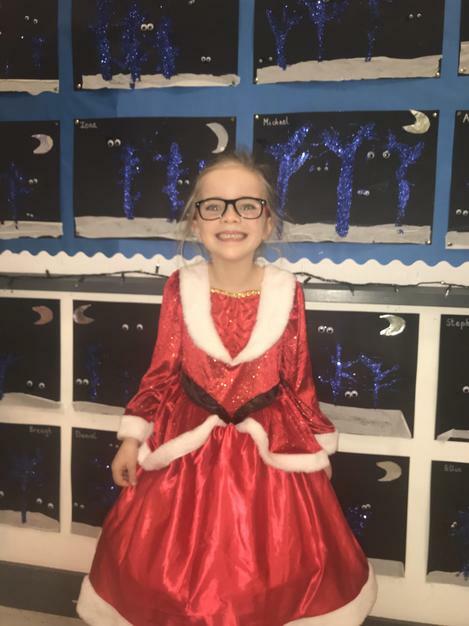 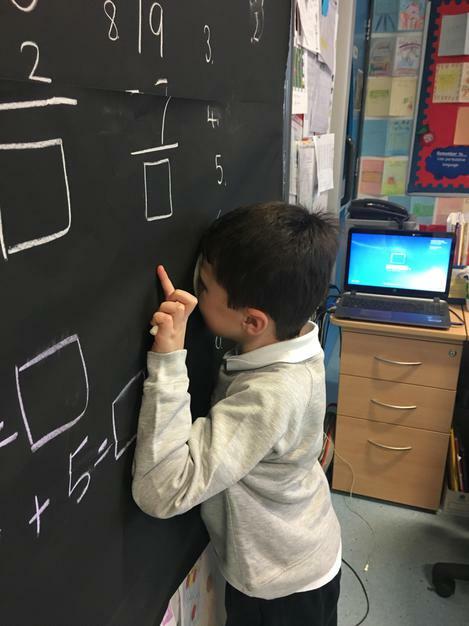 P3s had great fun today when we stepped back in time and turned our classroom in an olden day class. 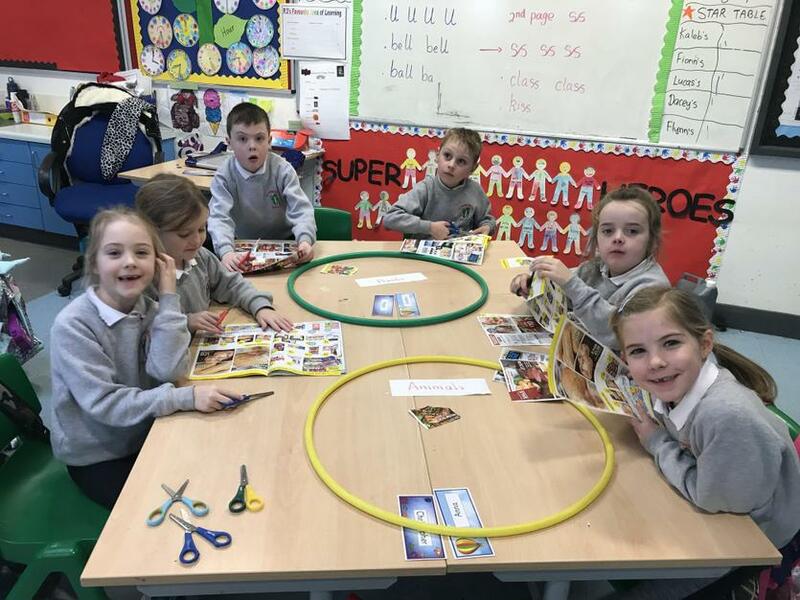 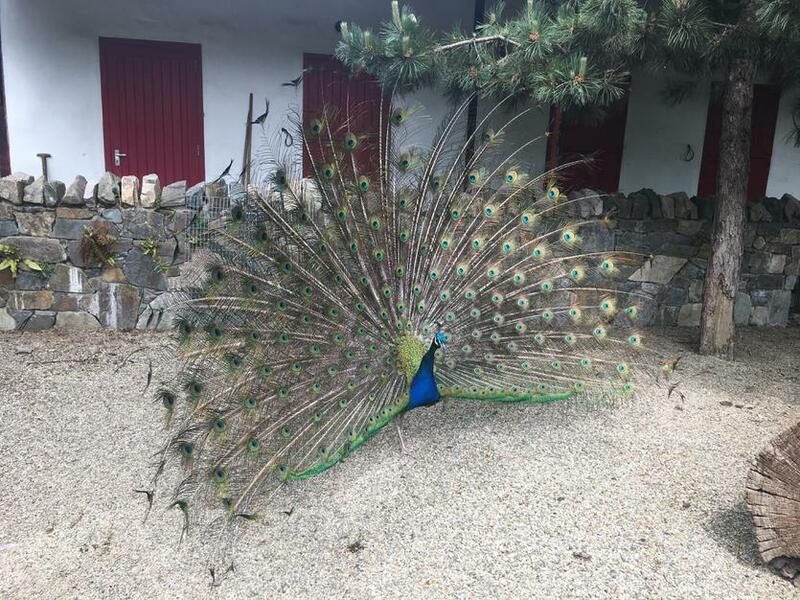 Judging from these pictures it looks like they may prefer it?!! 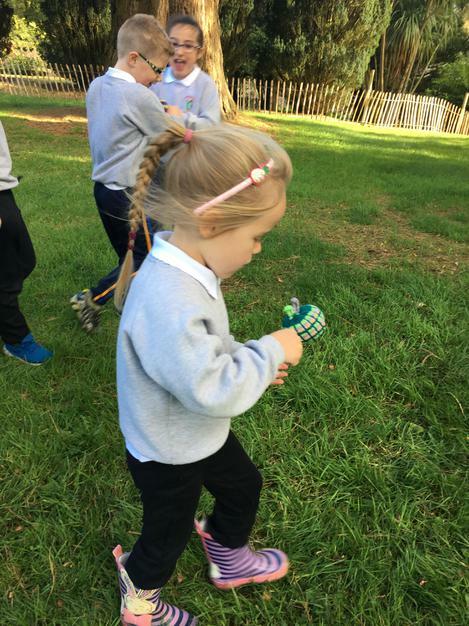 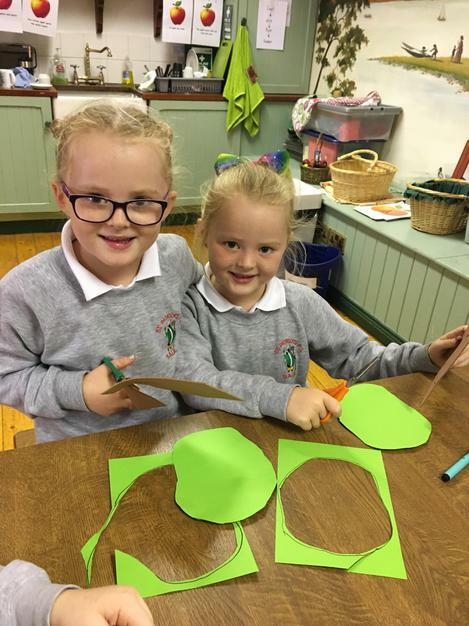 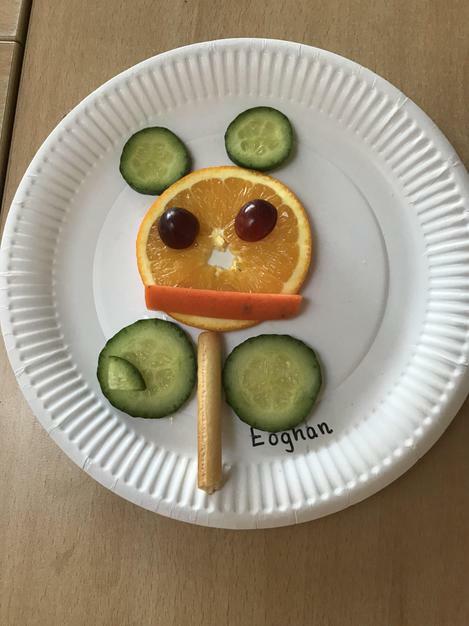 We had good fun making hedgehogs out of leaves. 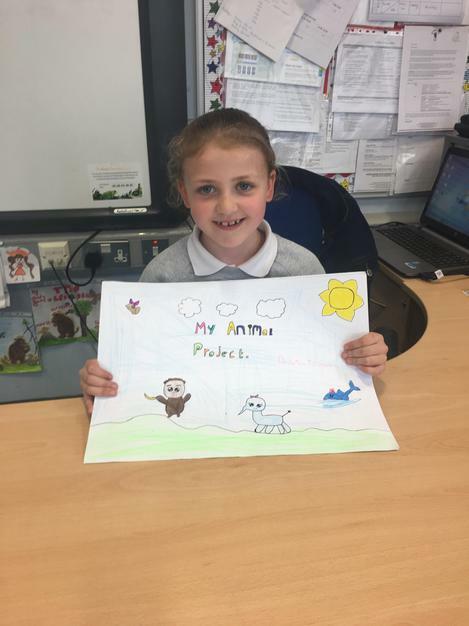 We are learning about persuasive writing so today we re-designed the cover page of our reading books and wrote a new blurb. 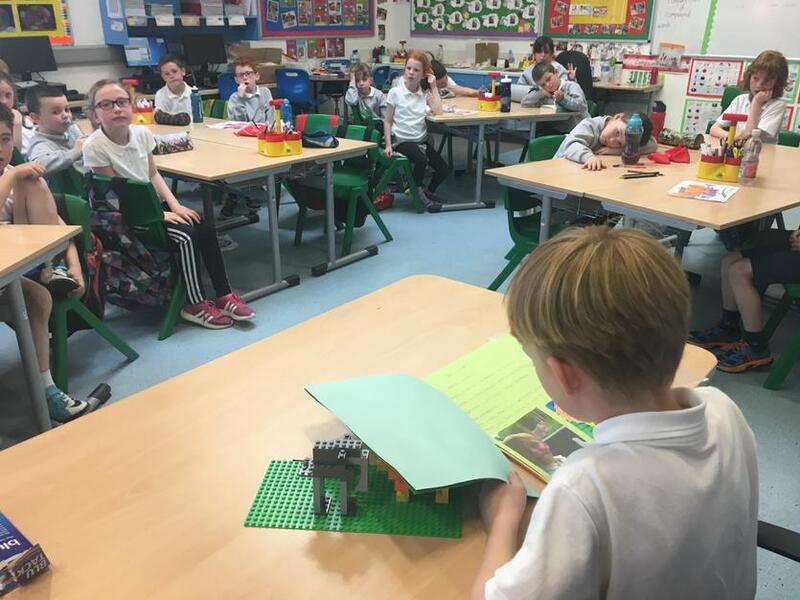 Have we persuaded you to read our books? 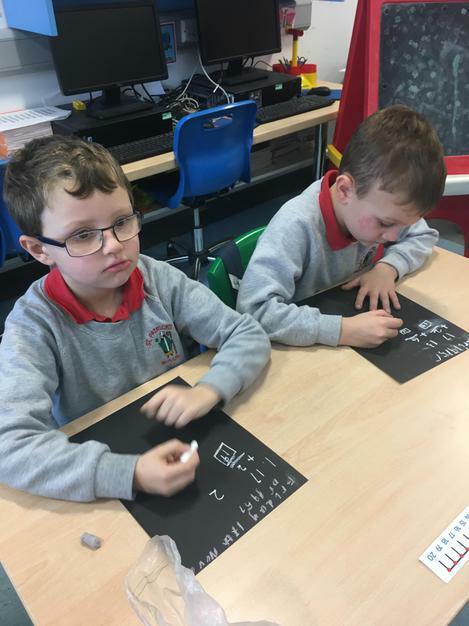 We created some 2D shape posters today in our groups. 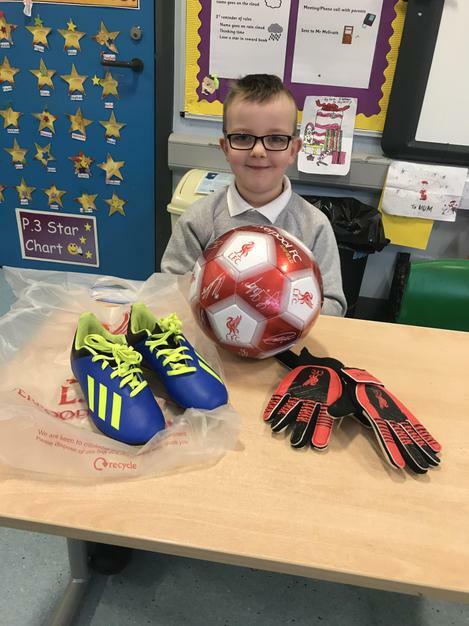 Star pupils today for coach Graham! 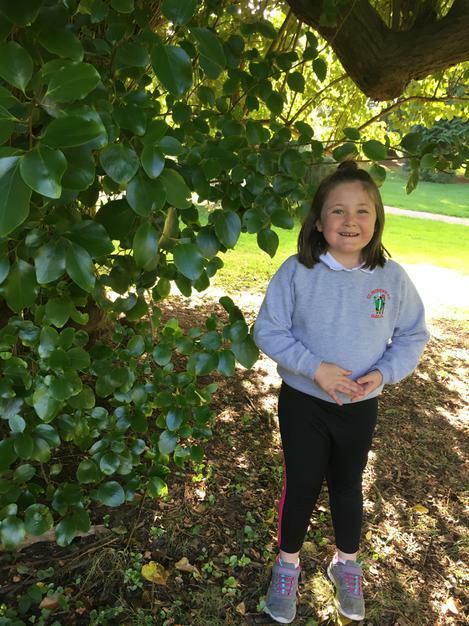 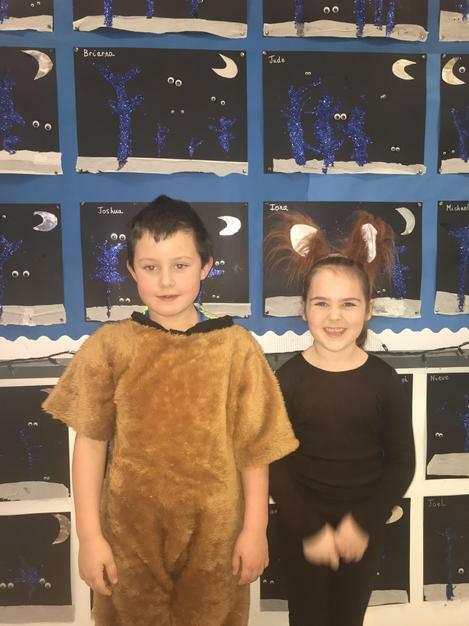 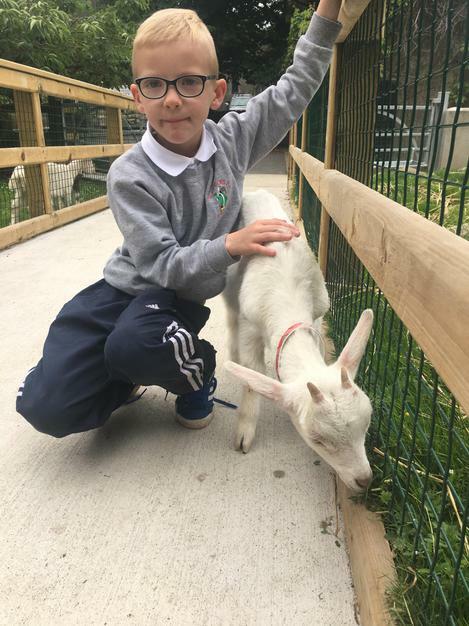 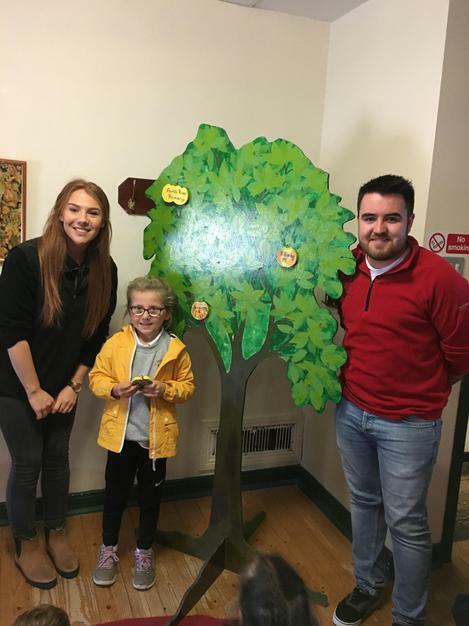 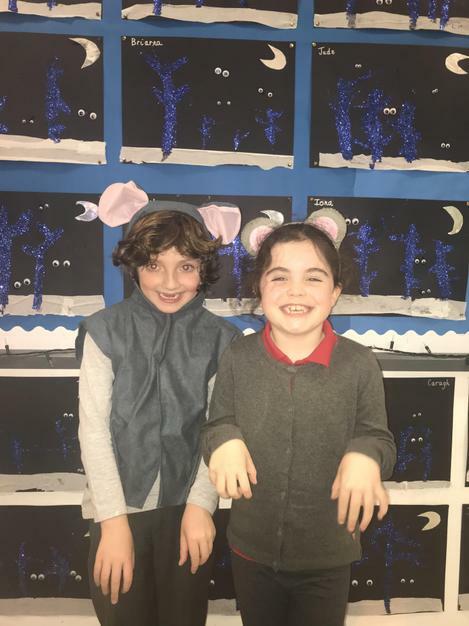 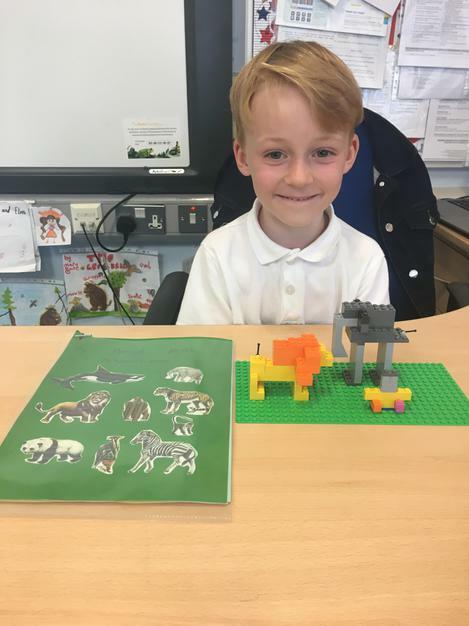 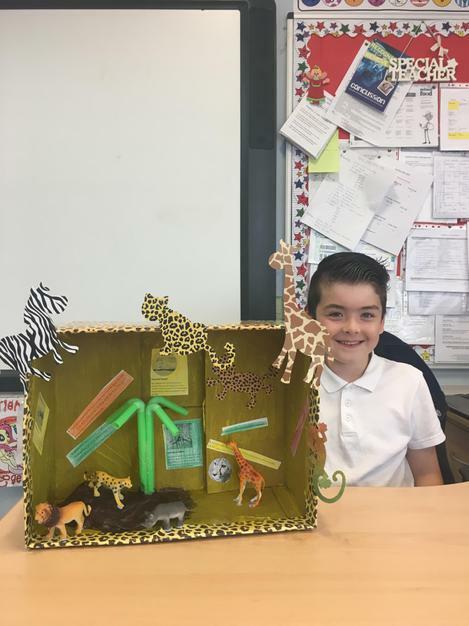 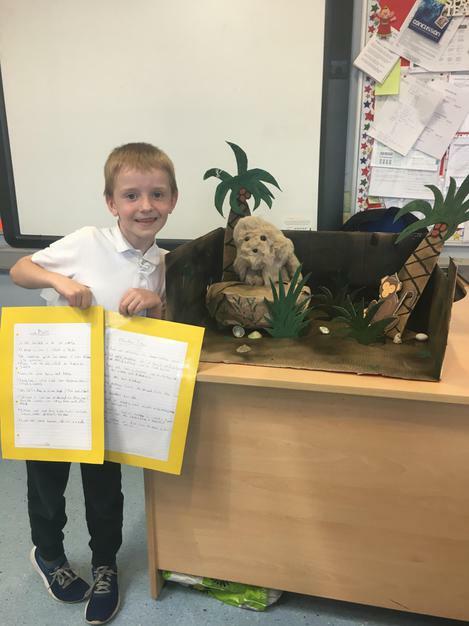 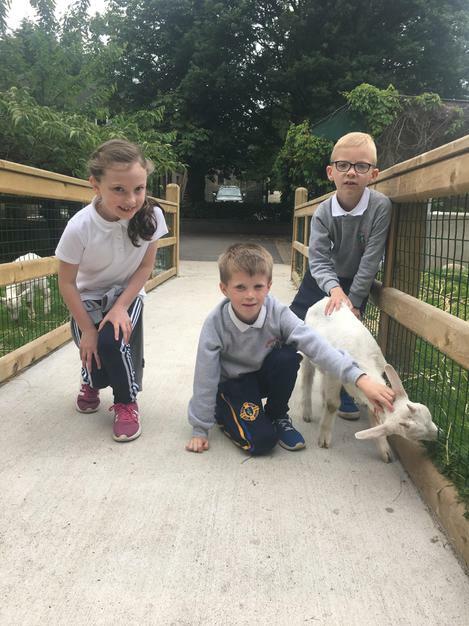 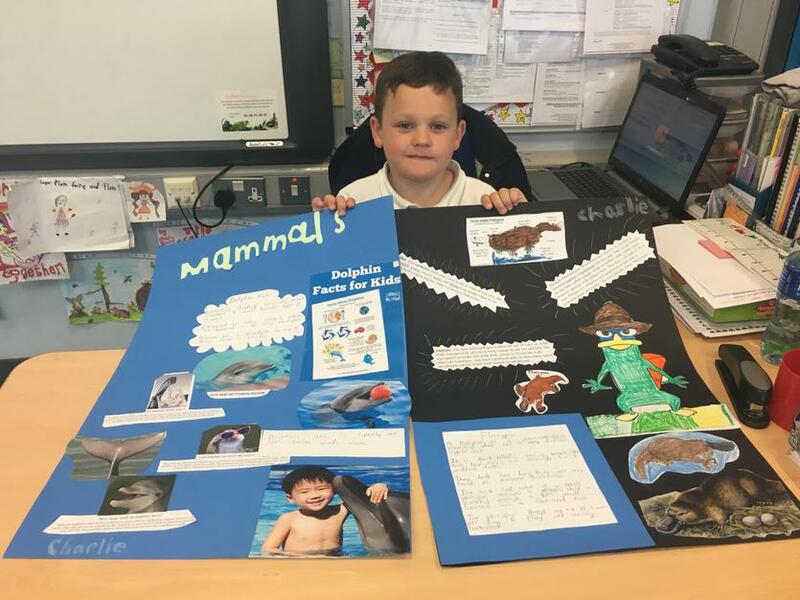 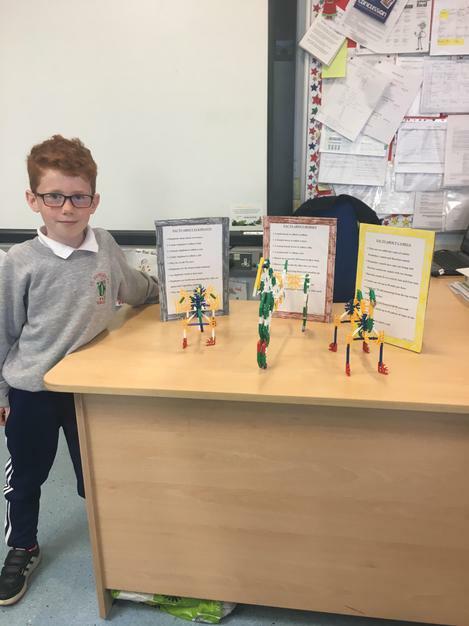 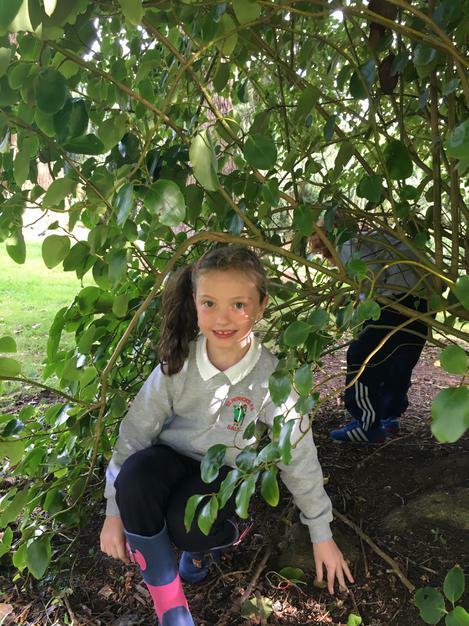 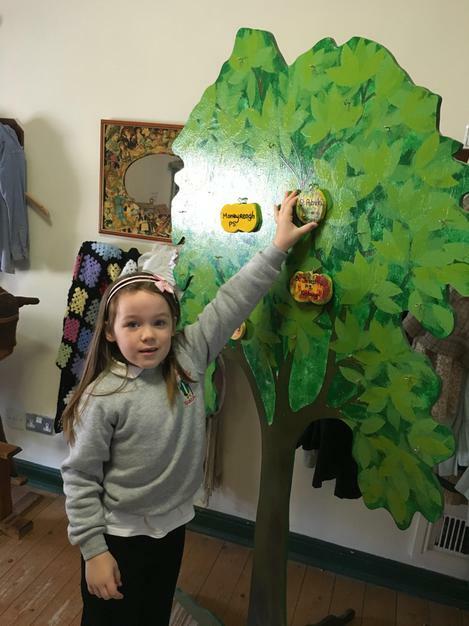 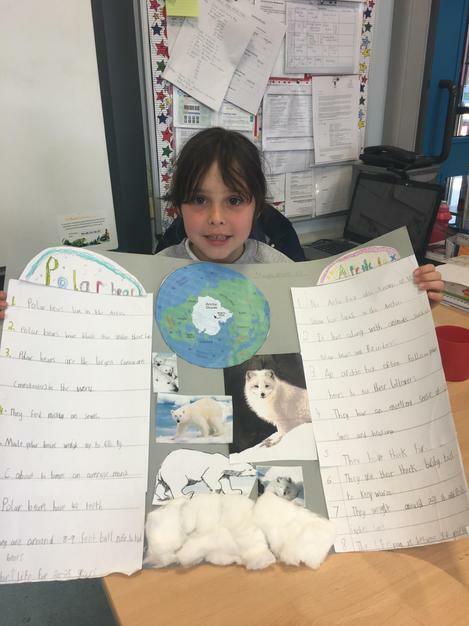 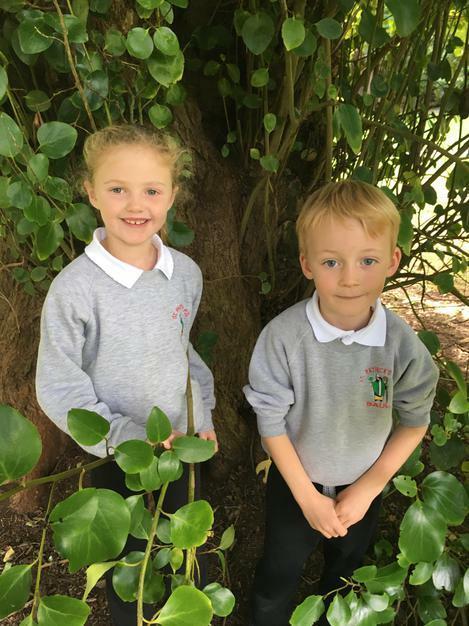 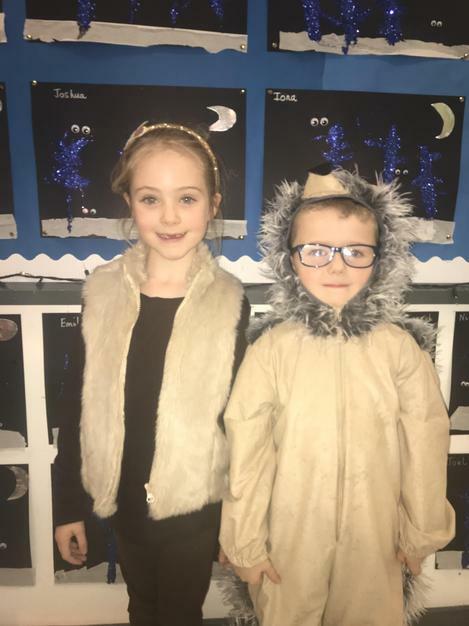 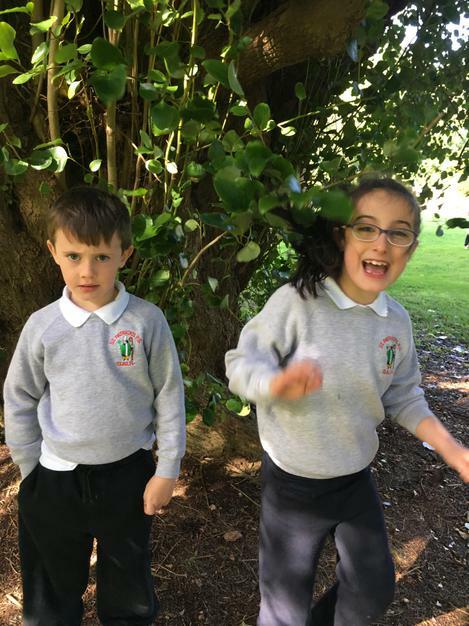 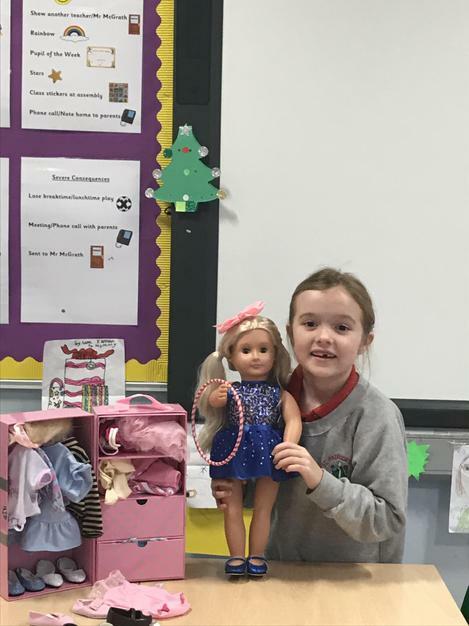 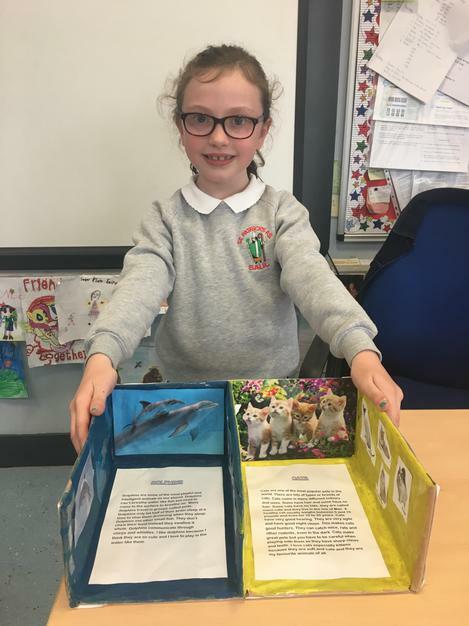 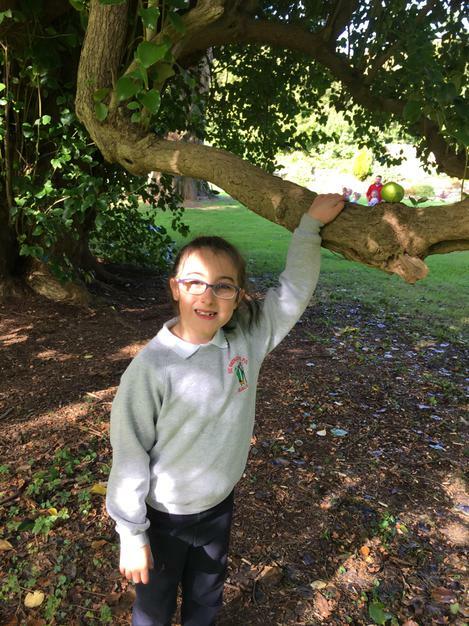 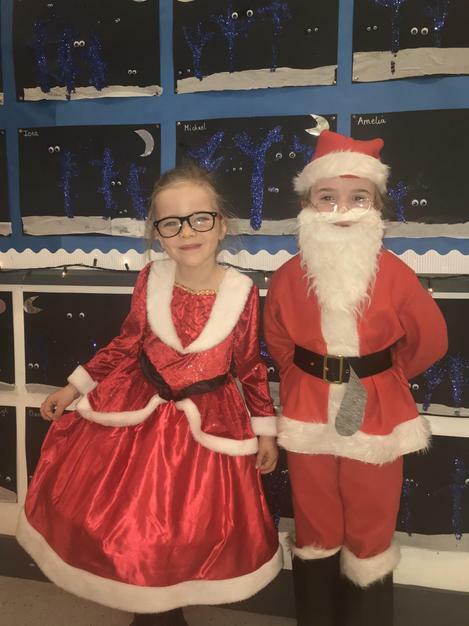 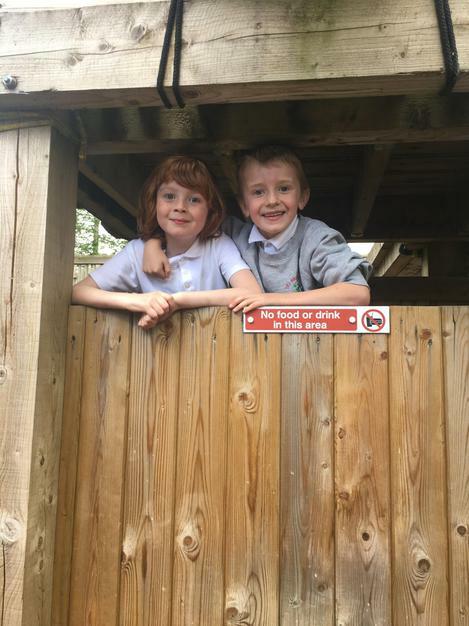 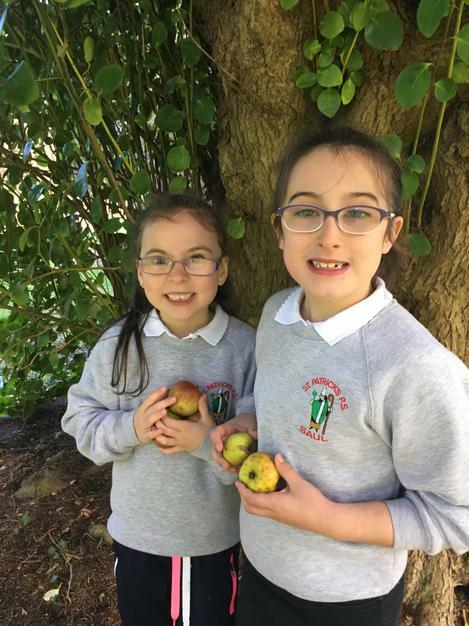 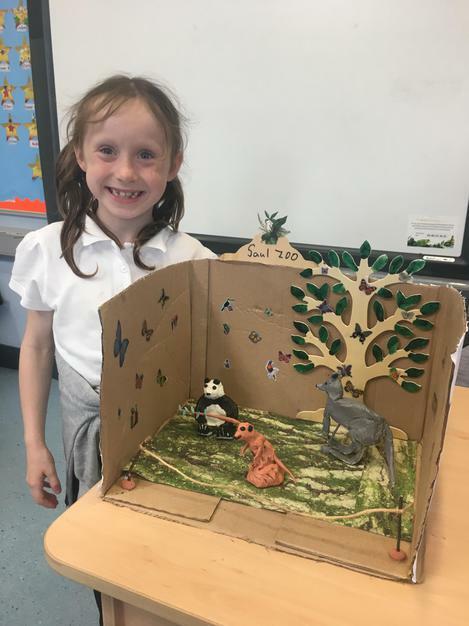 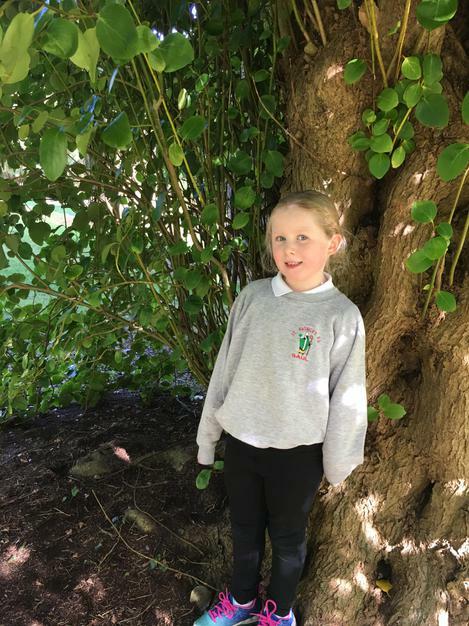 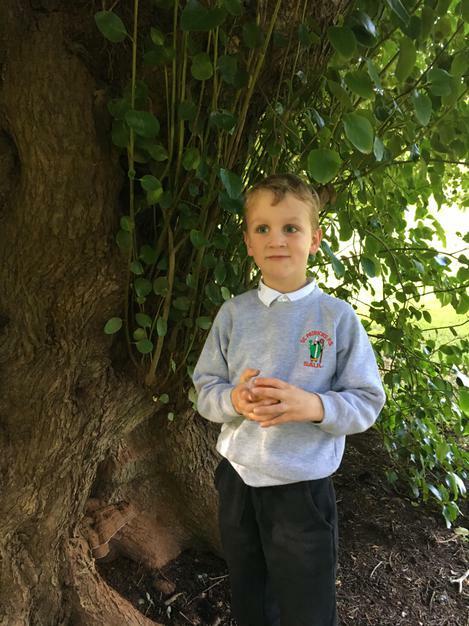 Well done Aodhan and Emma! 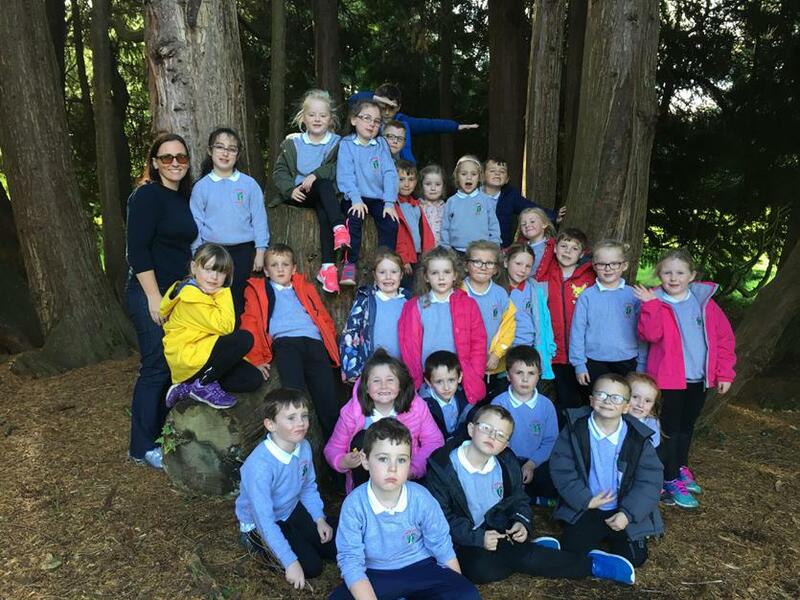 Our picnic on Saul Mountain! 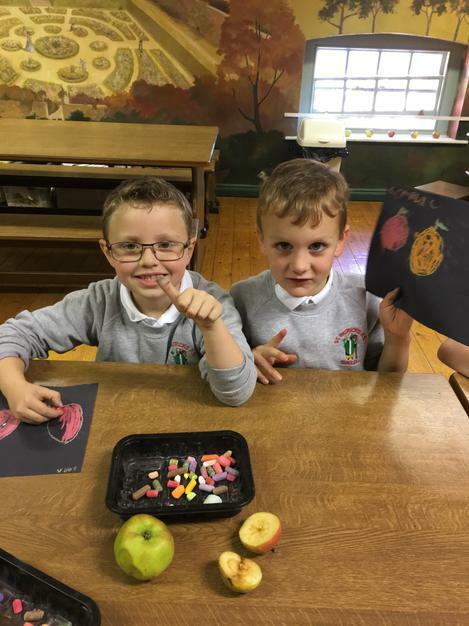 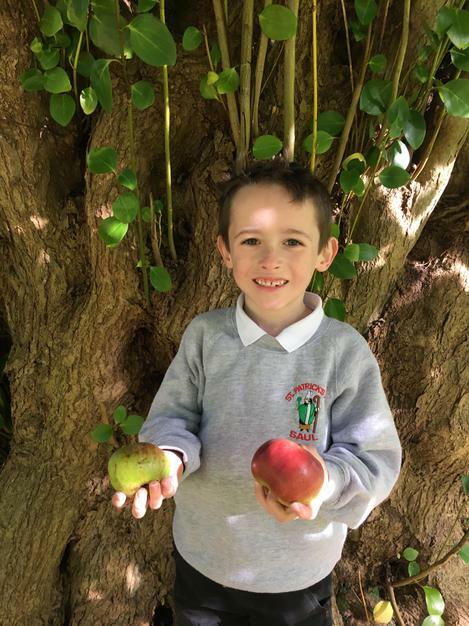 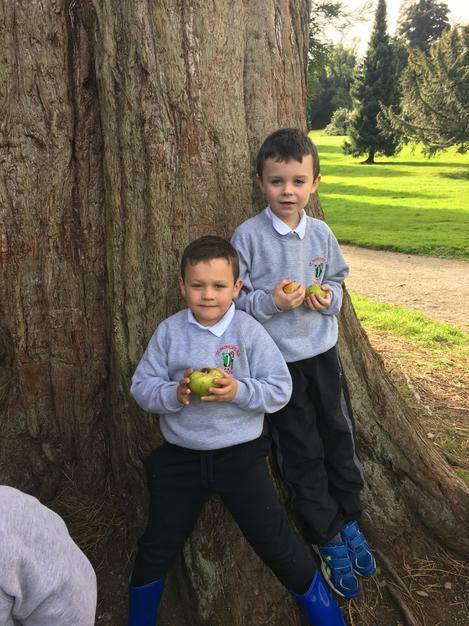 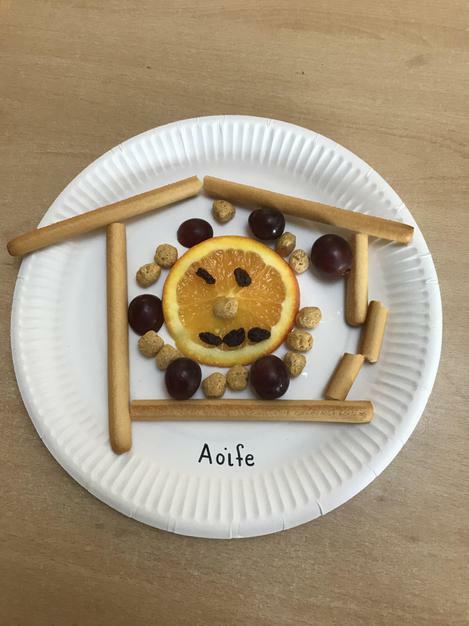 Joshua and Ugne have been busy at home making and baking! 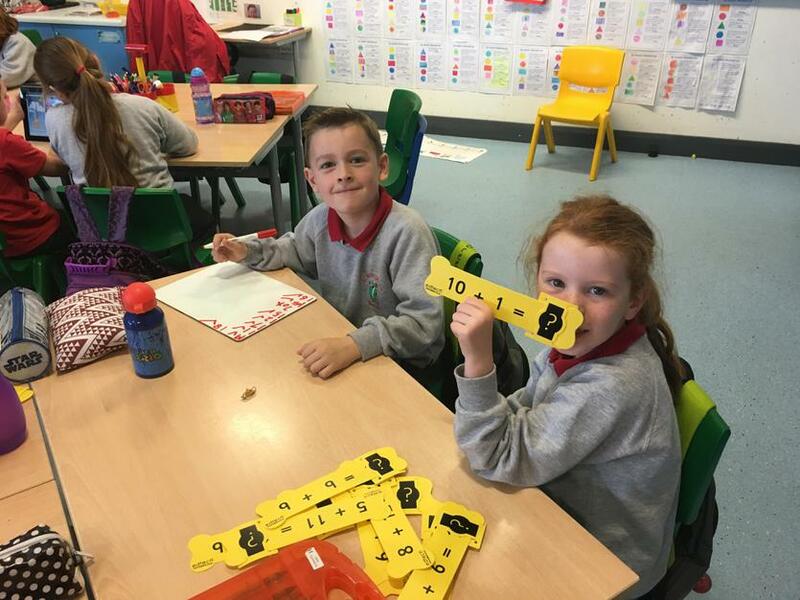 Learning about tens and units today. 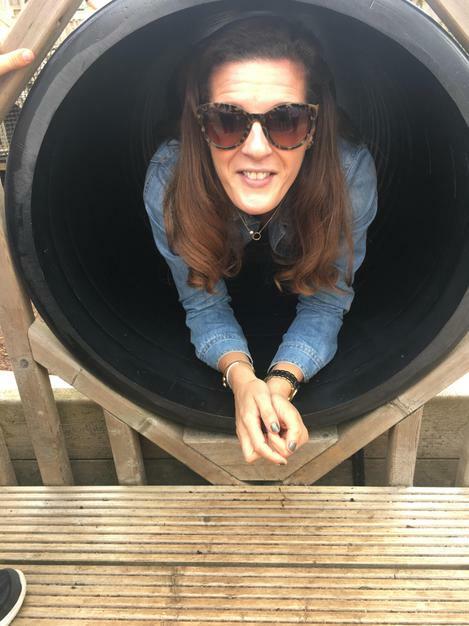 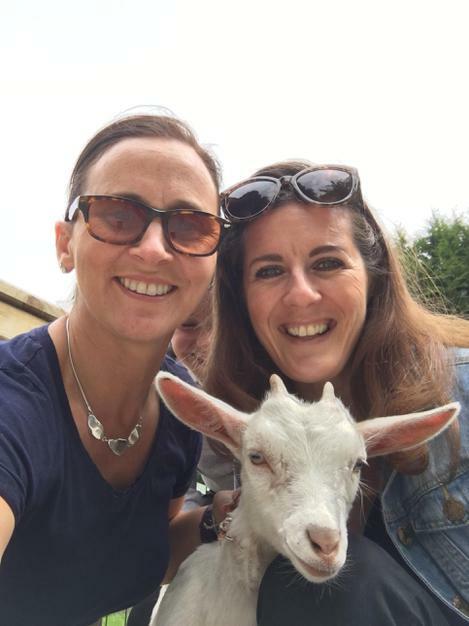 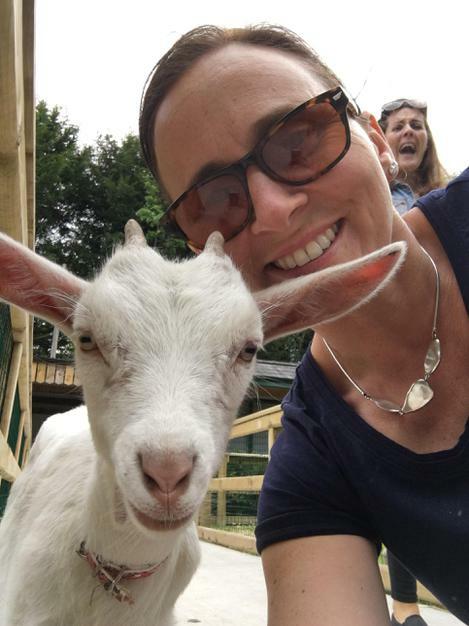 Happy birthday Ugne- have a great weekend! 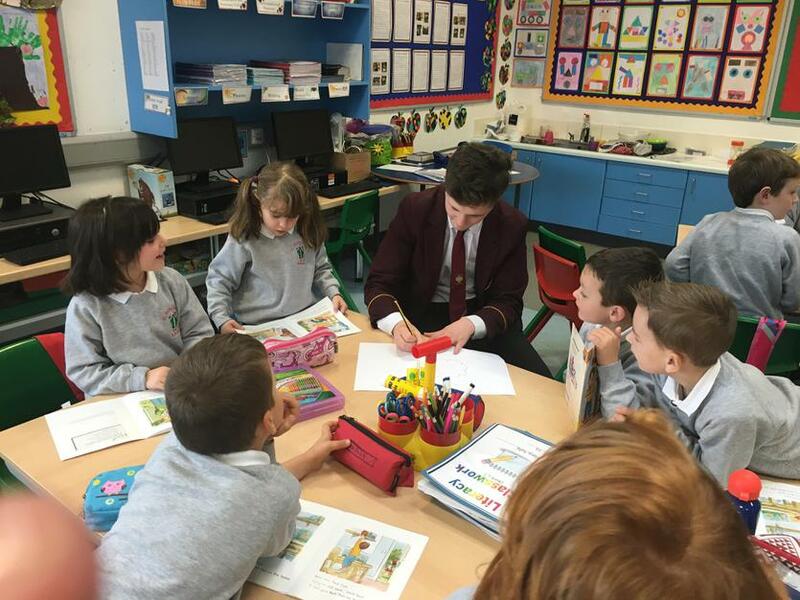 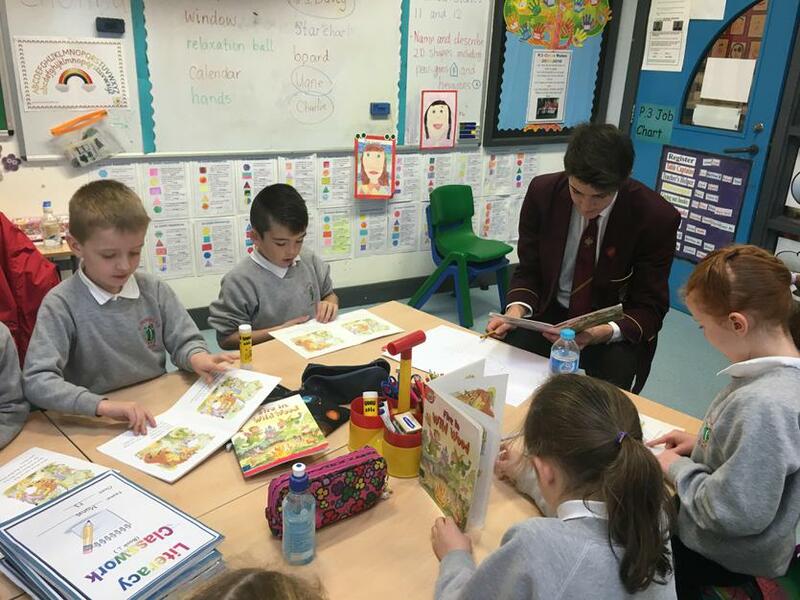 "Reading Time" with a little help from Red High students- Daniel, Conor and Adam! 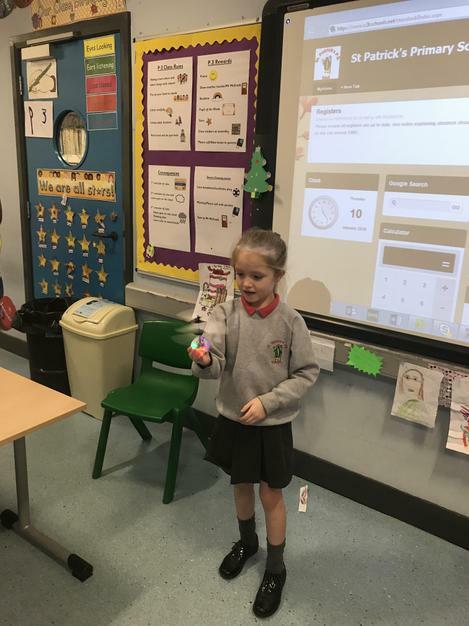 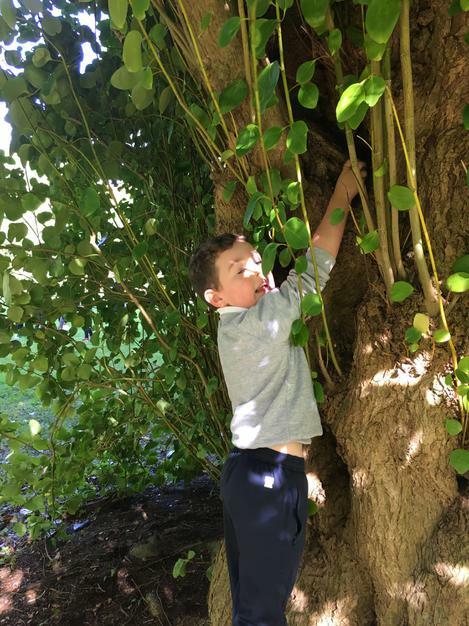 We even had a noun hunt competition today! 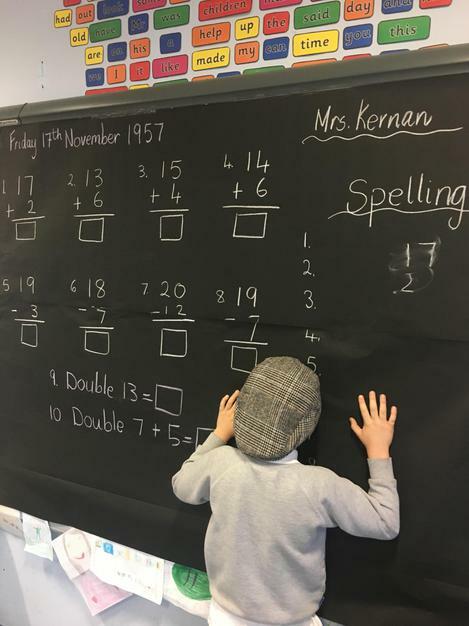 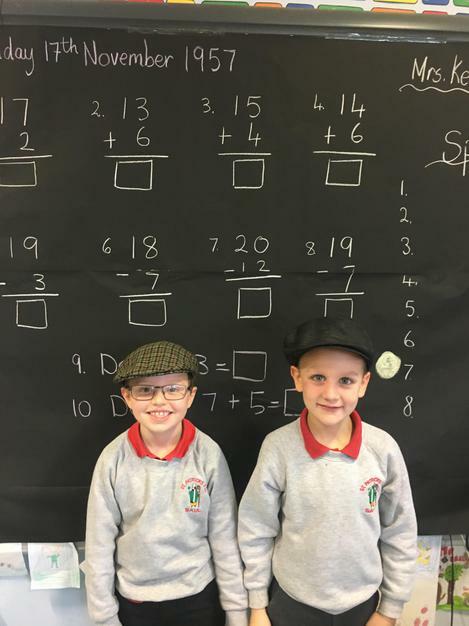 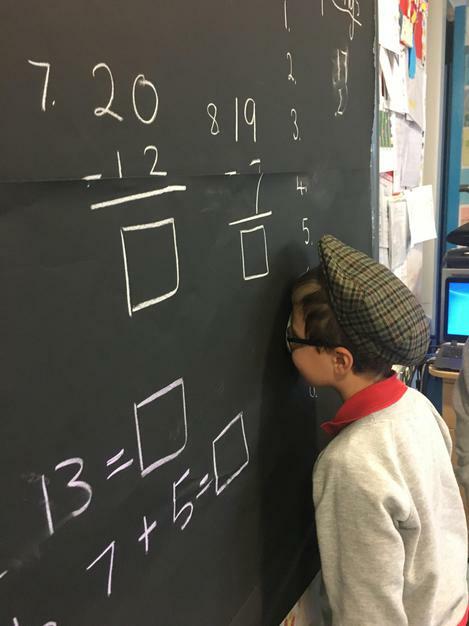 Last Friday the P.3's went back in time to 1965! 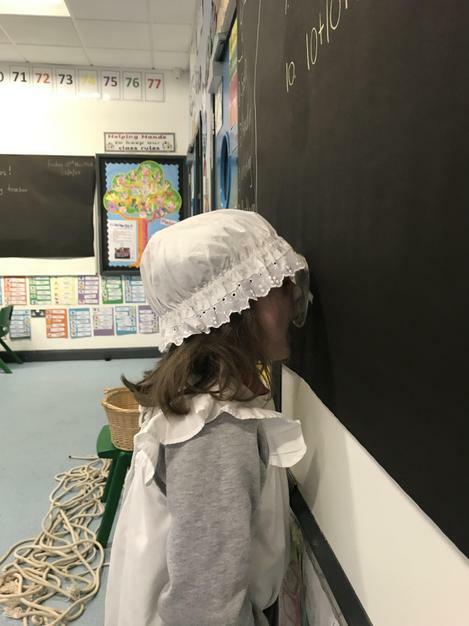 School was a lot different then as you'll see from our photos. 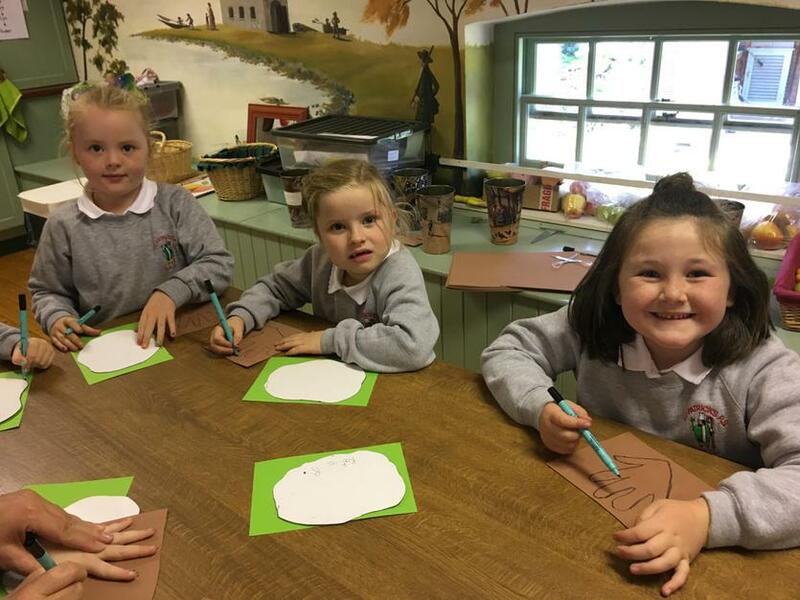 Thanks to all the Grandparents and relatives who took the time to fill in our questionnaires. 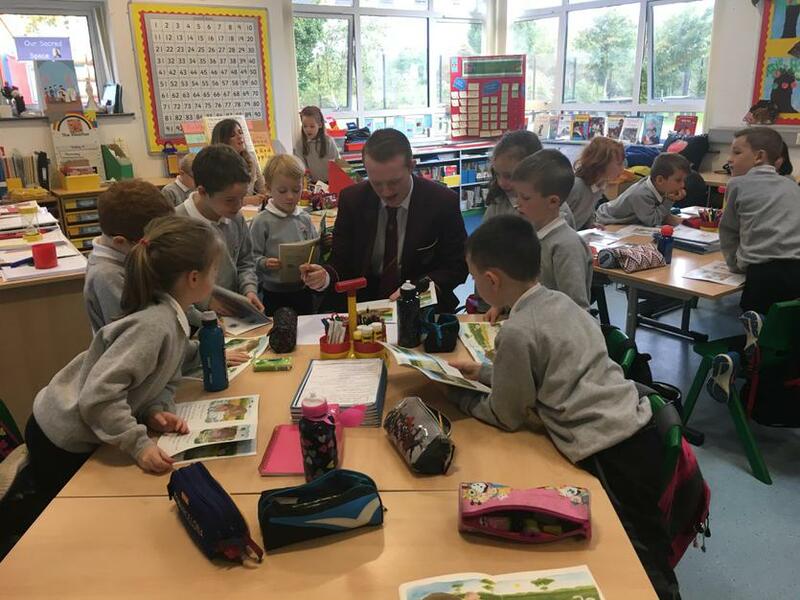 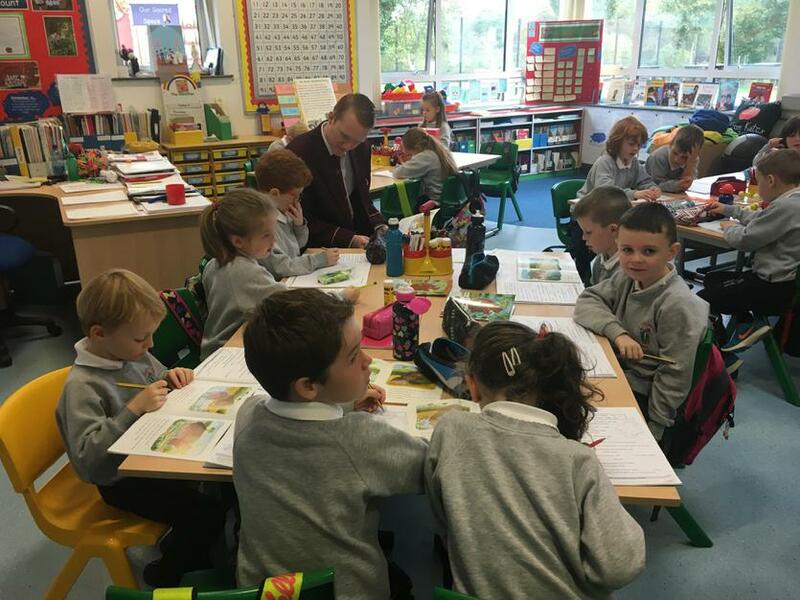 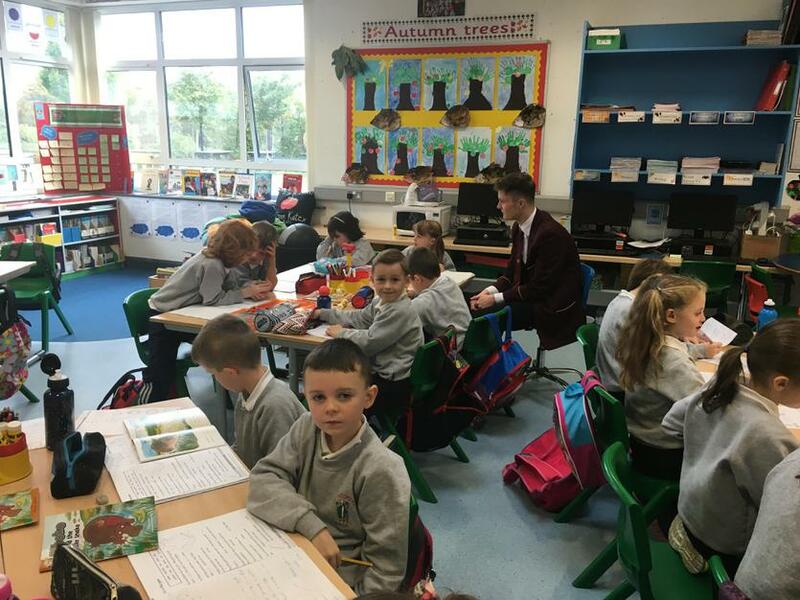 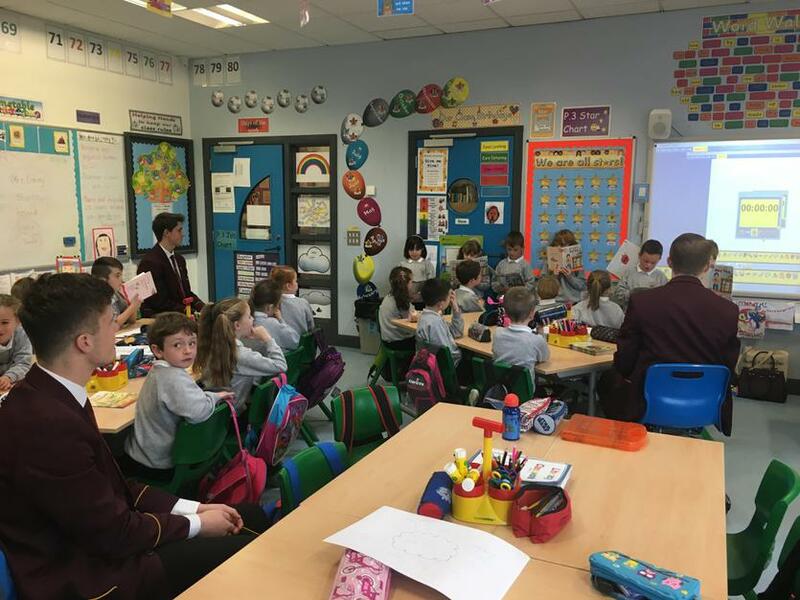 P.3 are enjoying having Ryan, Glen and Michael from the Red High every Wednesday to help with reading. 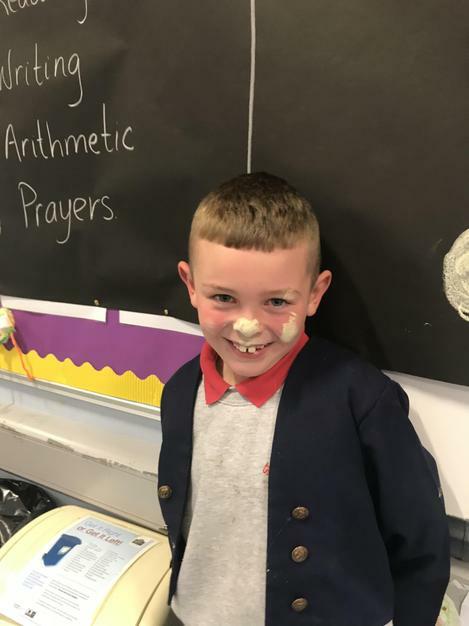 The Great Saul Bake Off! 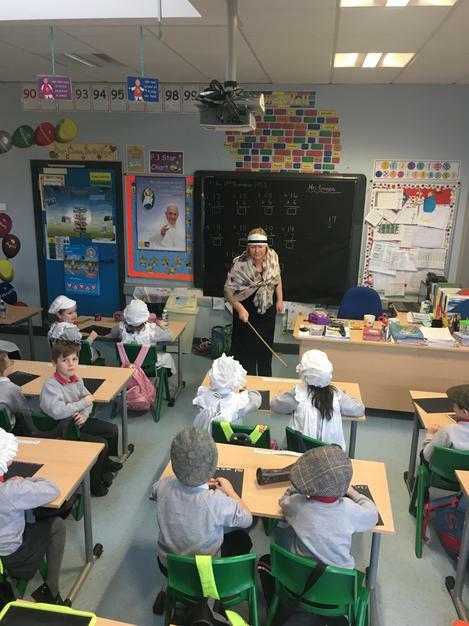 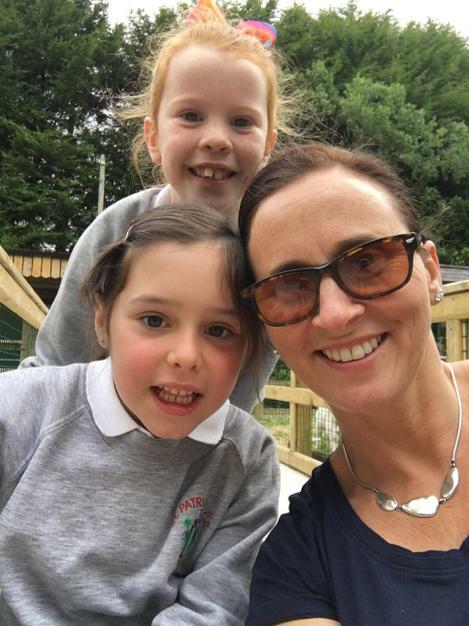 with a little help from our very own Mary Berry-Mrs. Mullan!